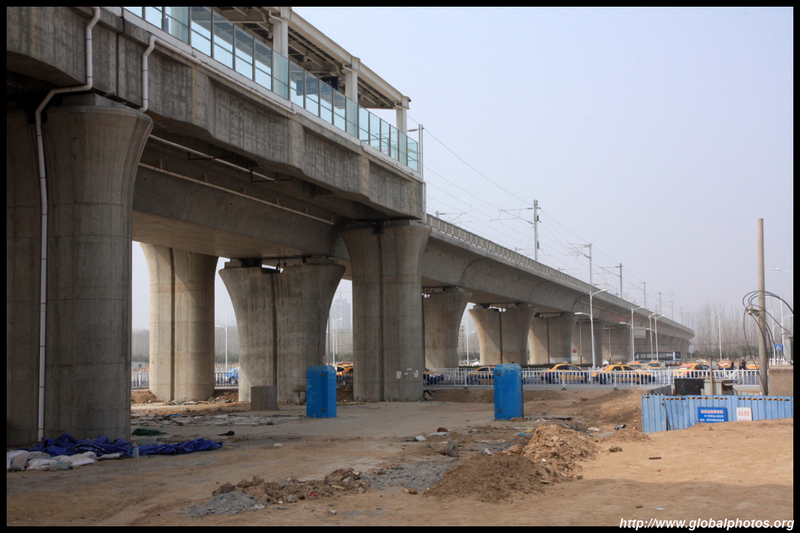 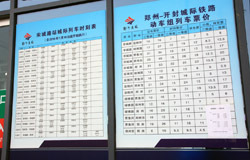 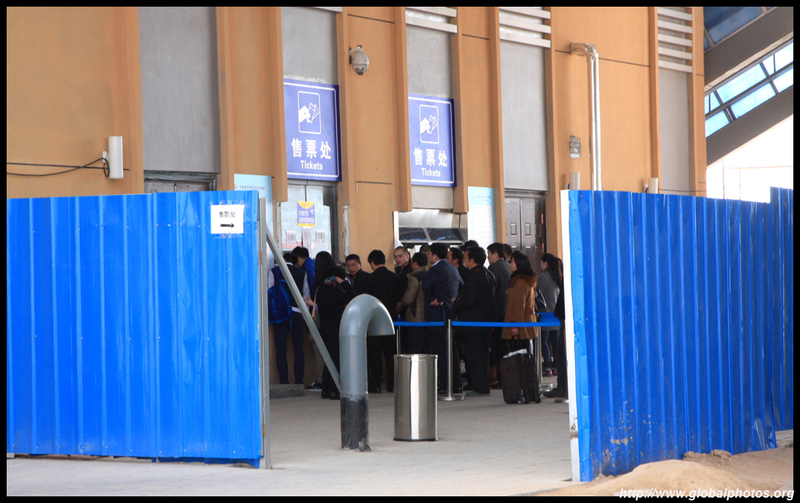 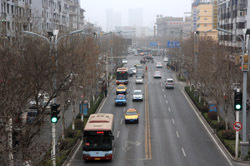 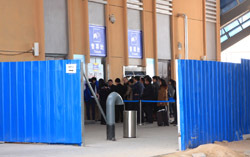 The opening of a new high-speed intercity rail line between Zhengzhou East and Kaifeng now makes a half day trip very feasible. 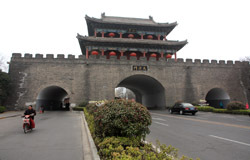 Although this city was an ancient capital, not much of it actually survived to today, which is quite disappointing so 4-5 hours here would probably suffice. 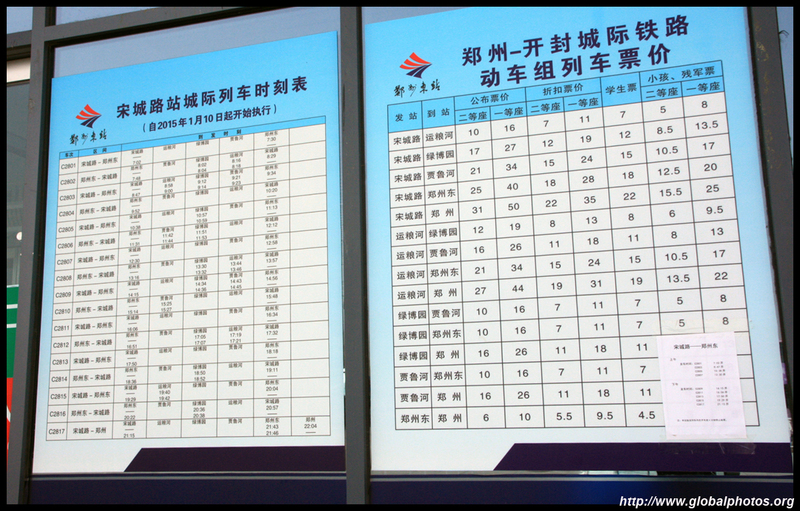 Watch the time very carefully since the train frequencies are abysmal. 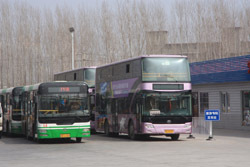 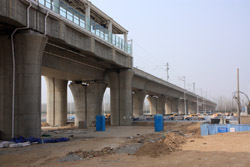 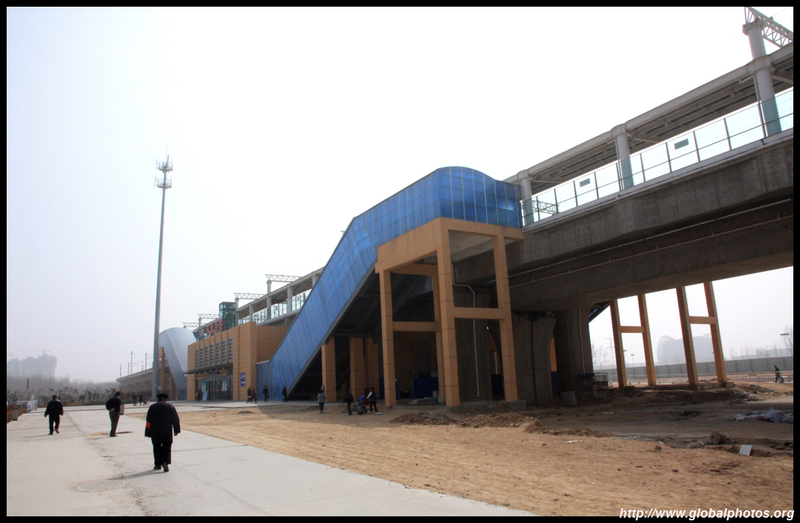 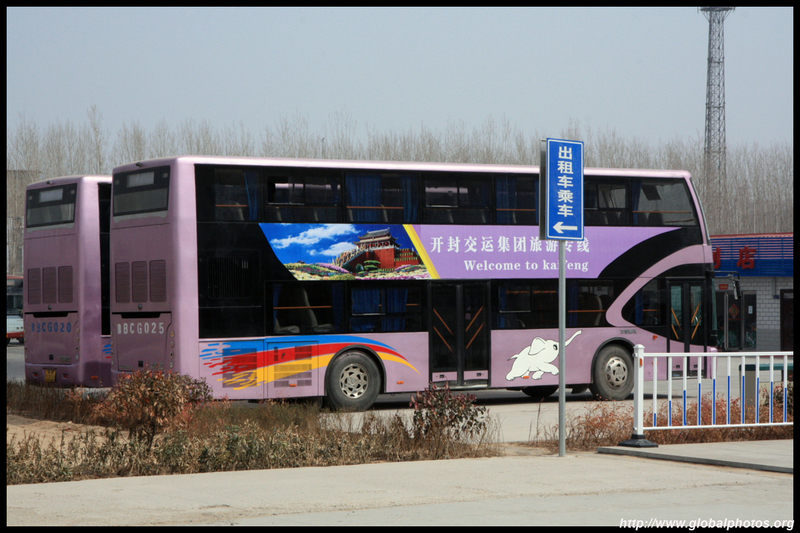 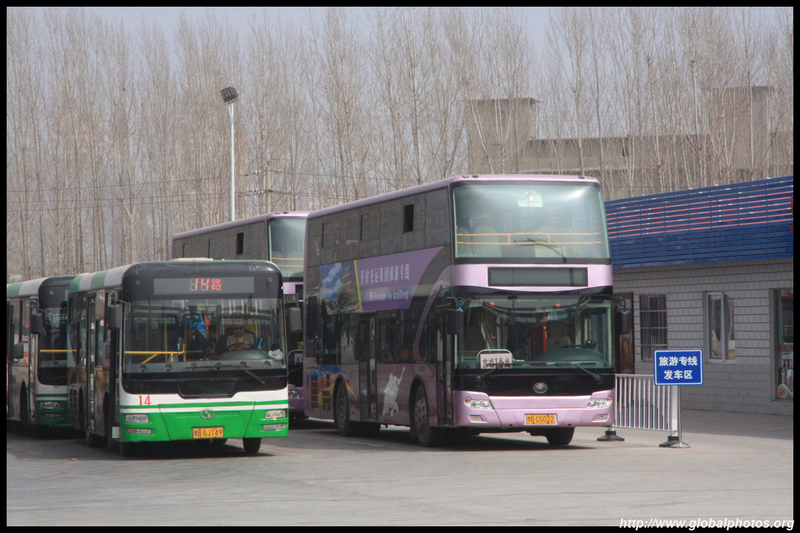 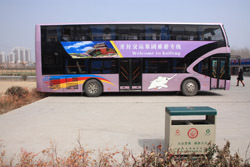 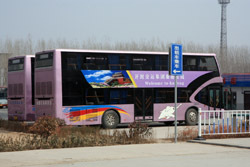 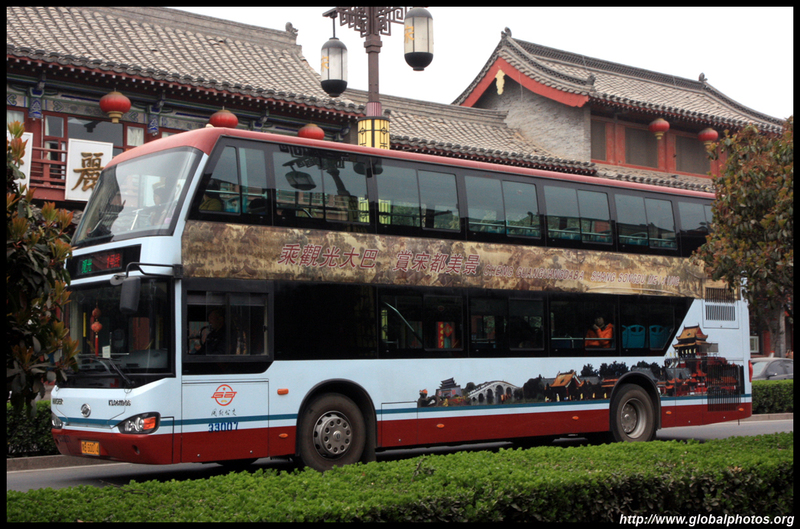 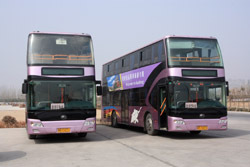 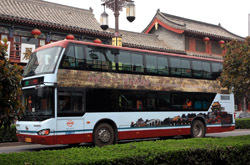 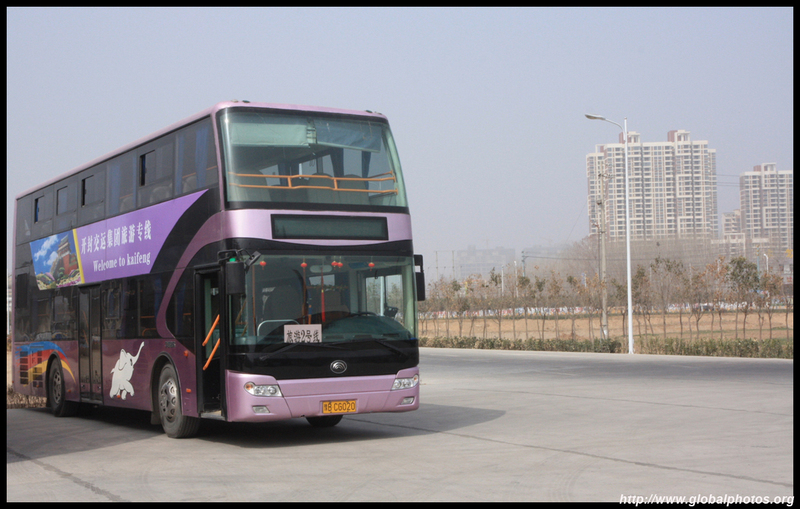 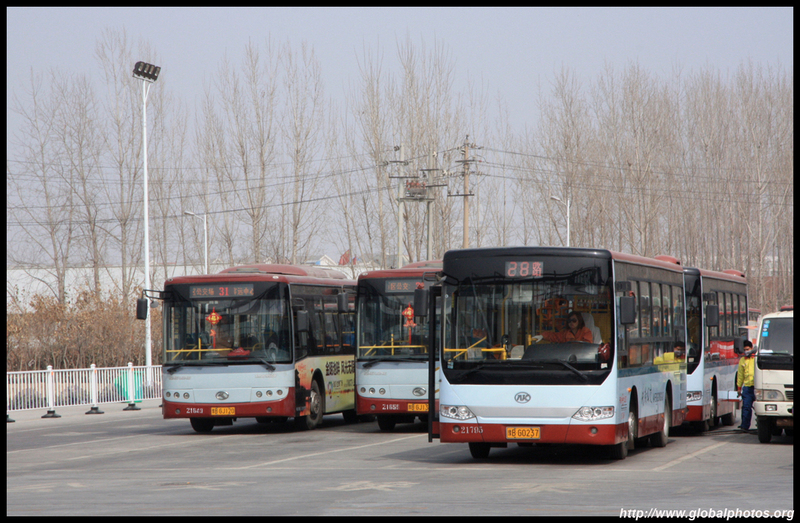 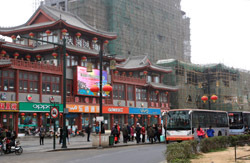 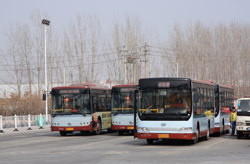 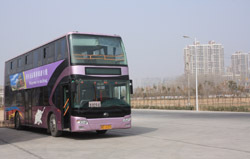 The new station is located in the outskirts, but there are tourist buses available here and also local buses that take 20 minutes to reach Daliang Gate. 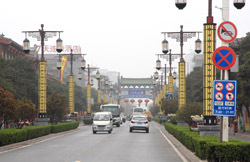 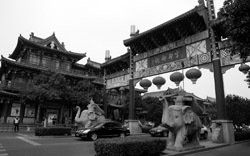 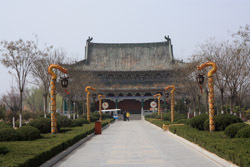 Daliang Gate was rebuilt in the 1980's. 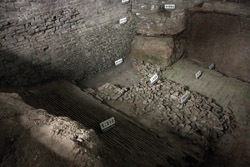 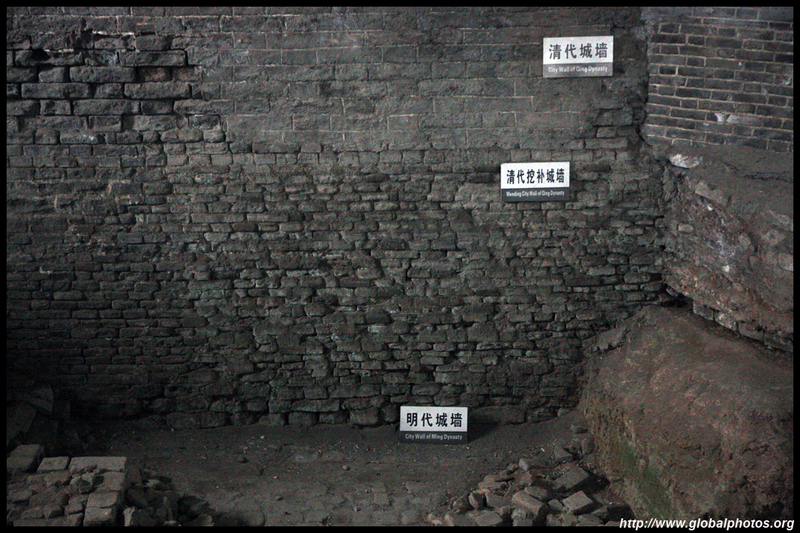 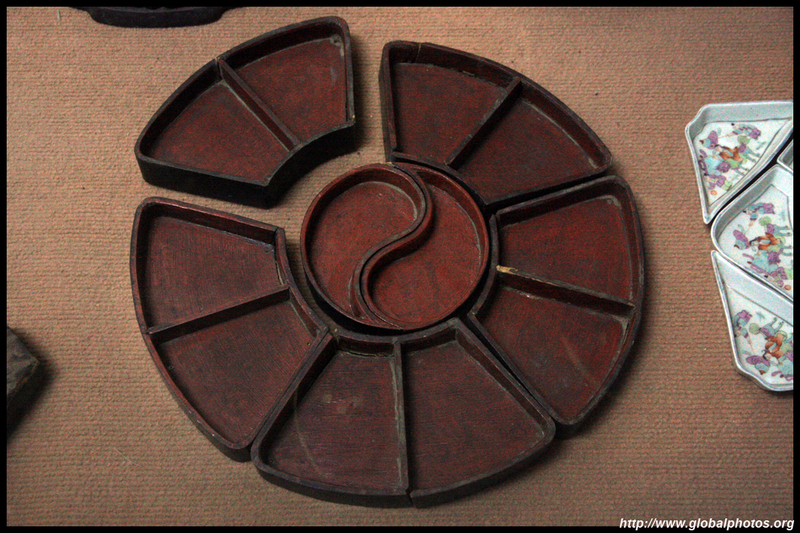 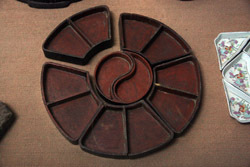 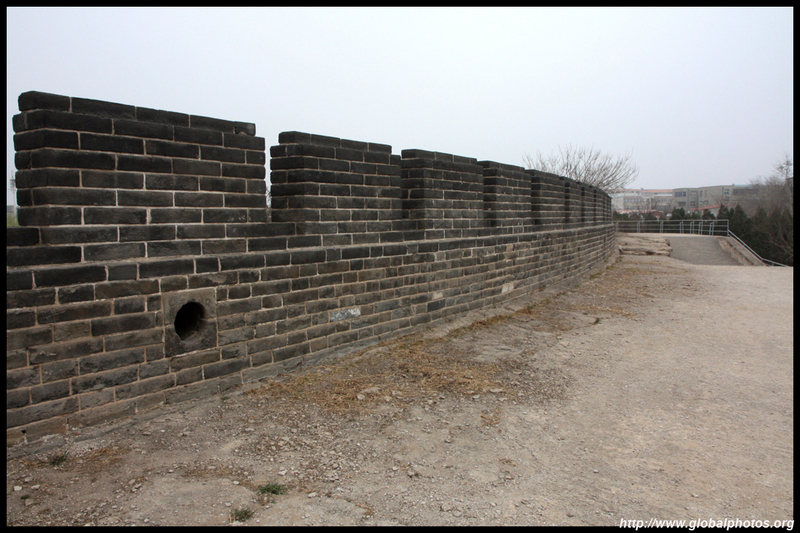 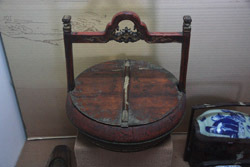 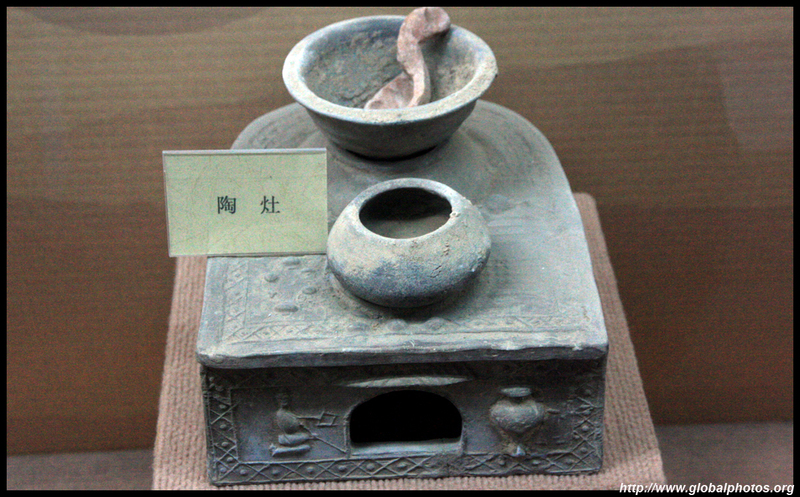 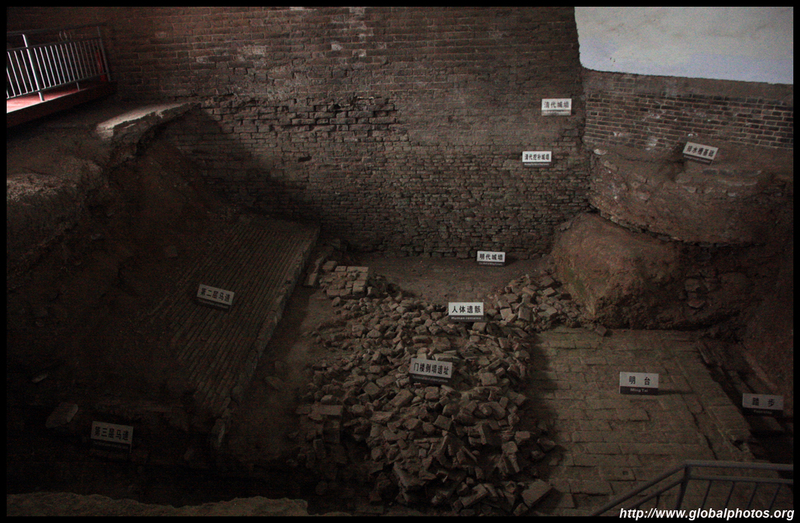 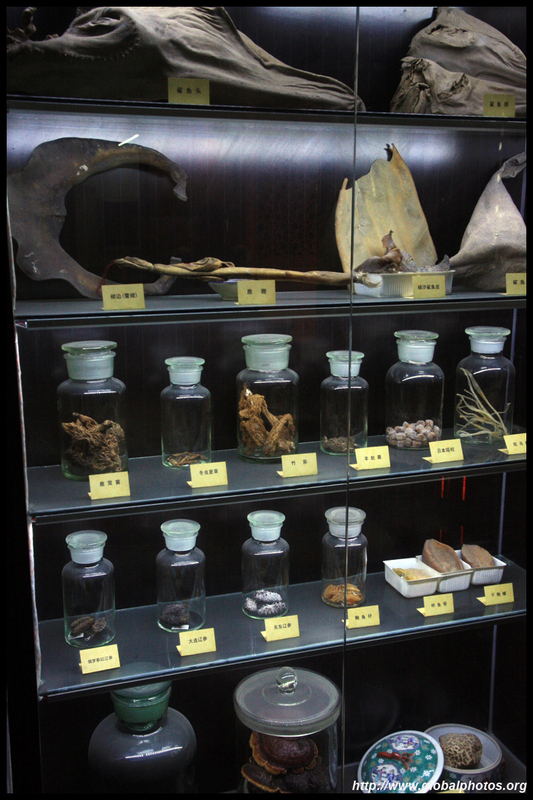 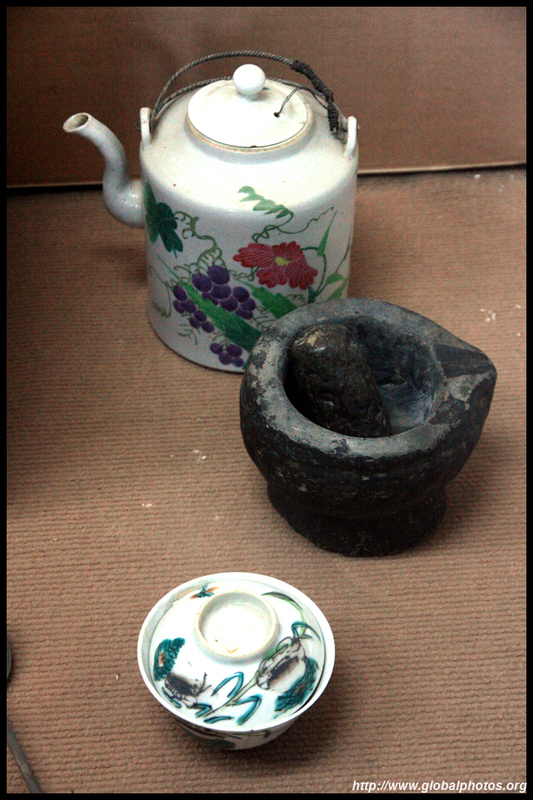 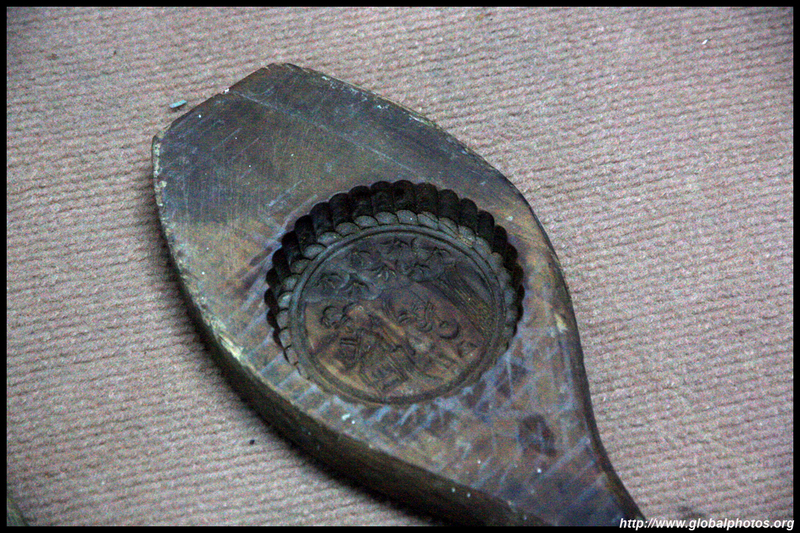 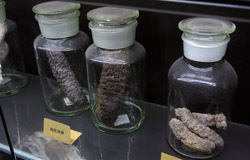 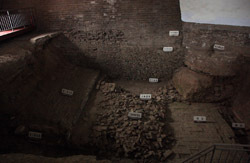 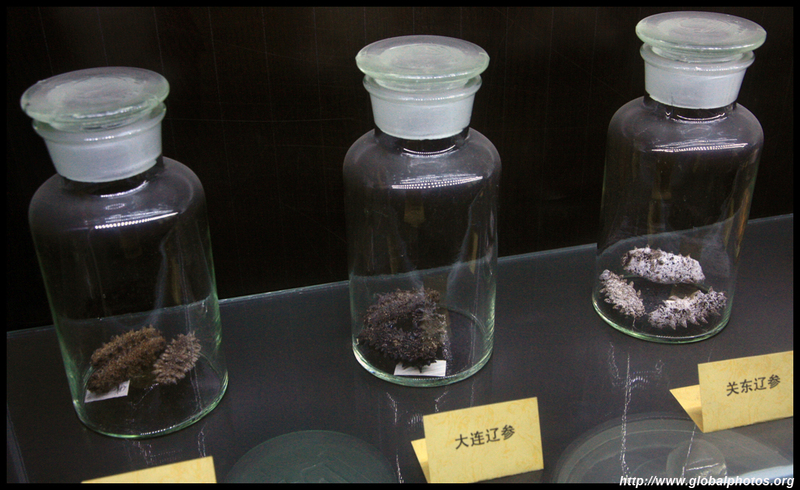 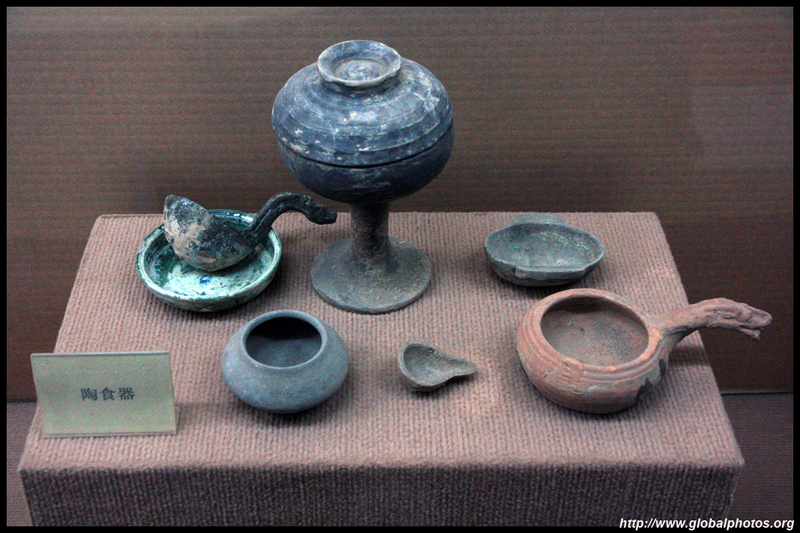 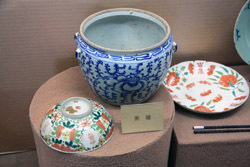 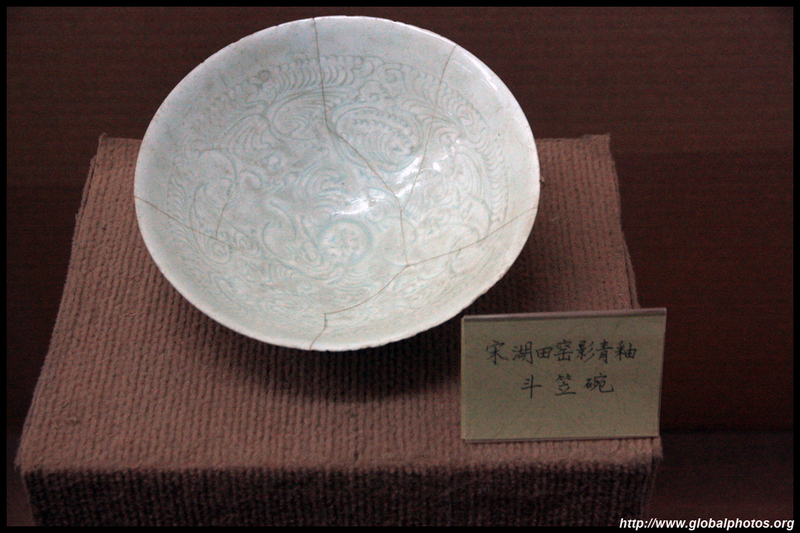 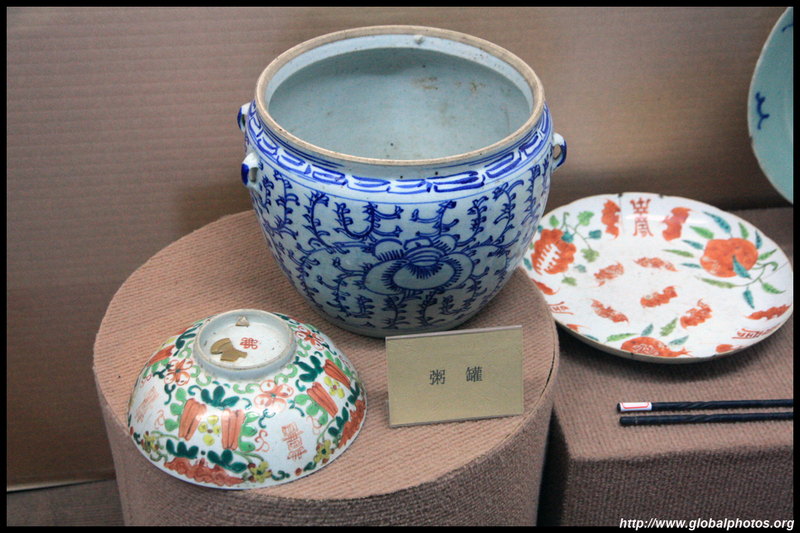 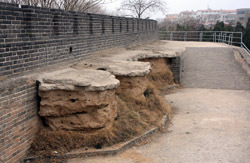 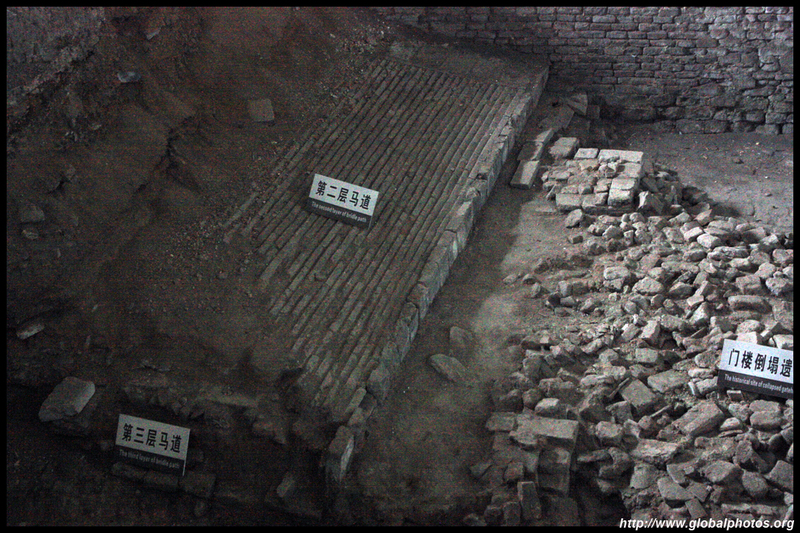 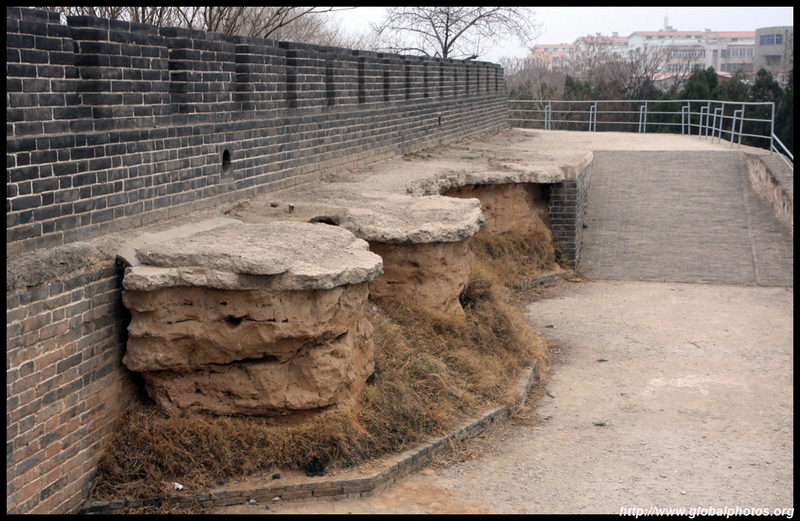 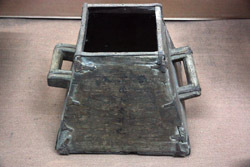 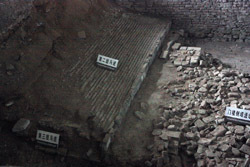 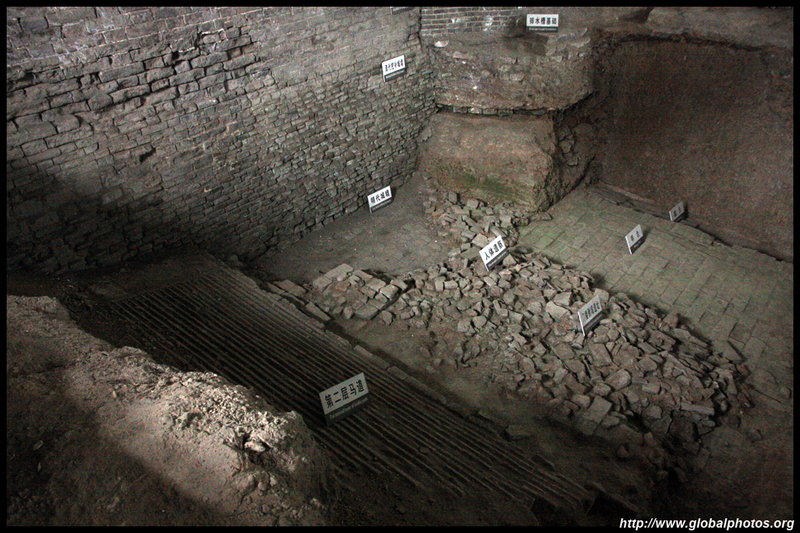 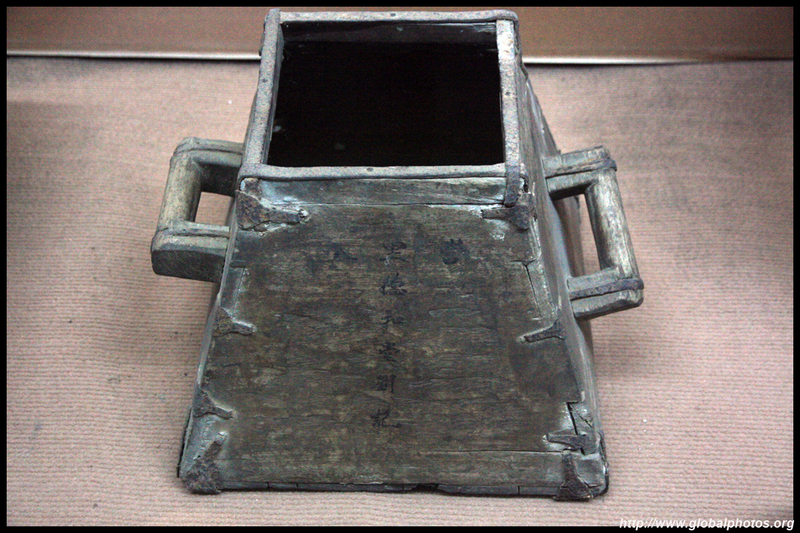 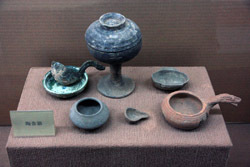 However, there is an exhibit here that shows remnants from the original structure dating back to the Ming and Qing dynasties. 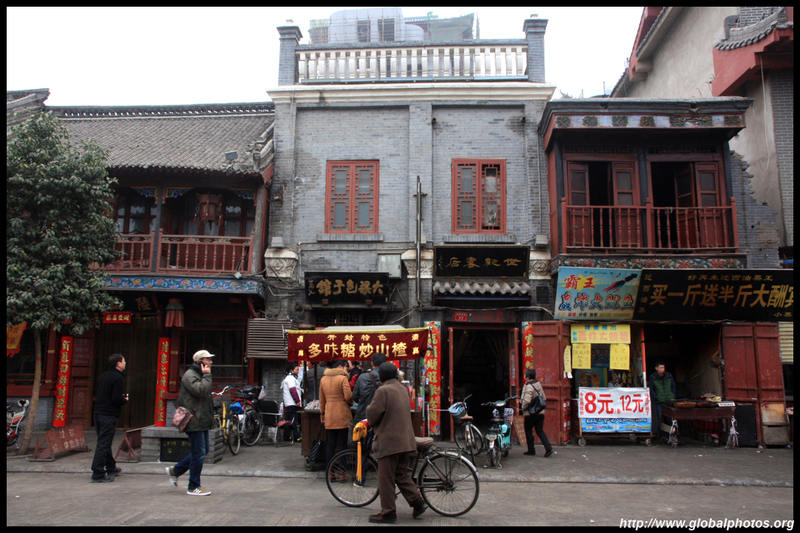 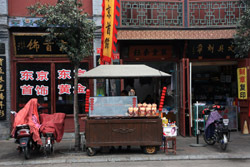 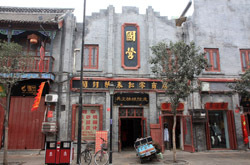 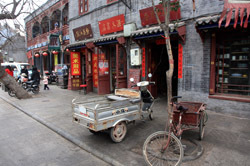 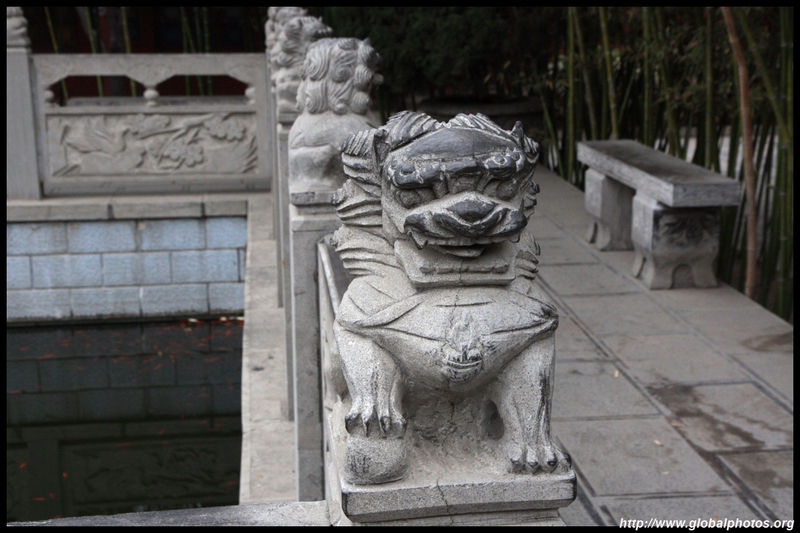 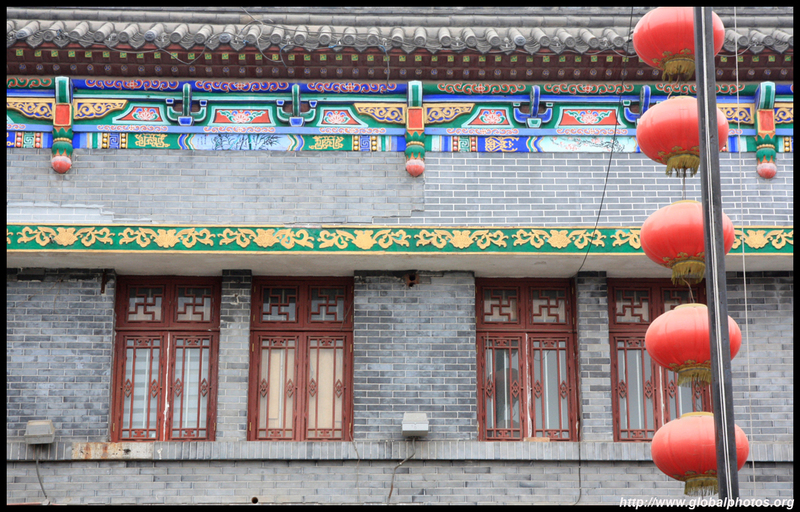 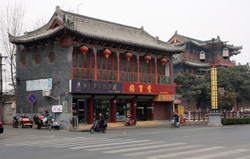 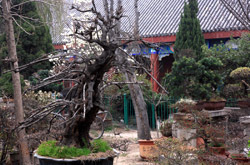 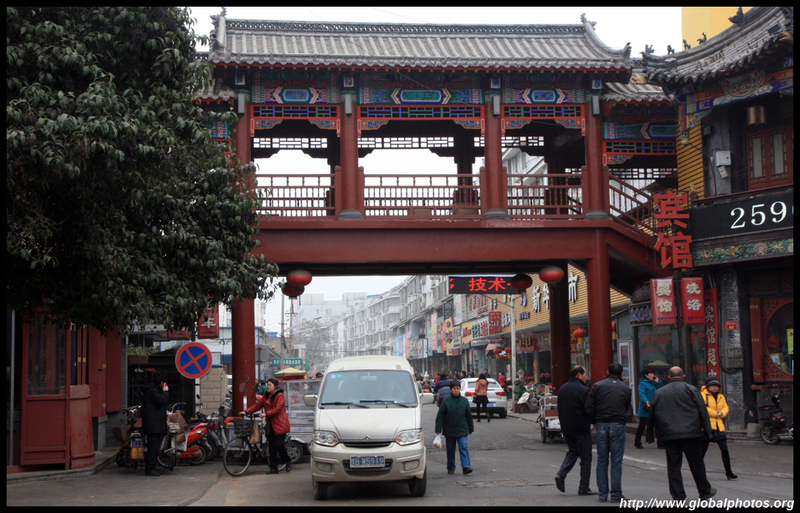 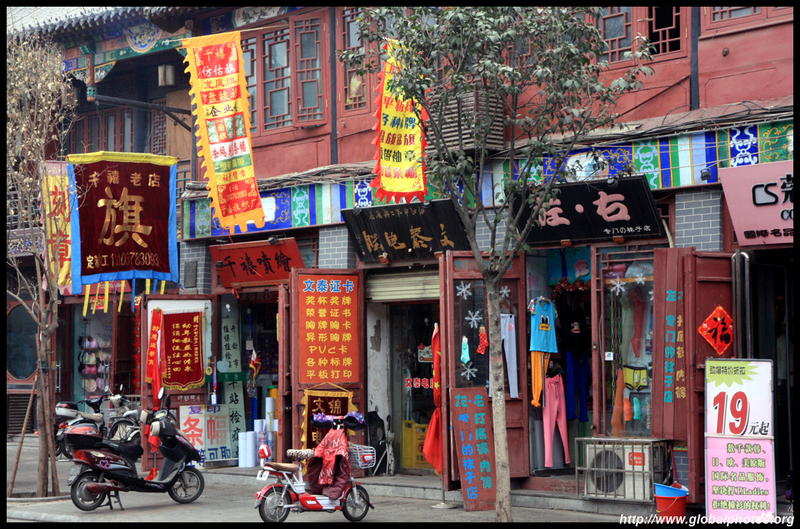 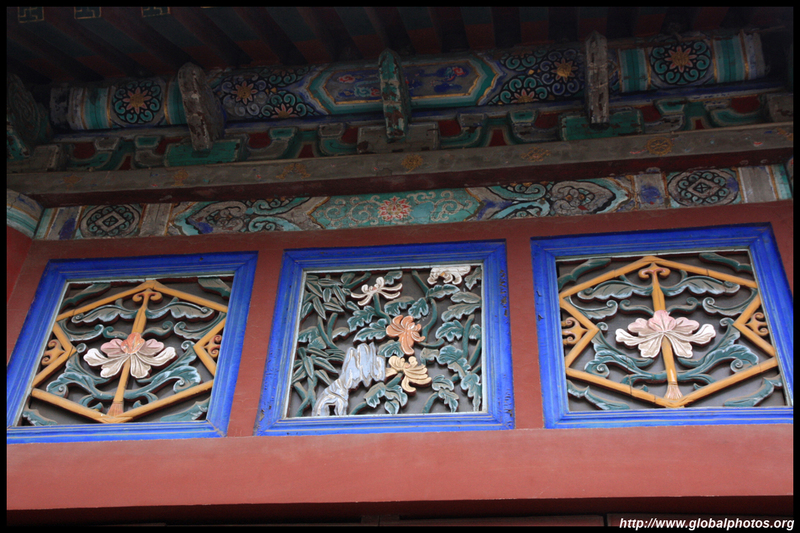 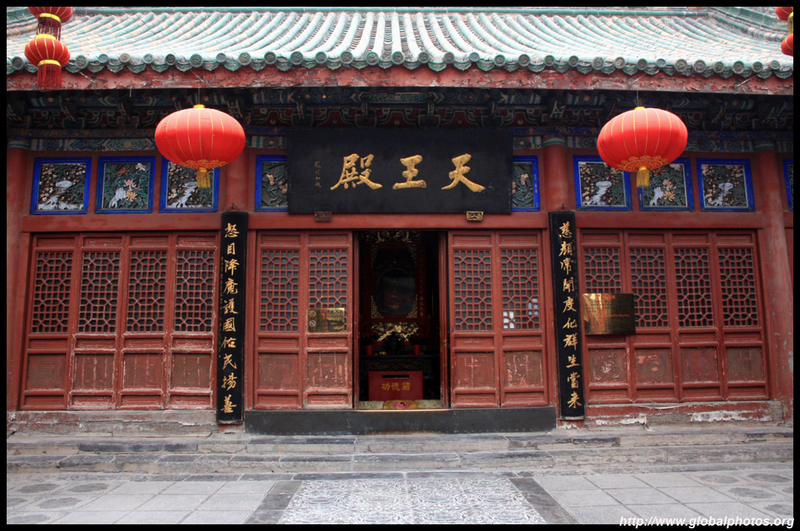 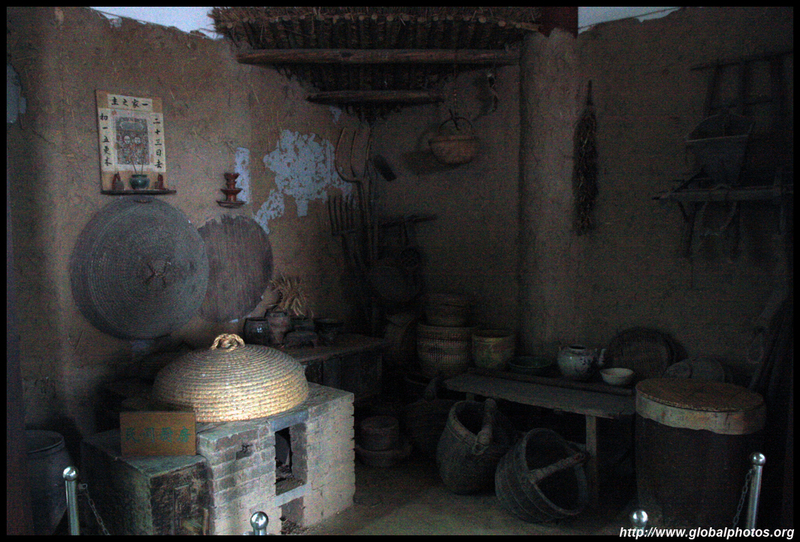 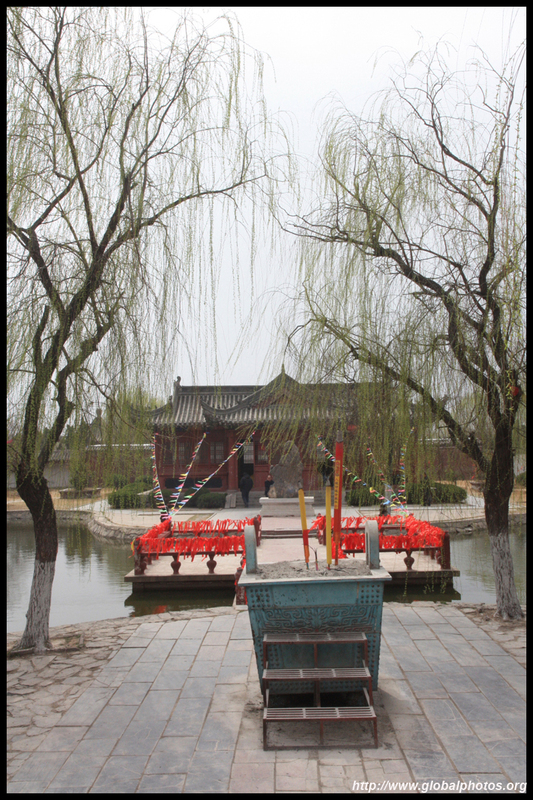 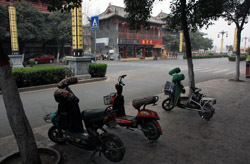 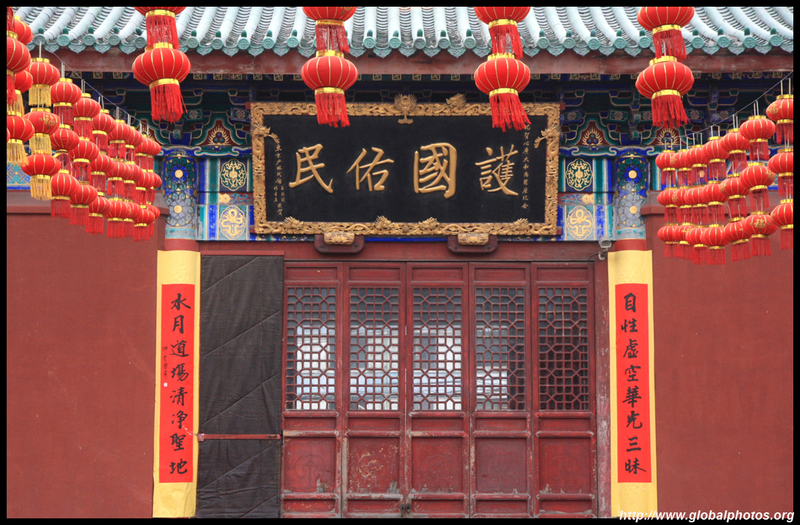 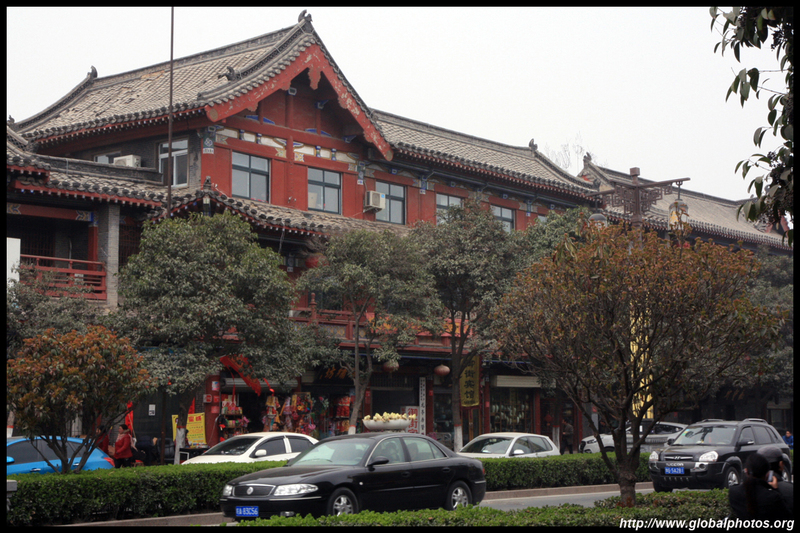 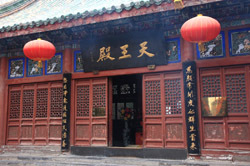 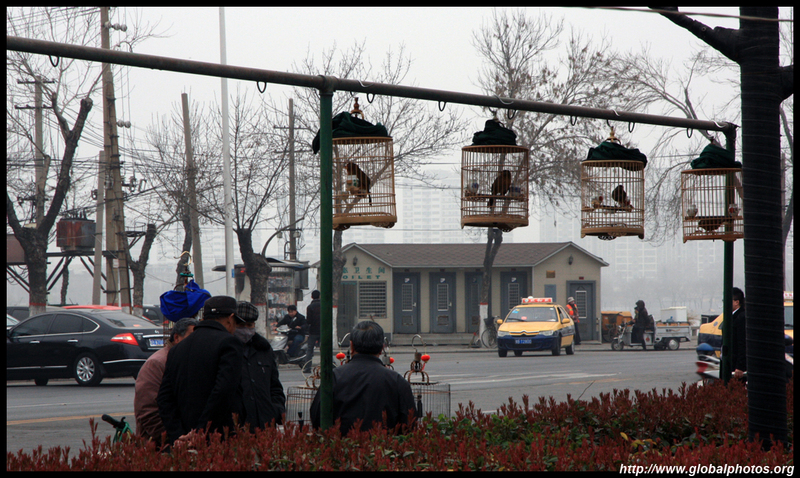 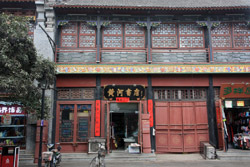 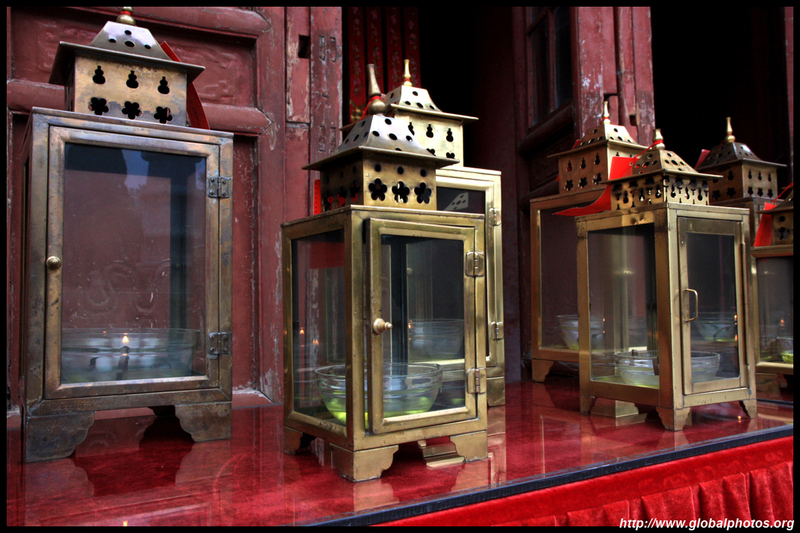 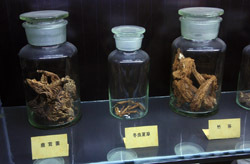 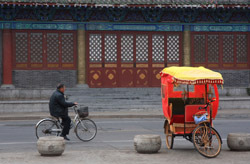 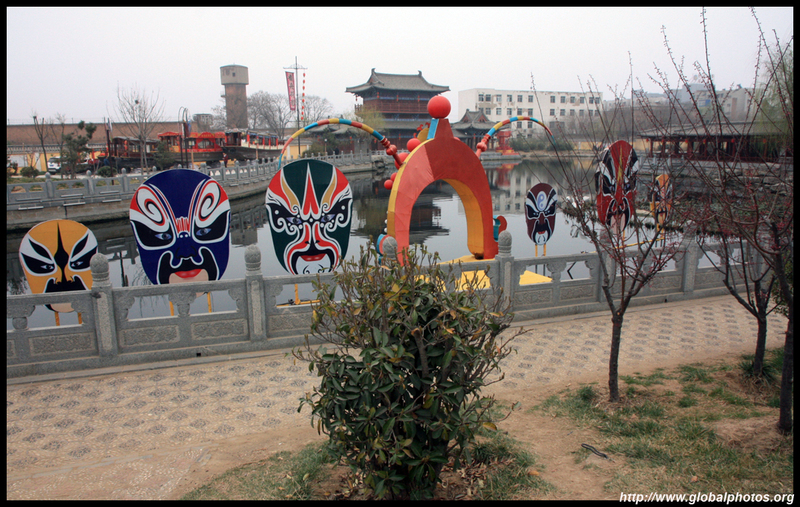 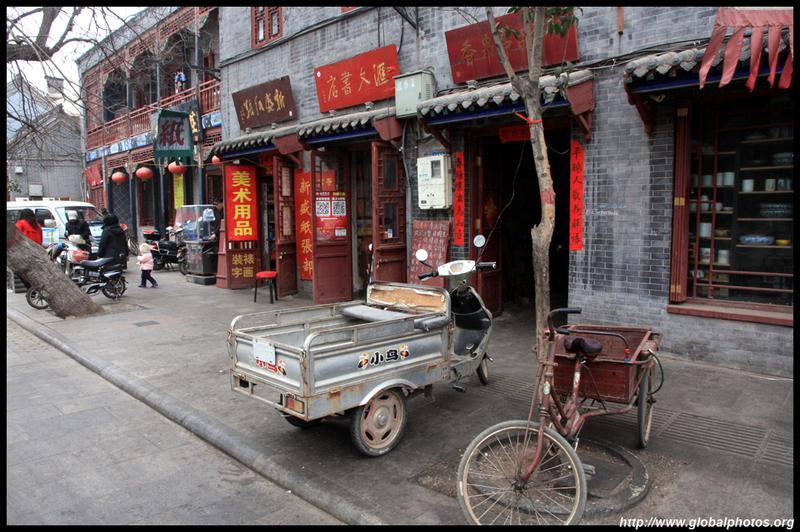 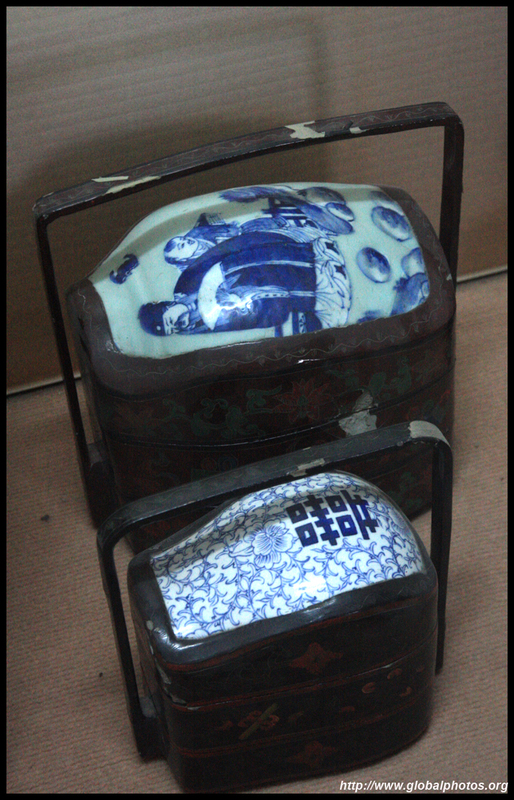 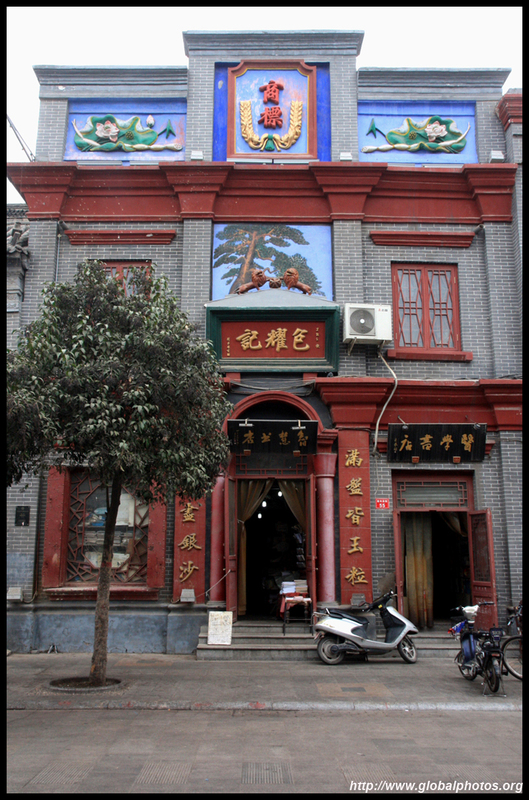 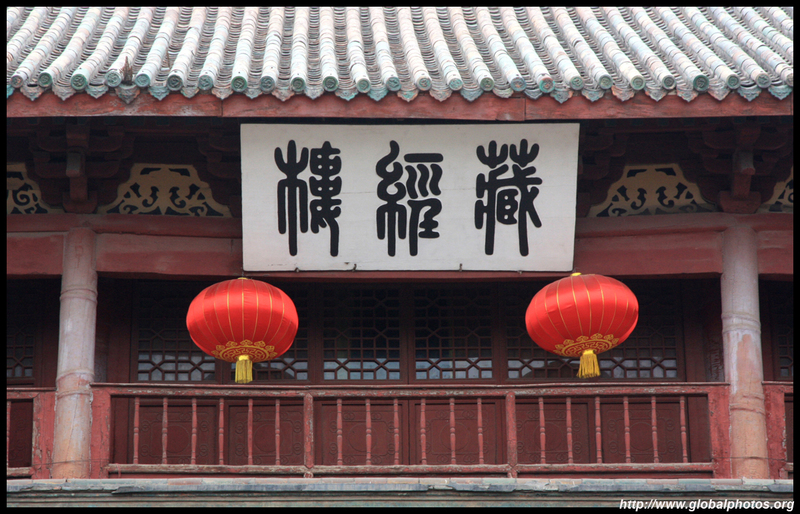 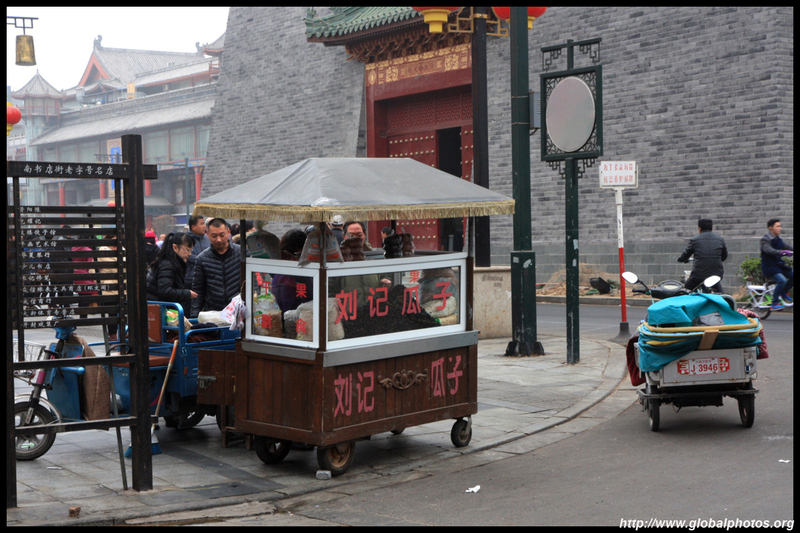 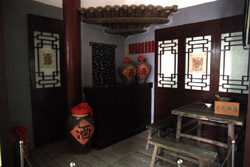 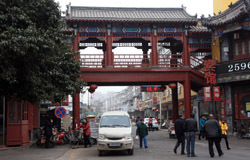 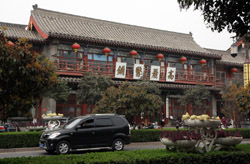 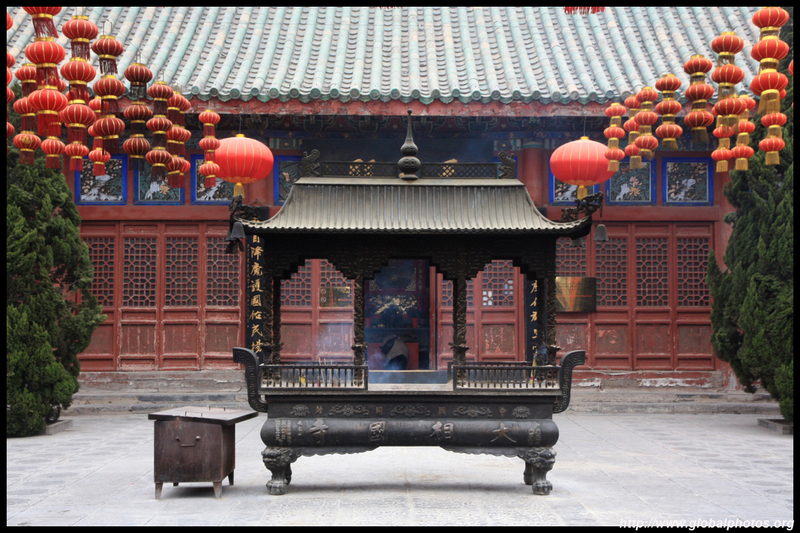 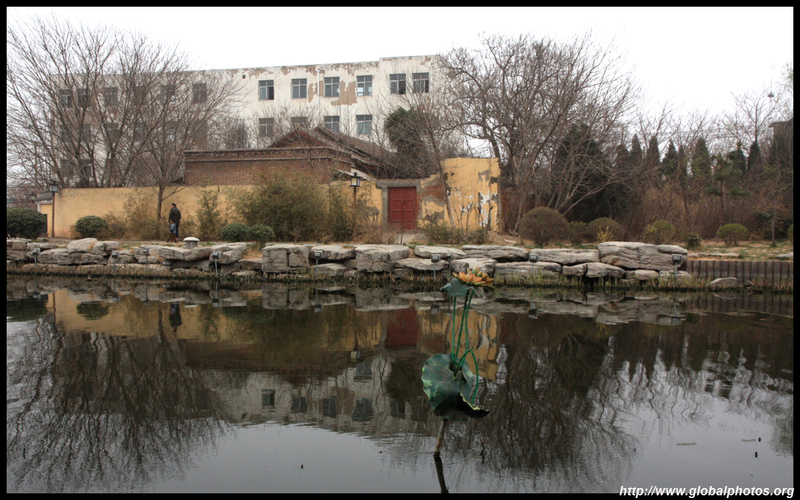 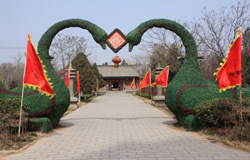 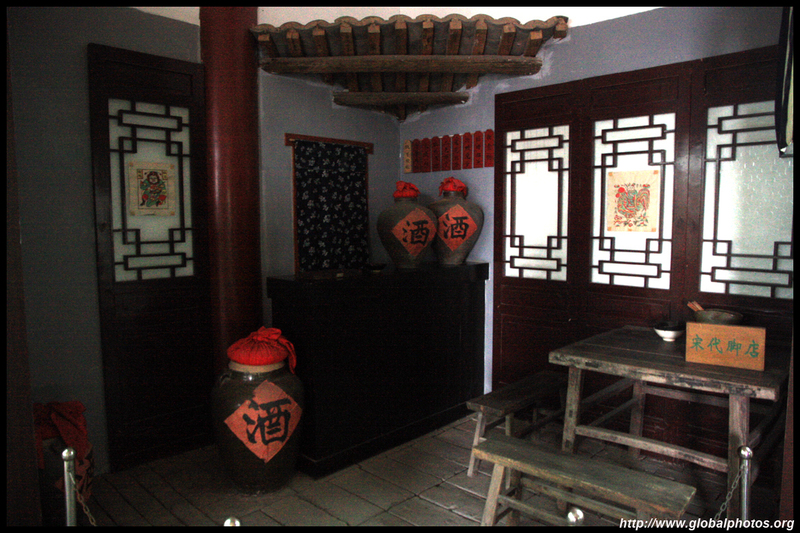 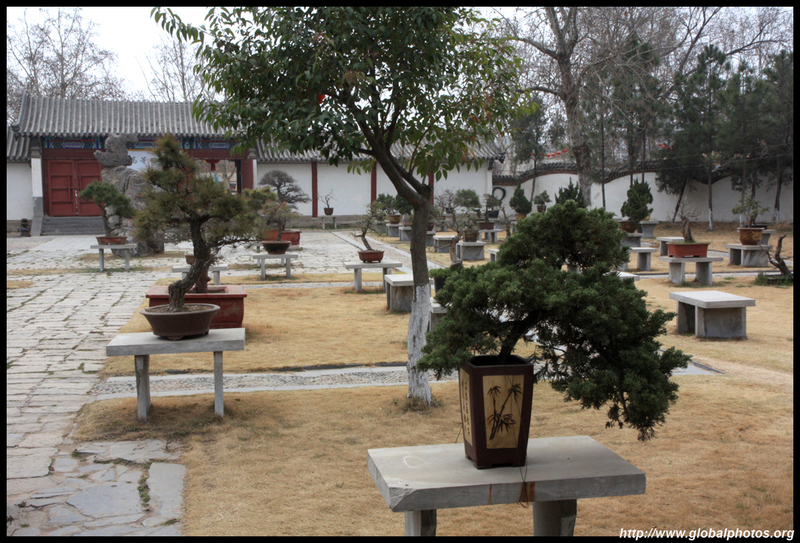 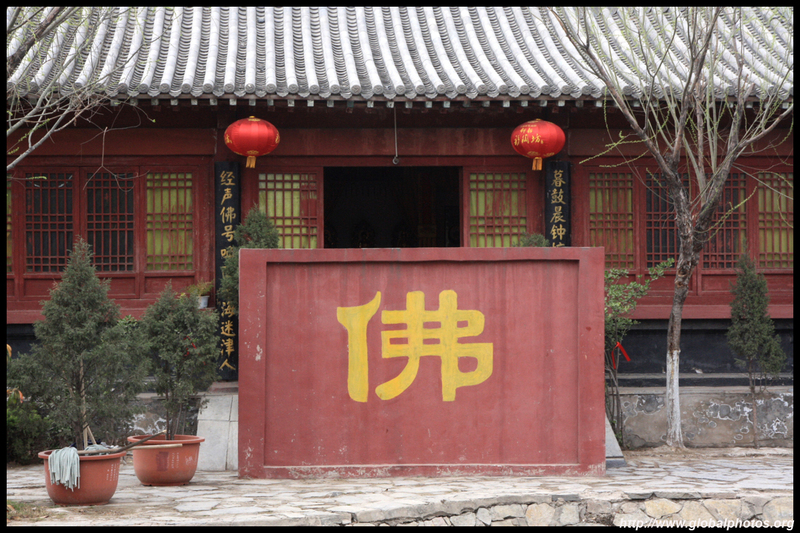 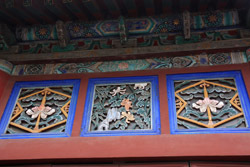 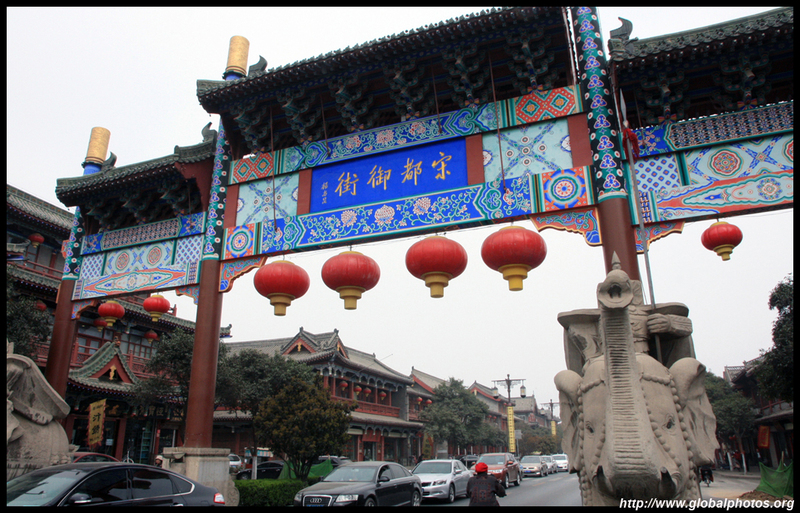 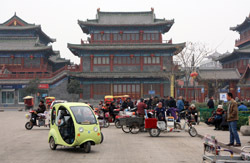 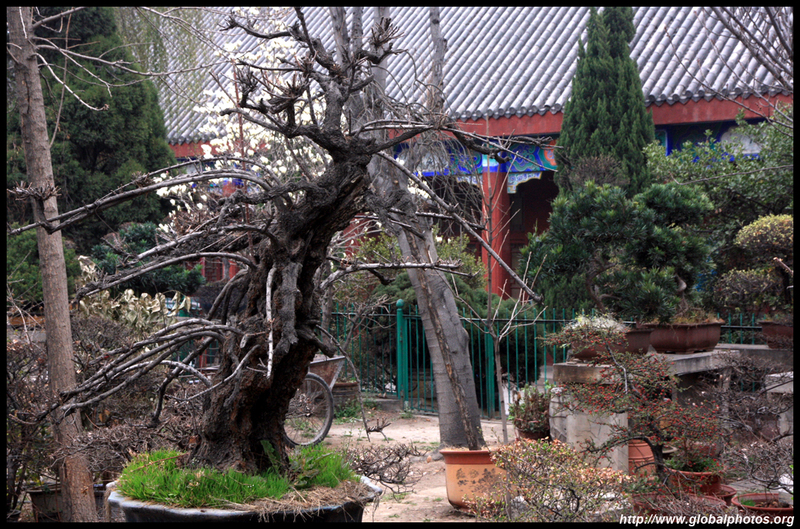 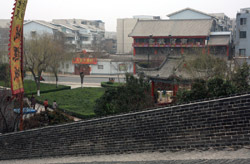 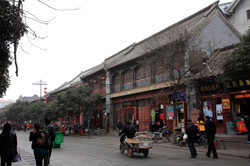 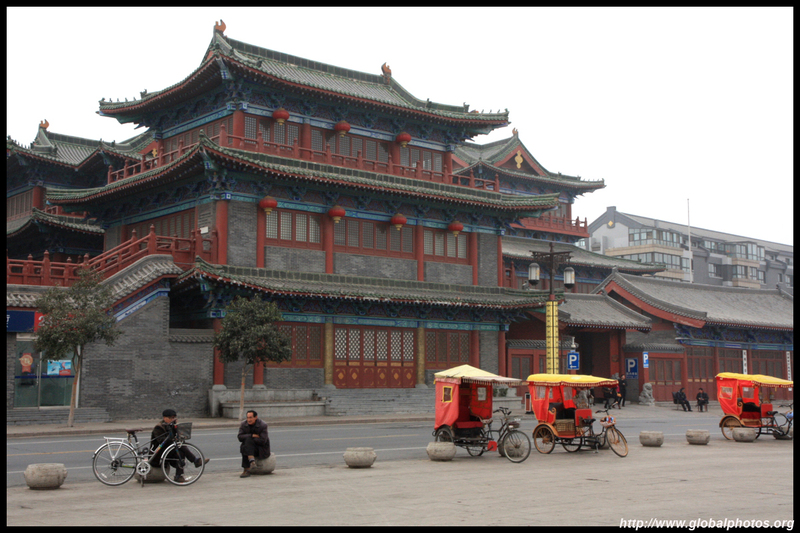 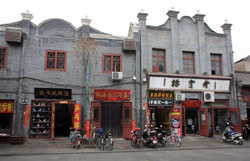 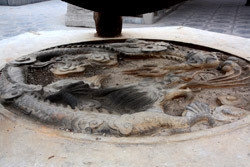 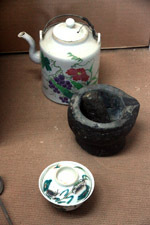 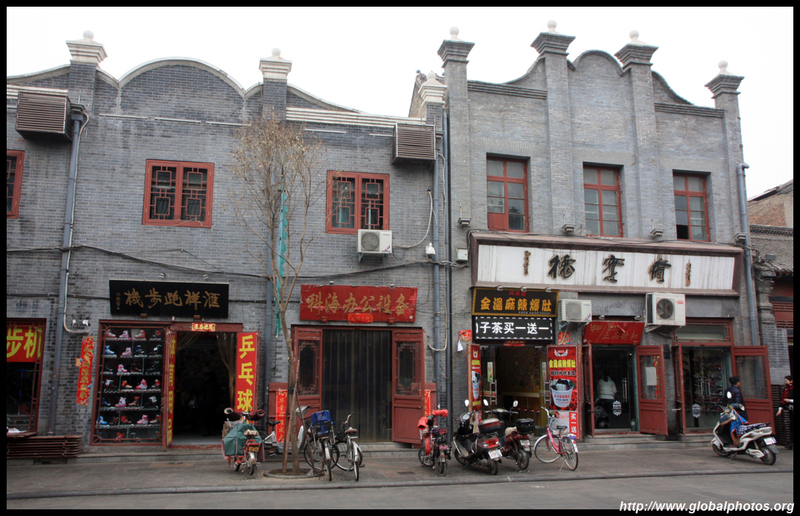 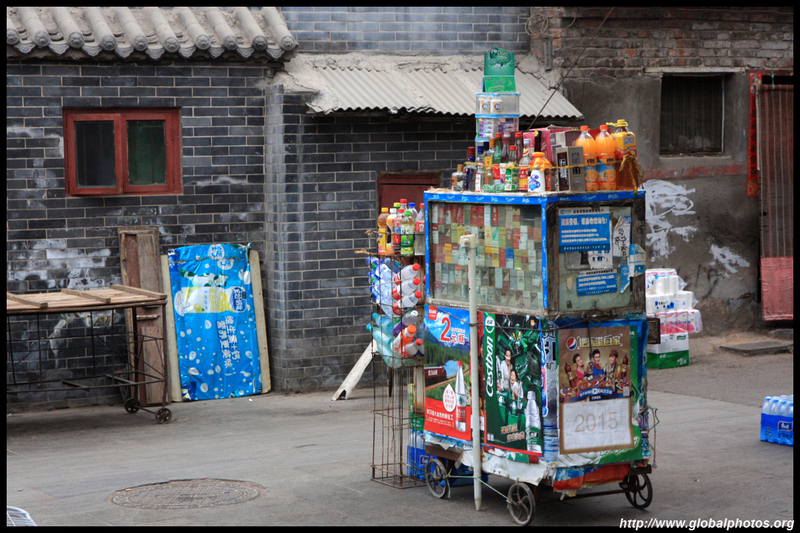 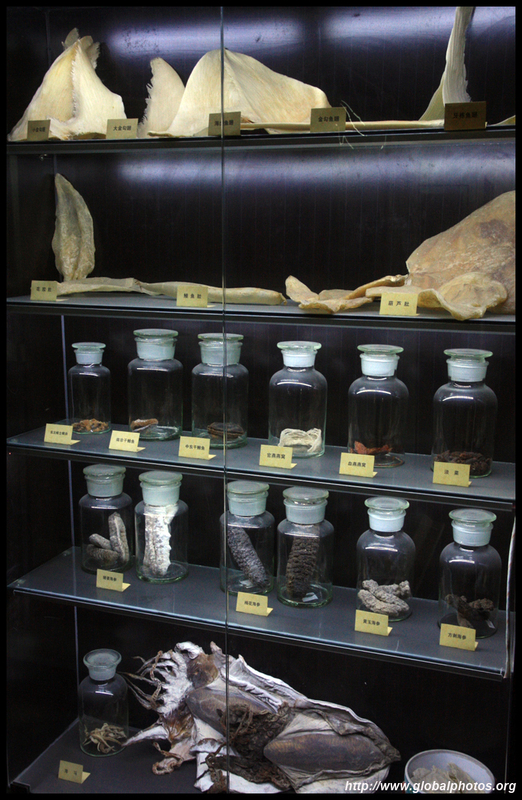 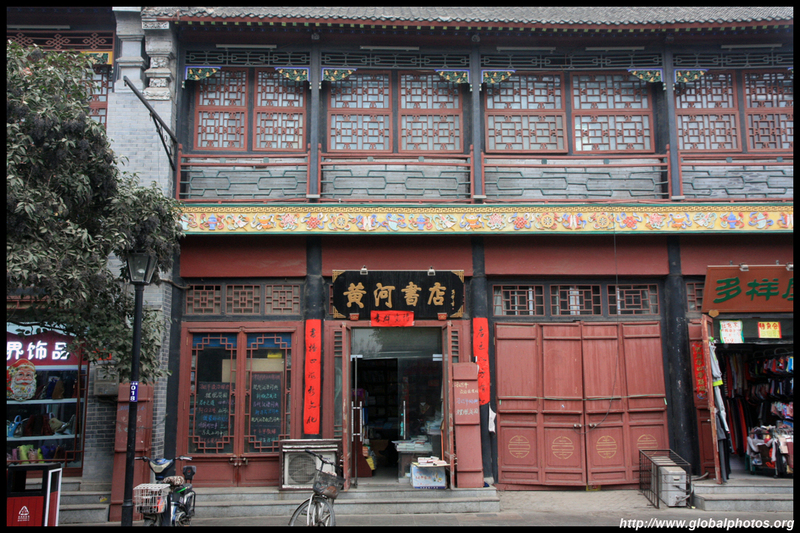 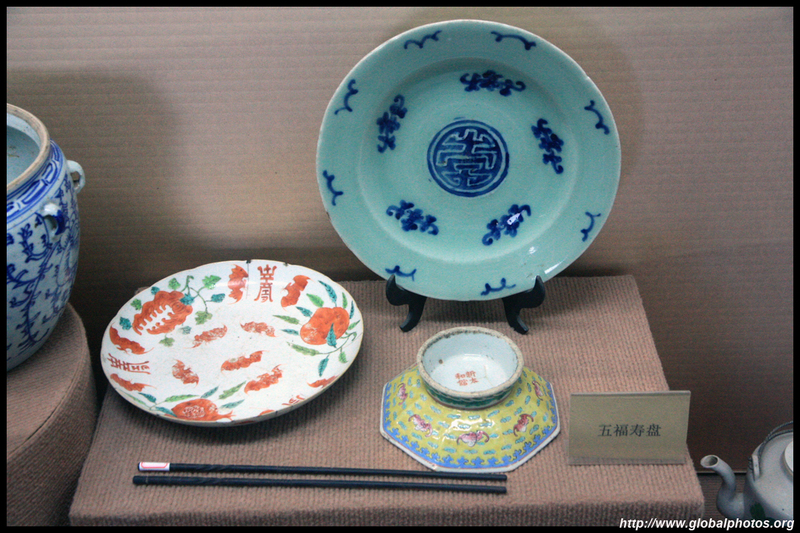 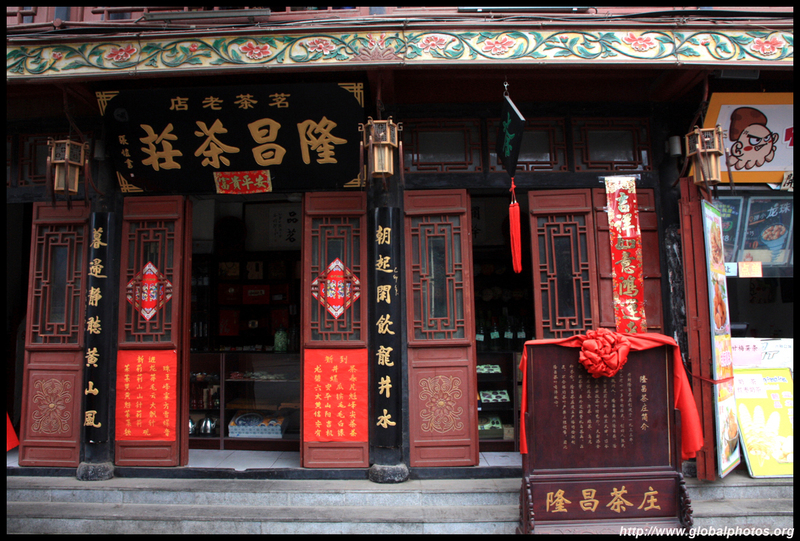 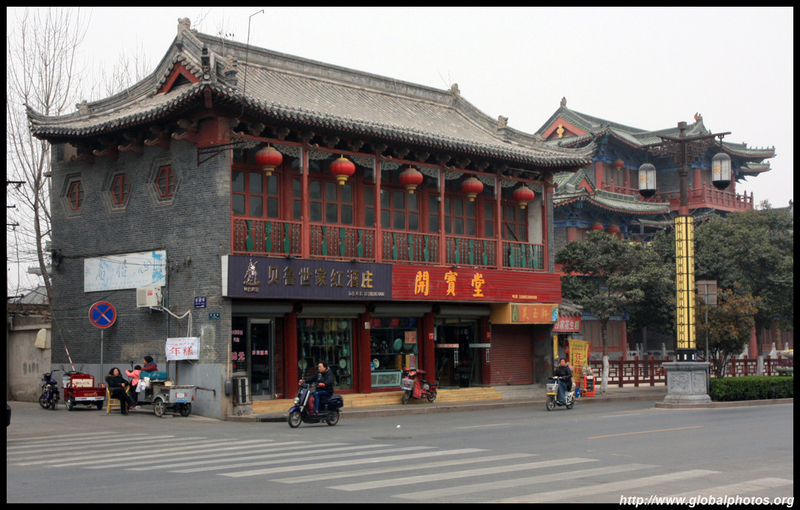 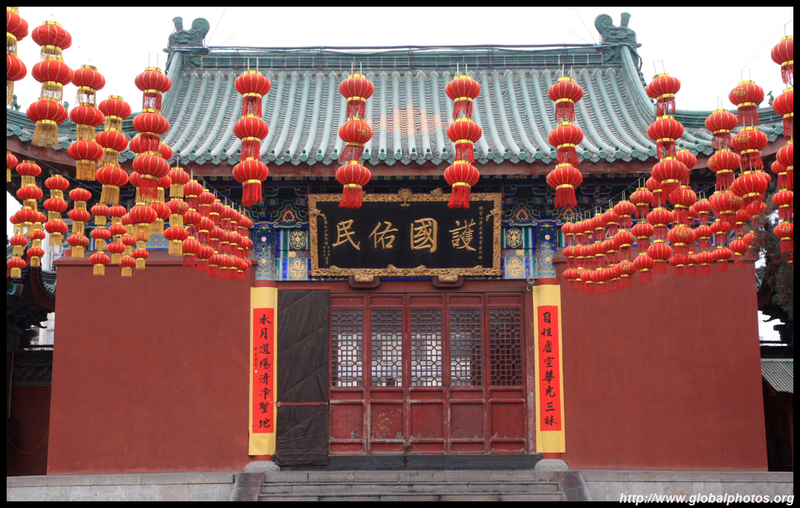 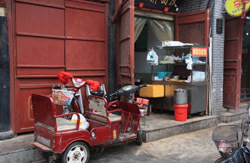 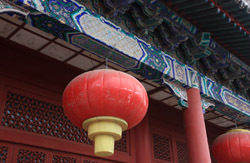 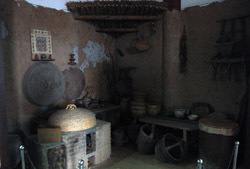 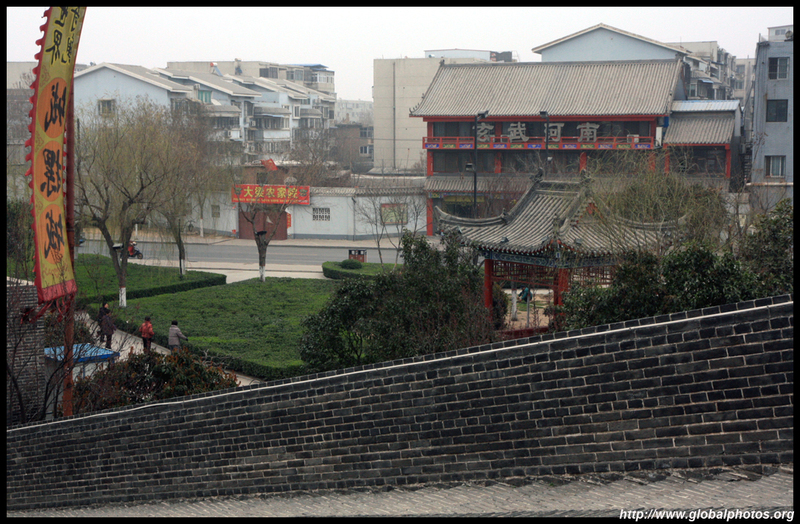 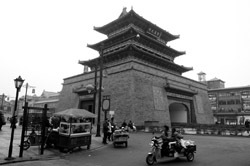 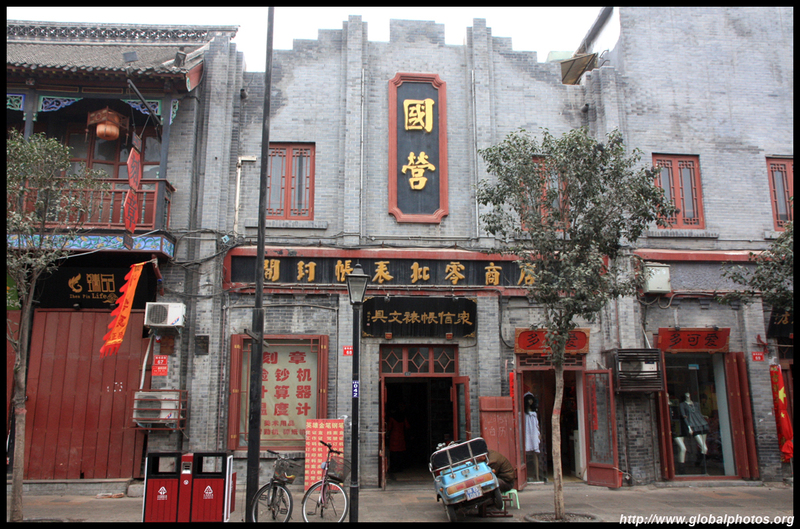 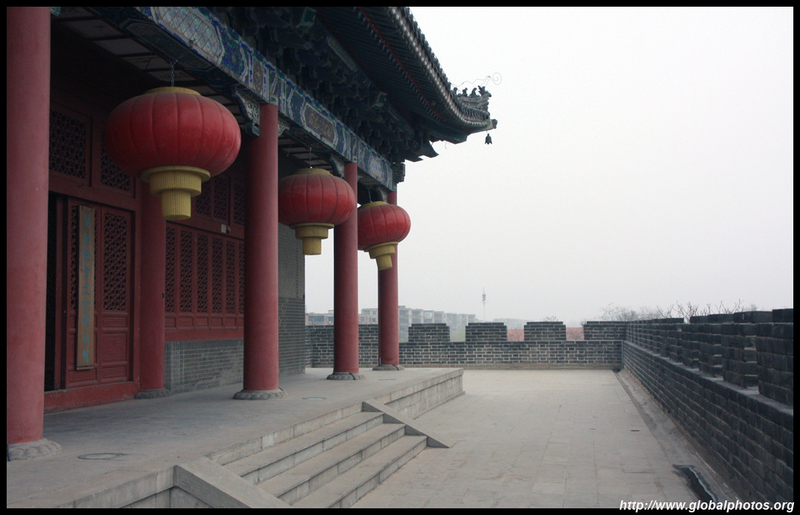 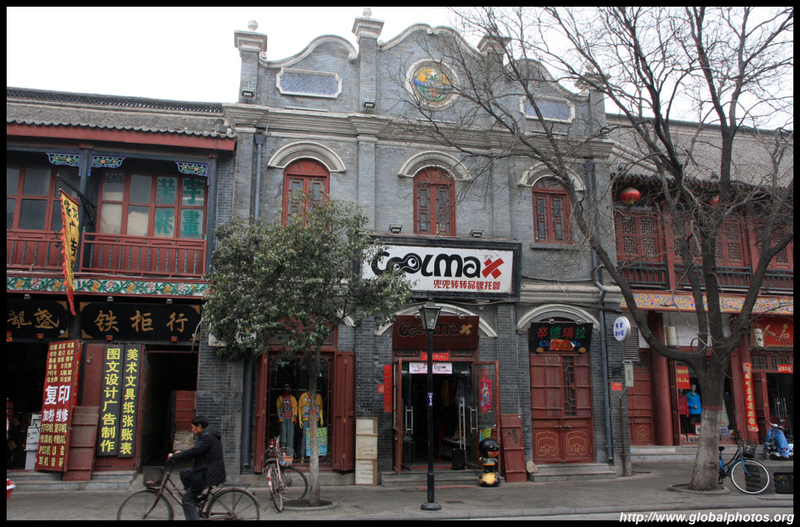 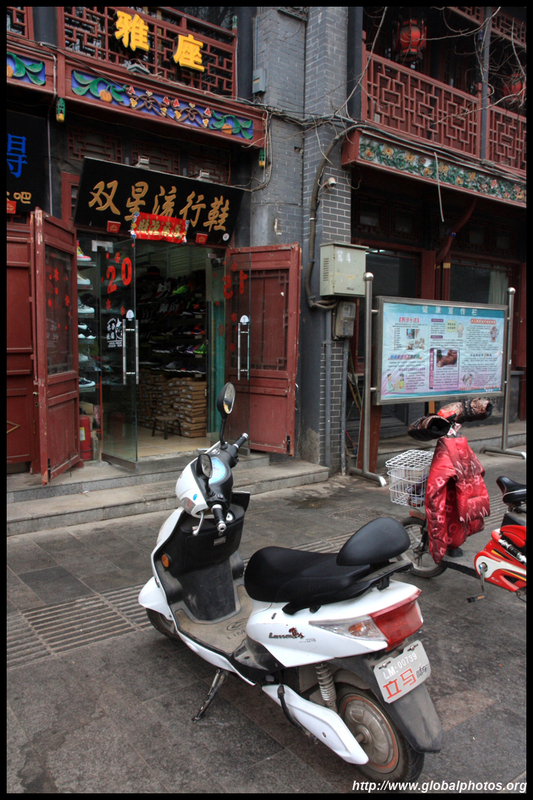 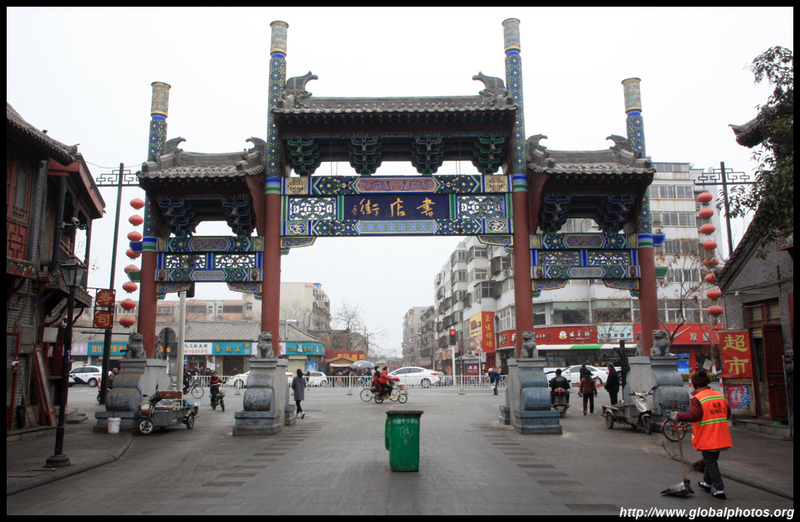 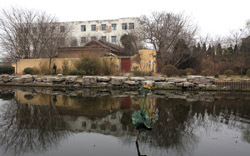 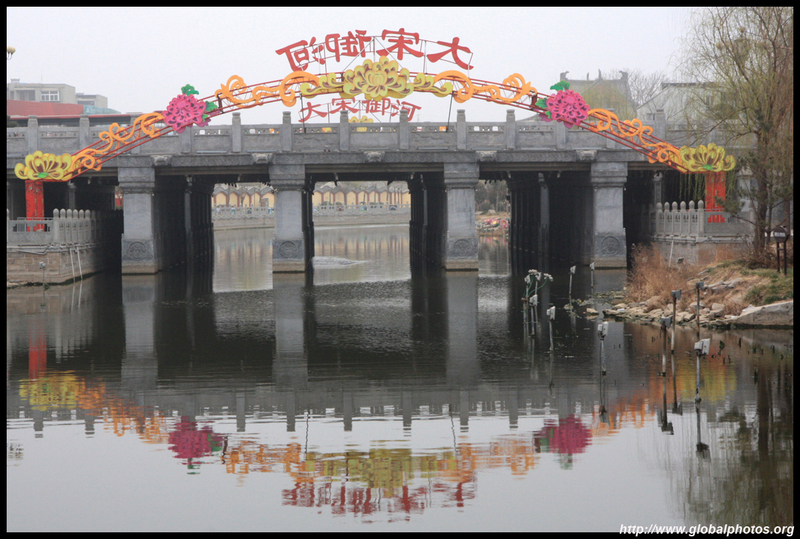 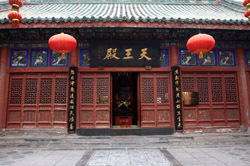 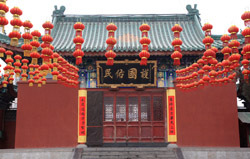 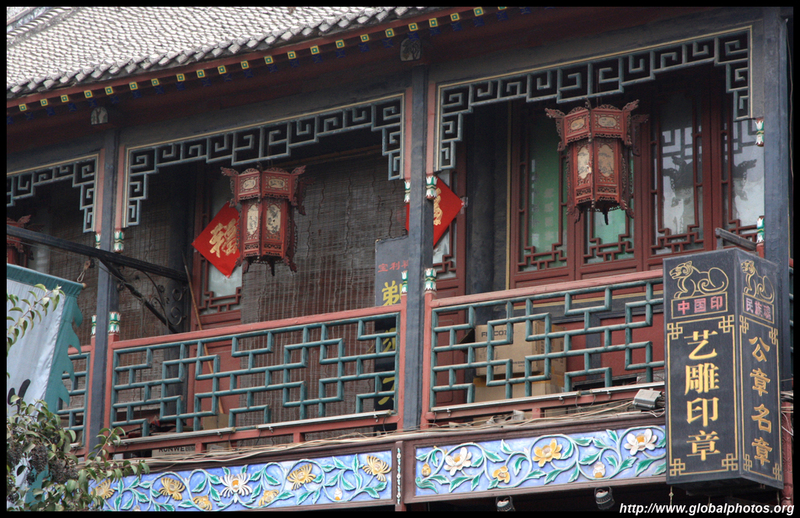 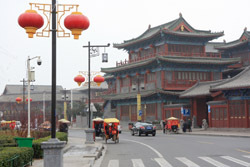 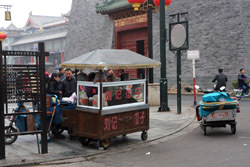 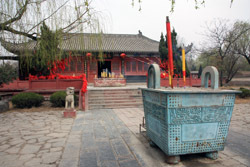 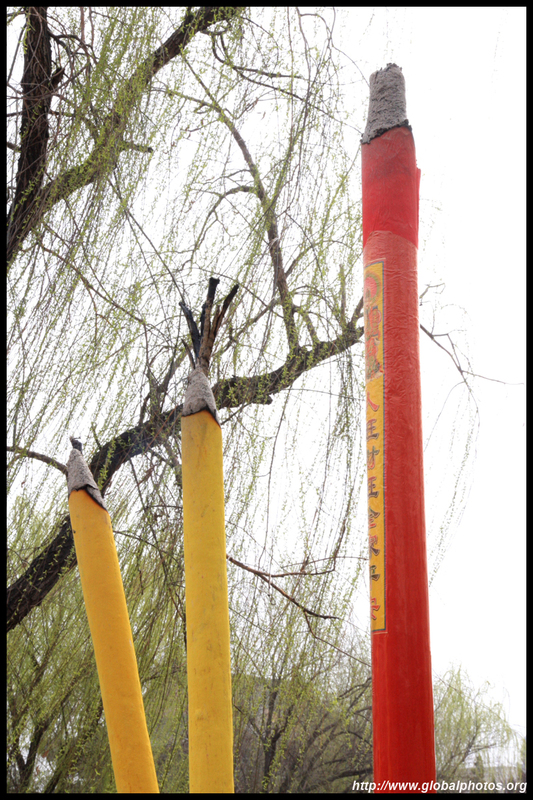 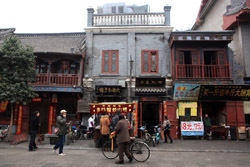 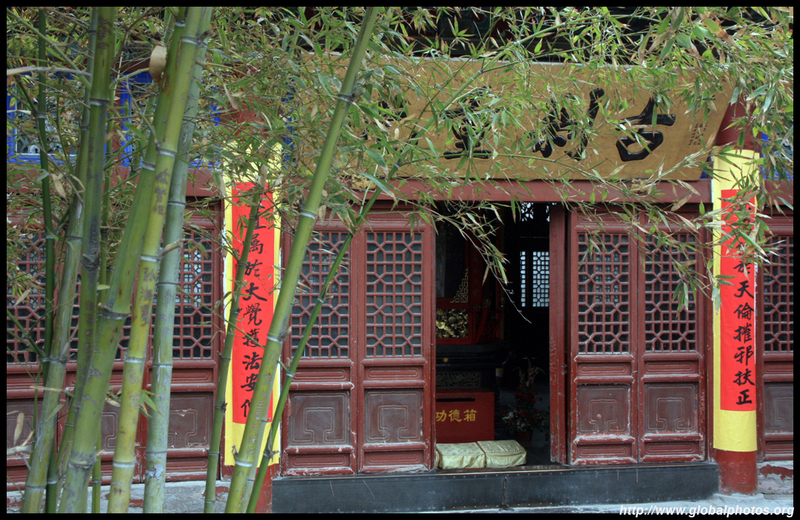 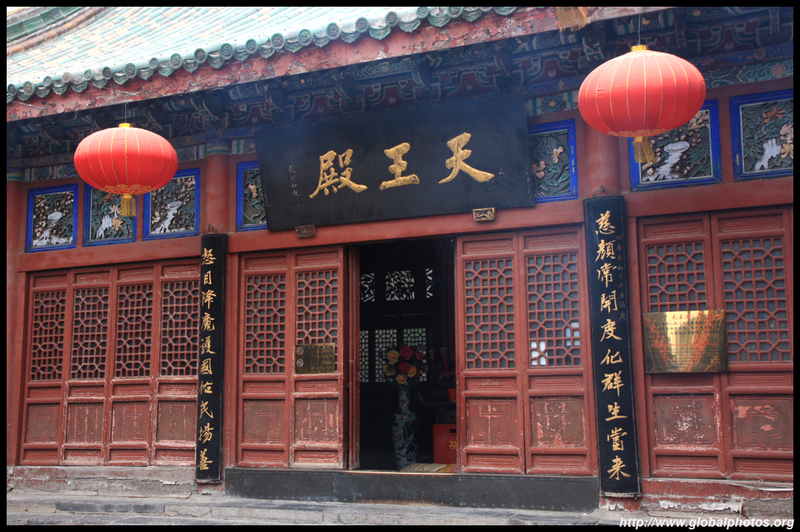 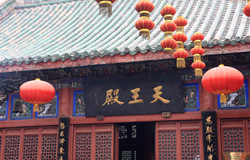 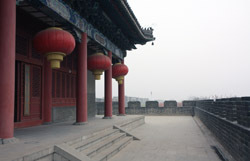 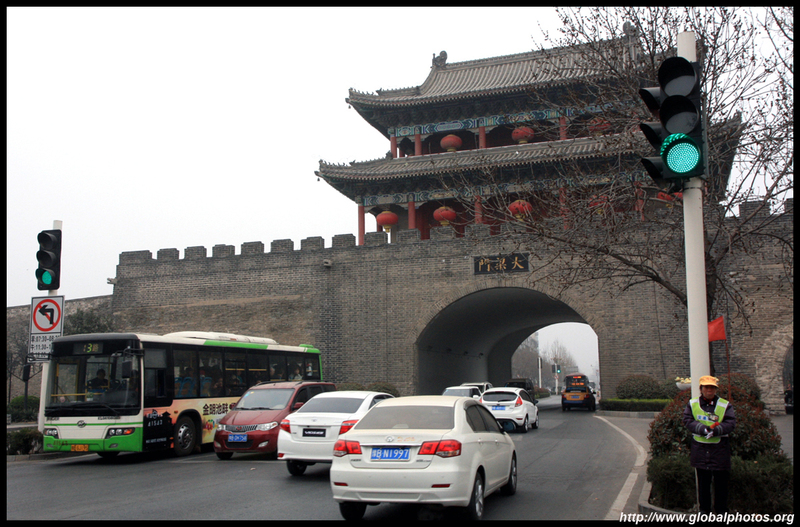 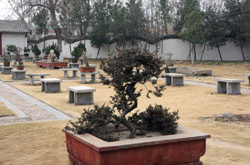 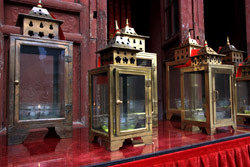 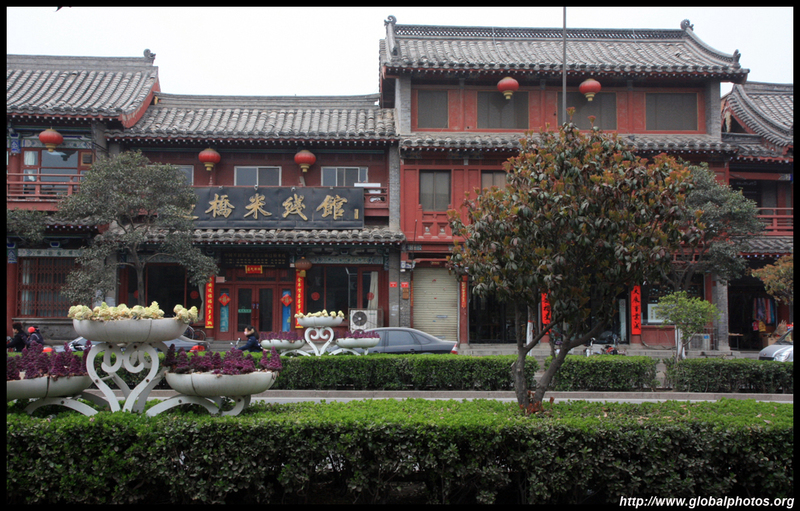 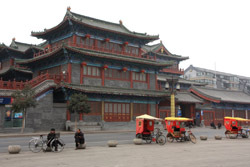 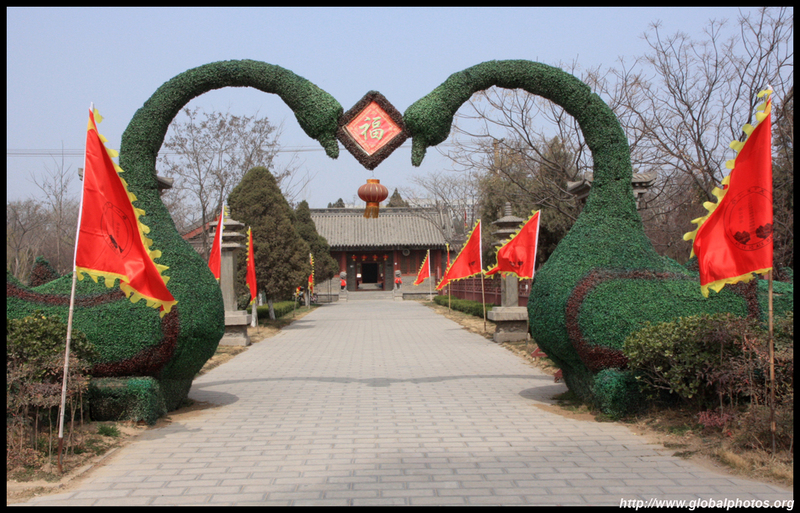 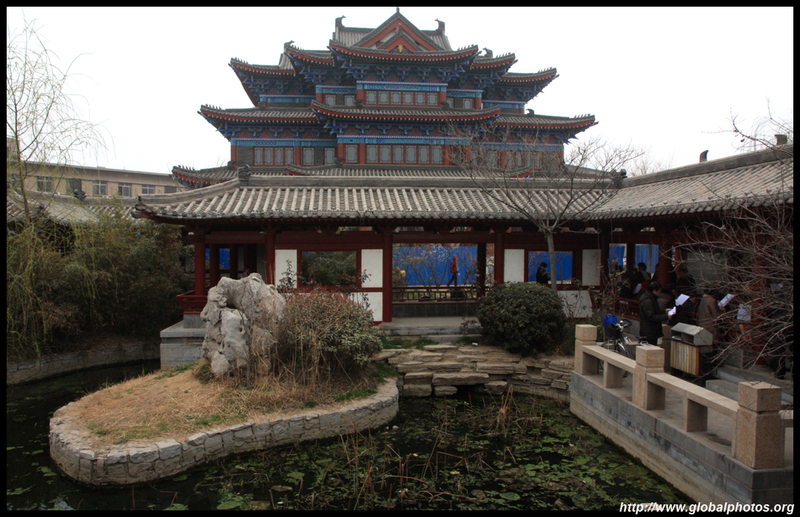 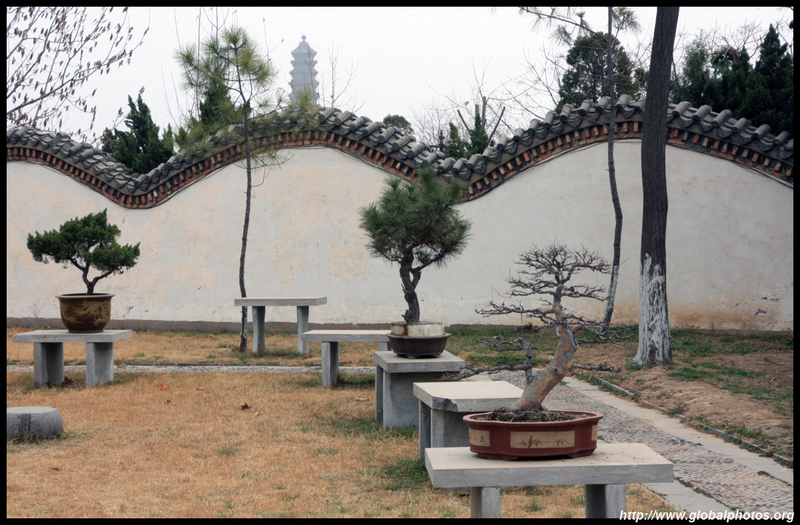 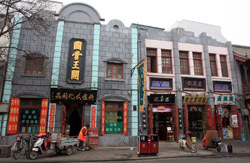 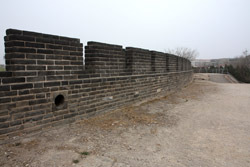 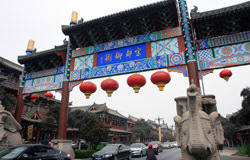 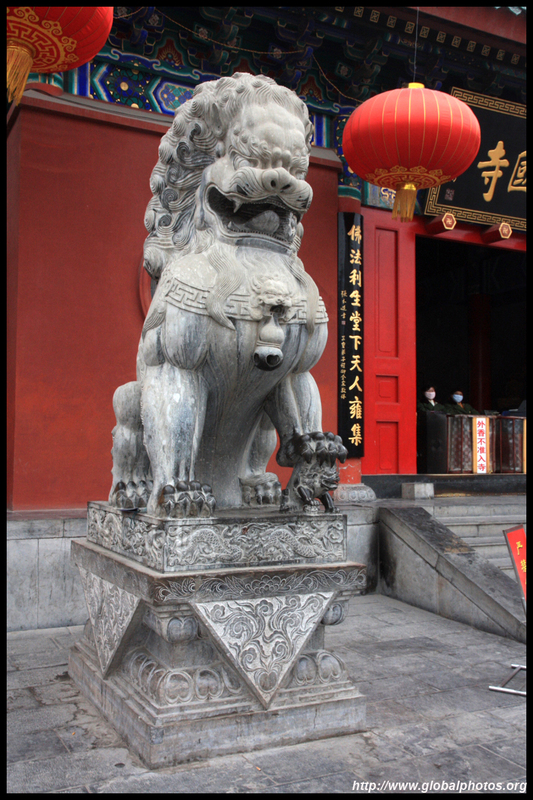 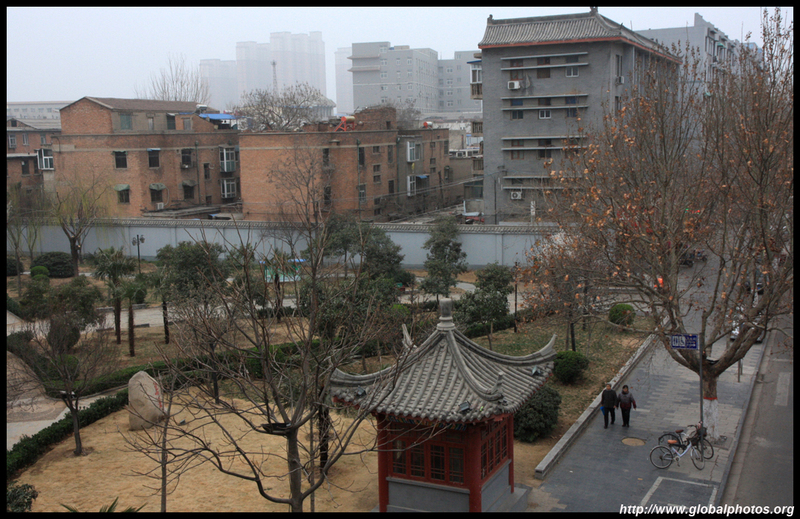 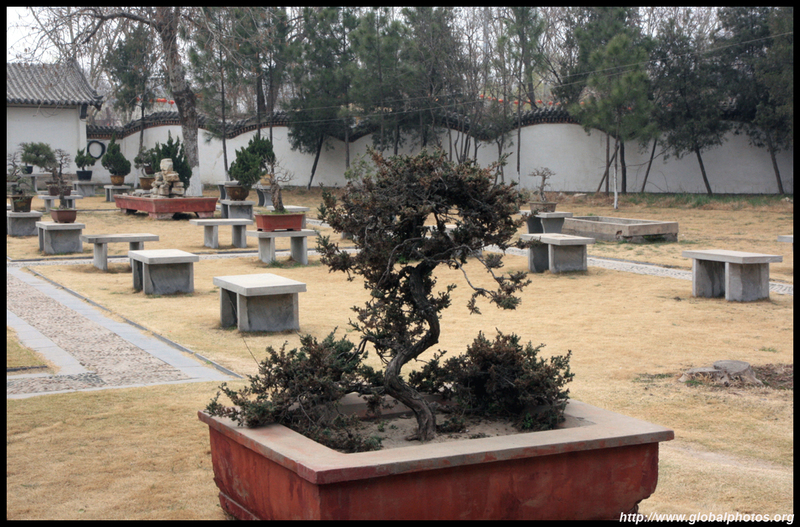 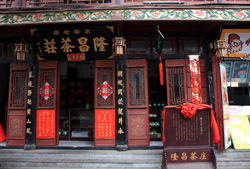 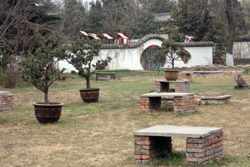 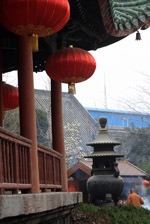 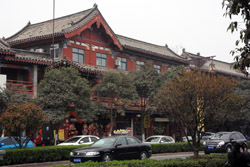 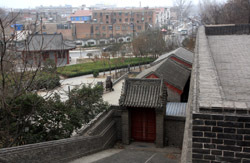 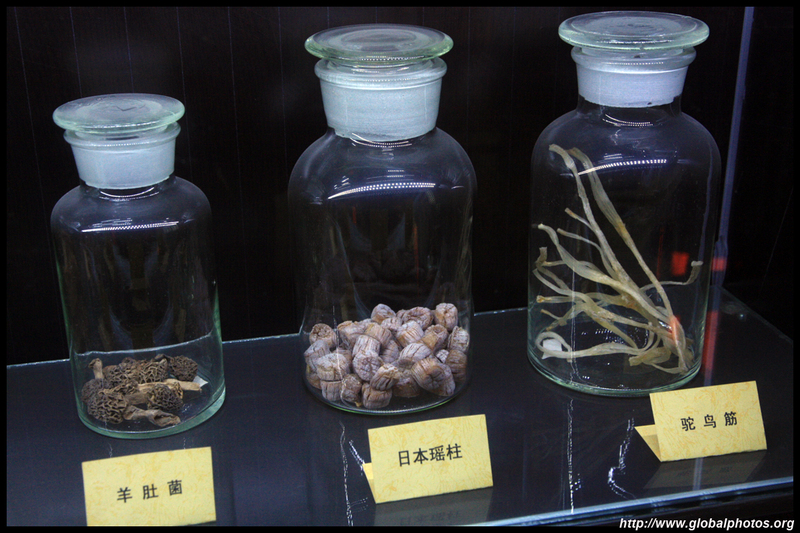 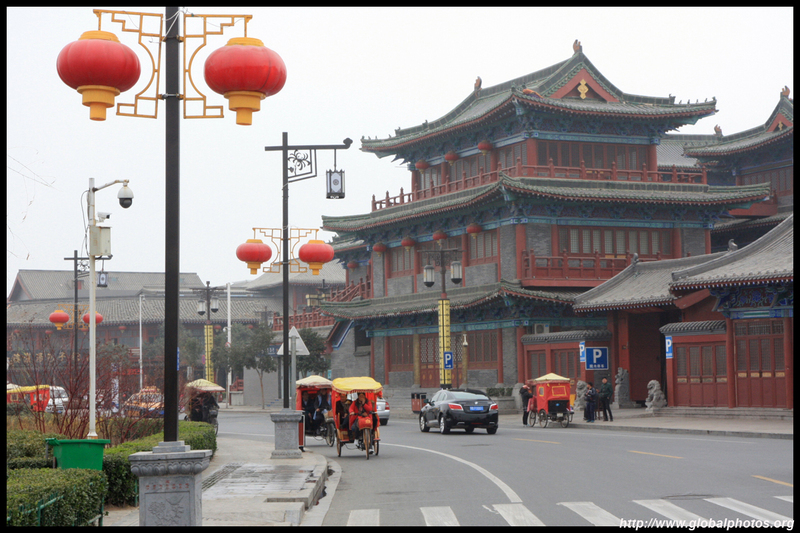 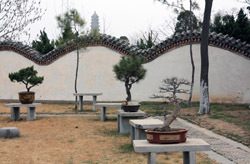 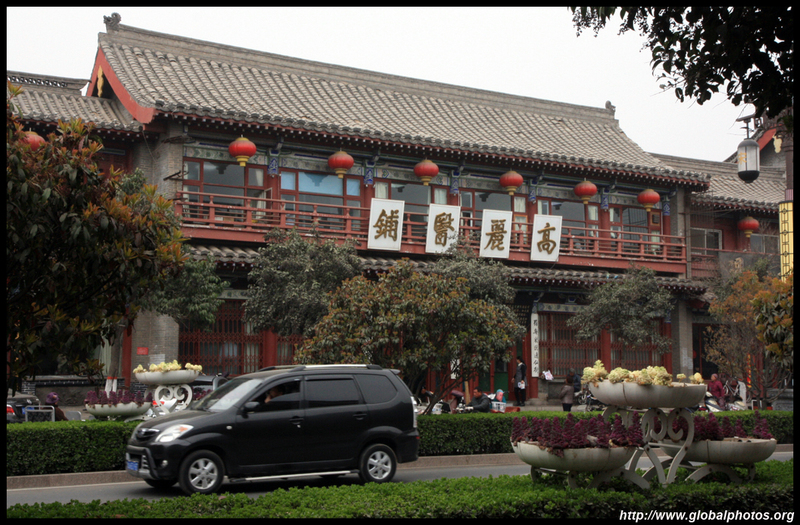 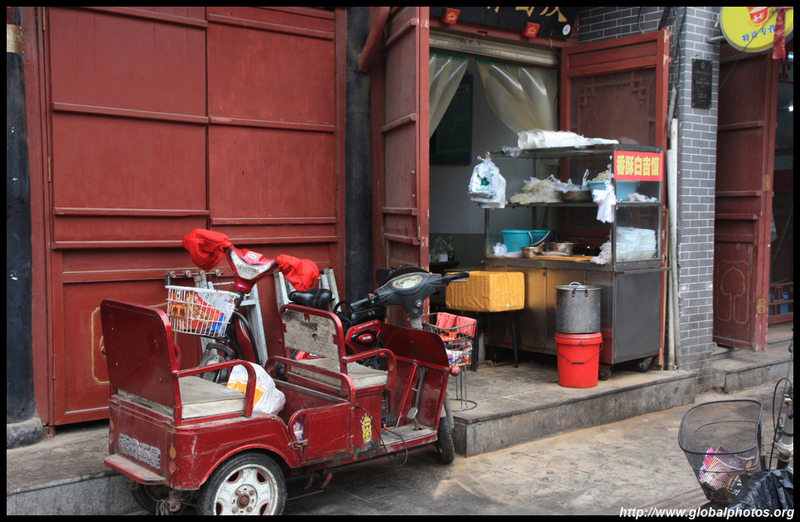 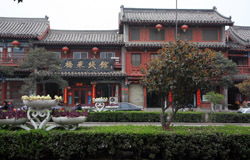 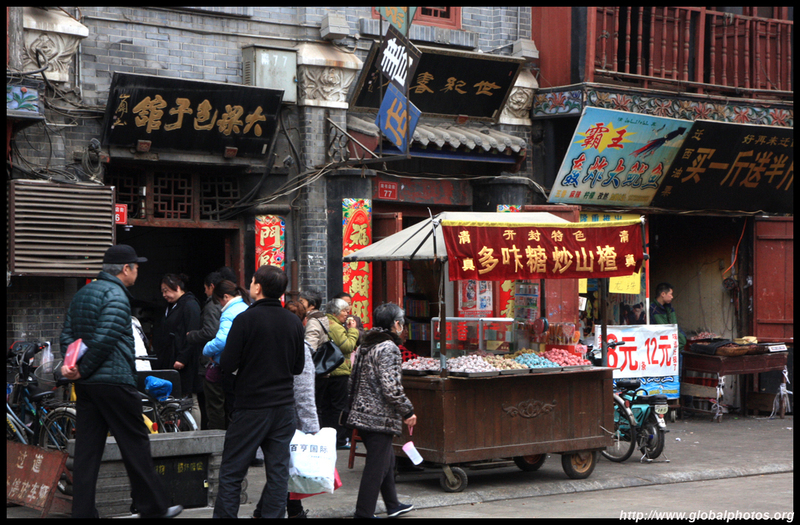 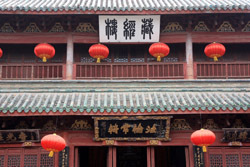 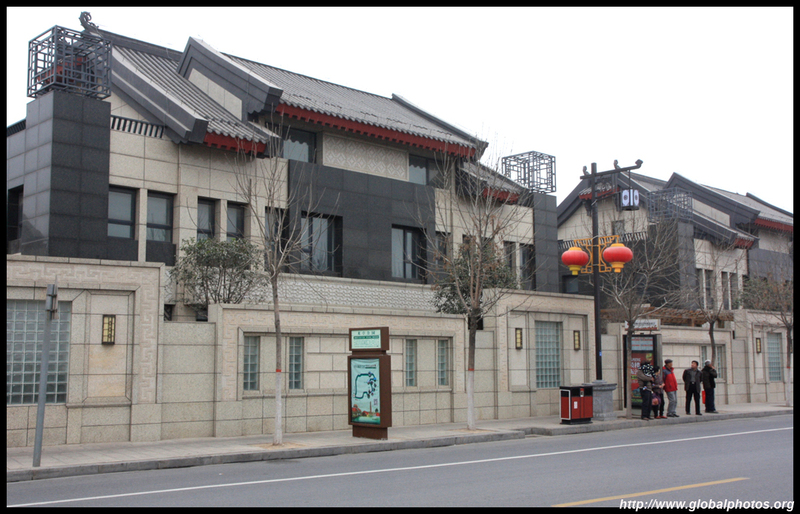 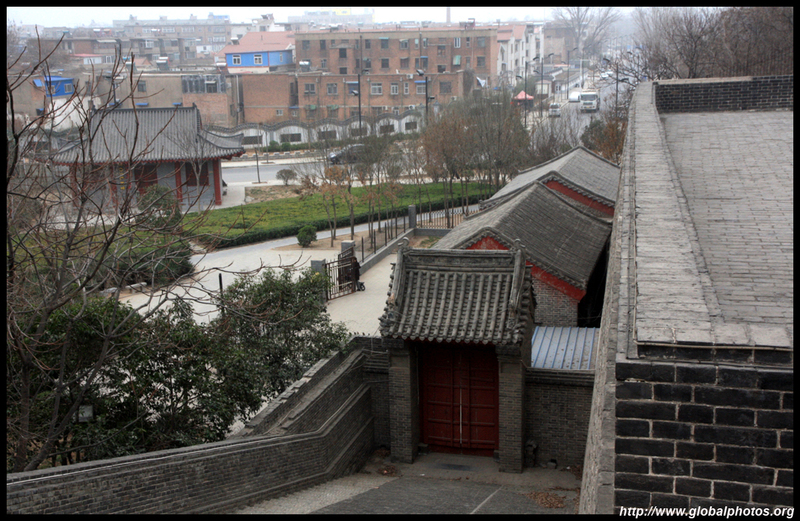 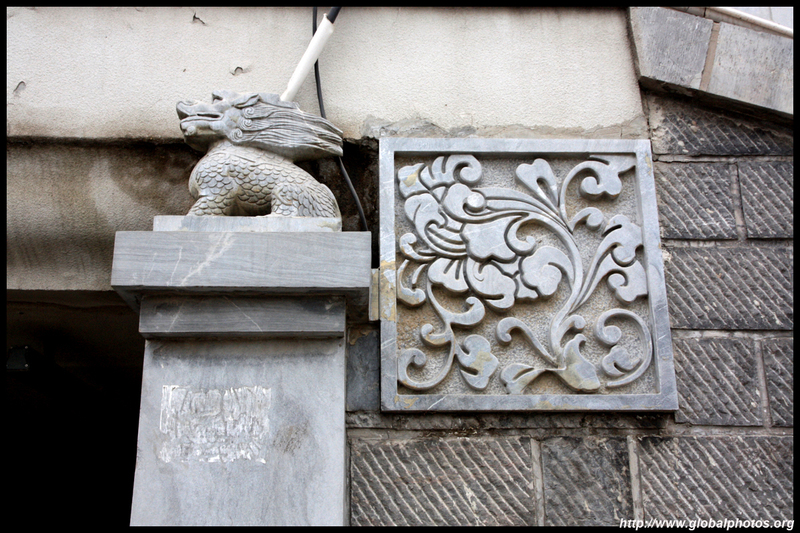 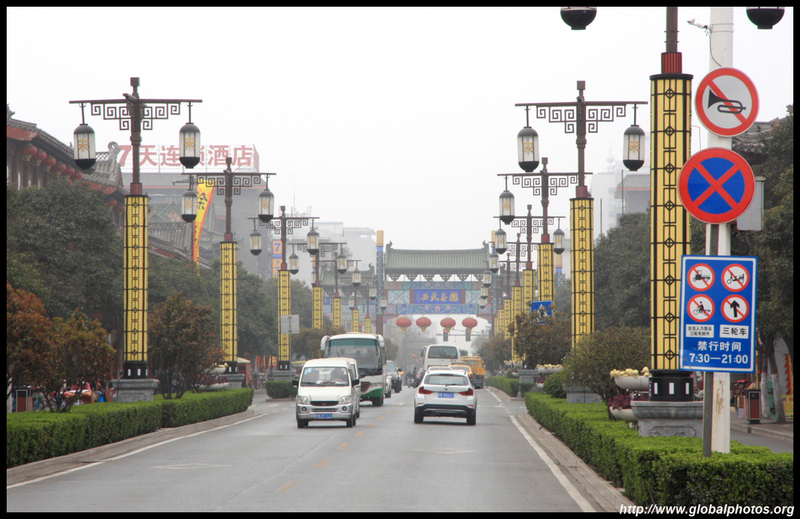 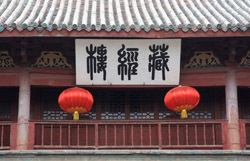 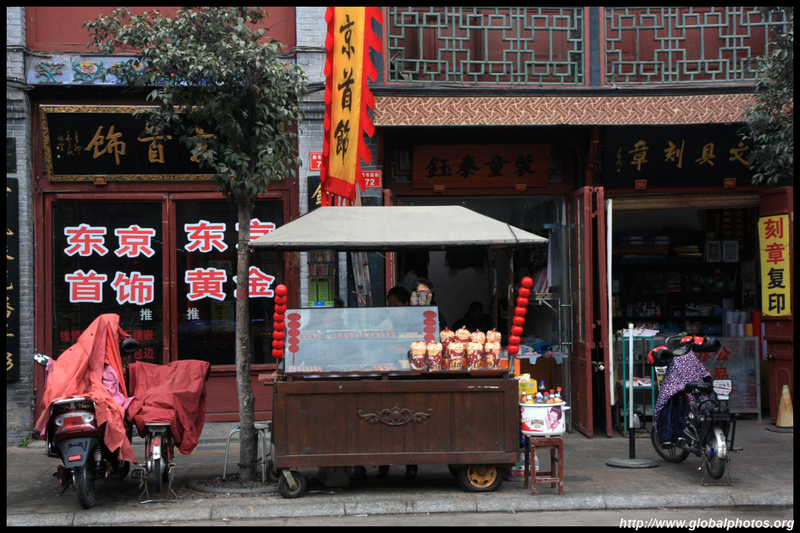 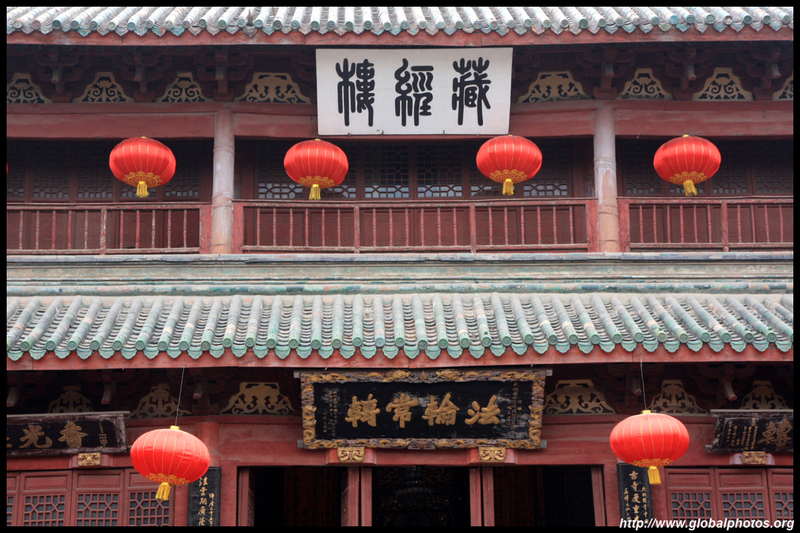 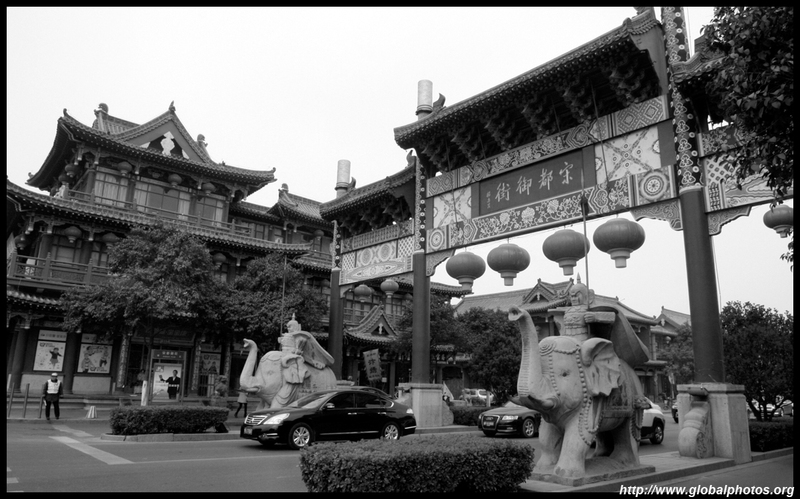 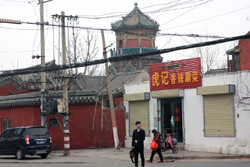 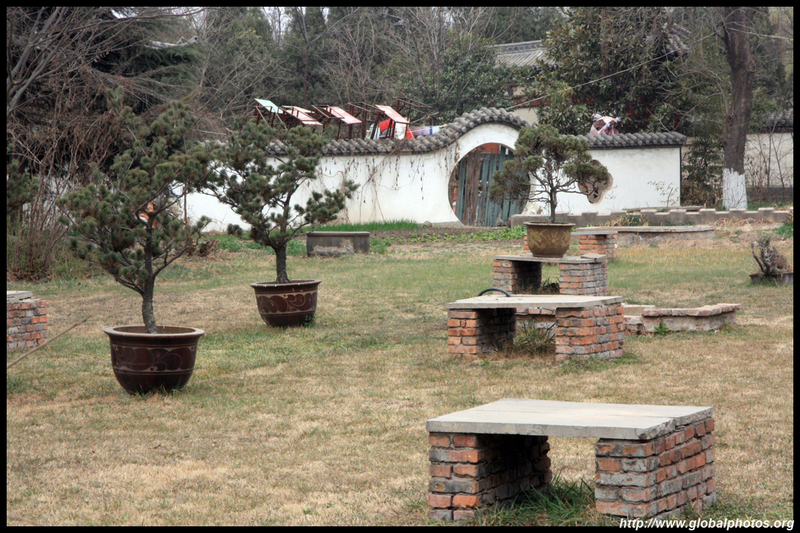 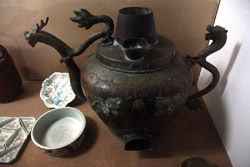 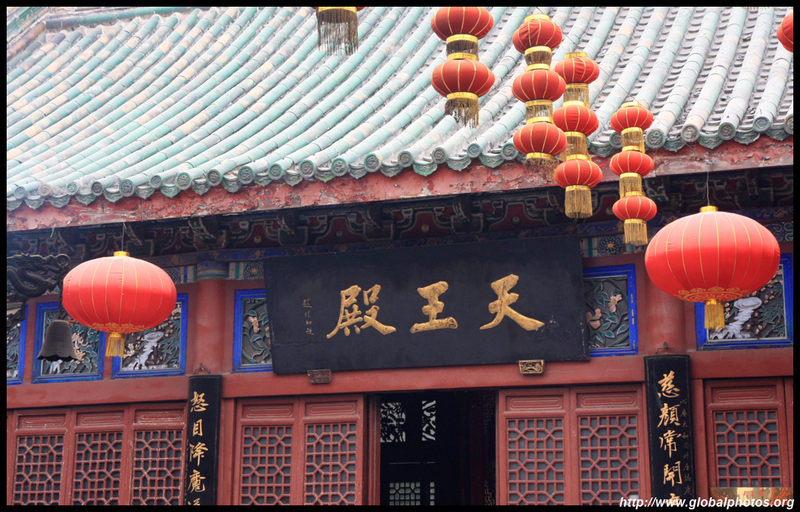 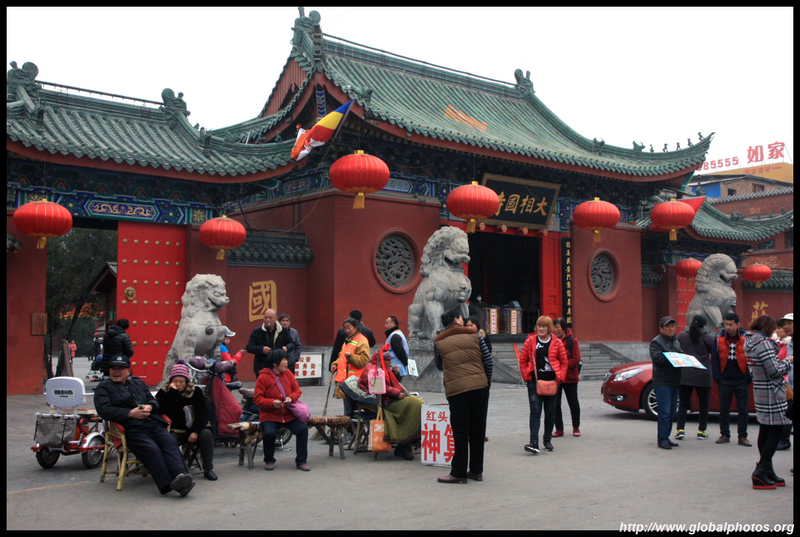 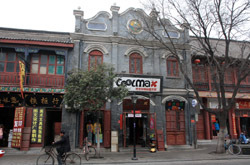 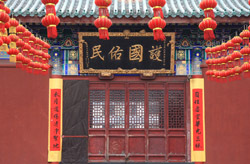 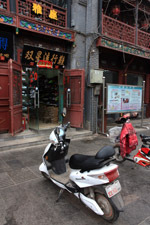 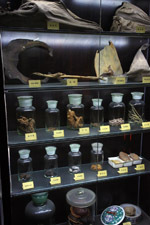 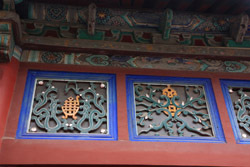 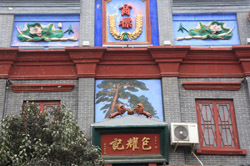 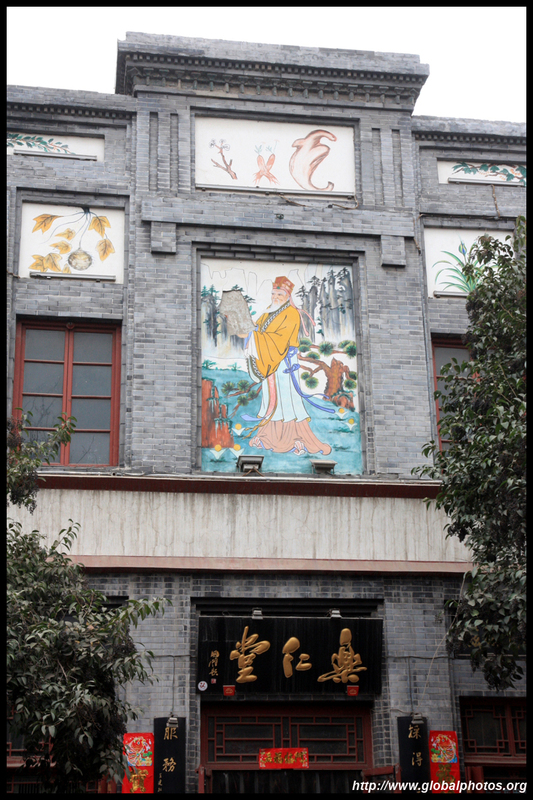 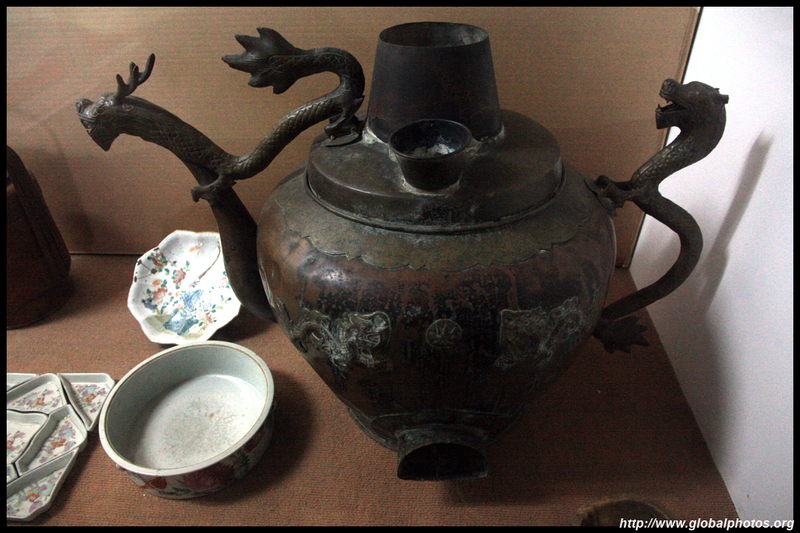 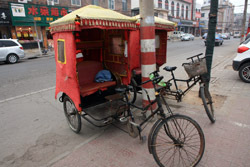 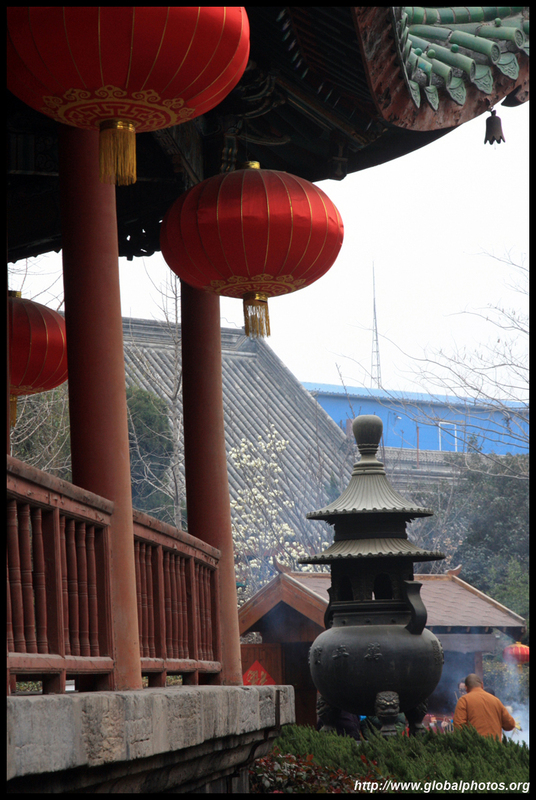 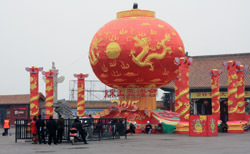 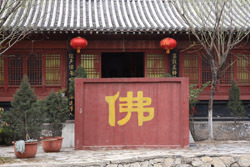 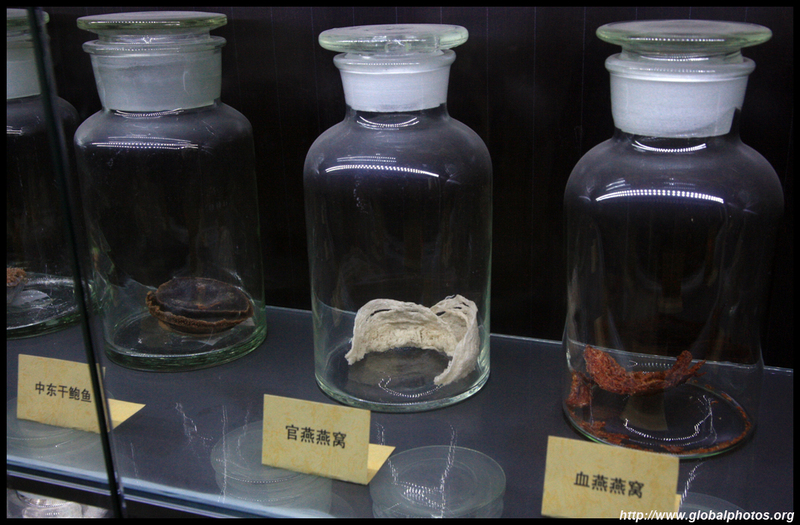 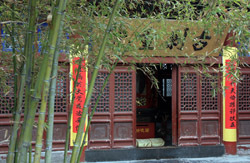 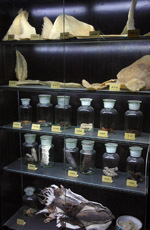 Inside the gate is a small museum on Kaifeng's famous foods and various cooking vessels. 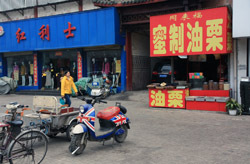 English signs were lacking though. 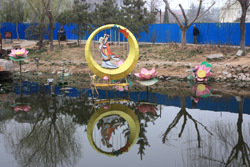 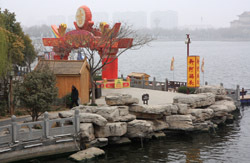 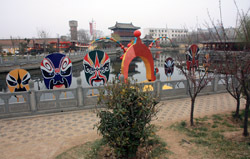 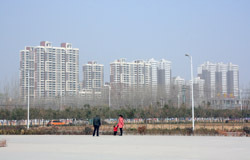 The nearby riverfront has been beautified into a park. 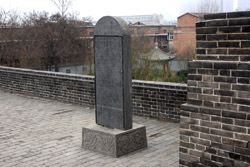 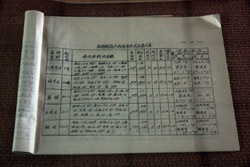 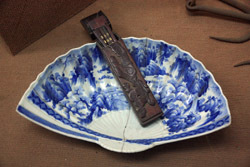 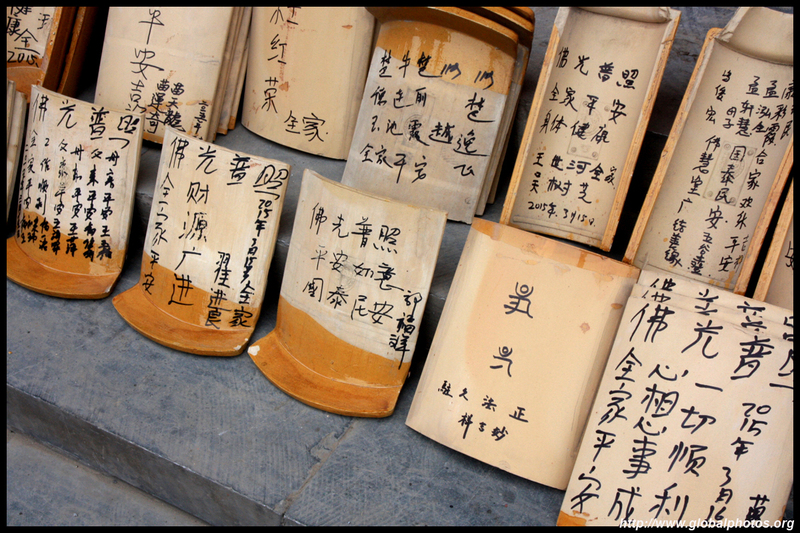 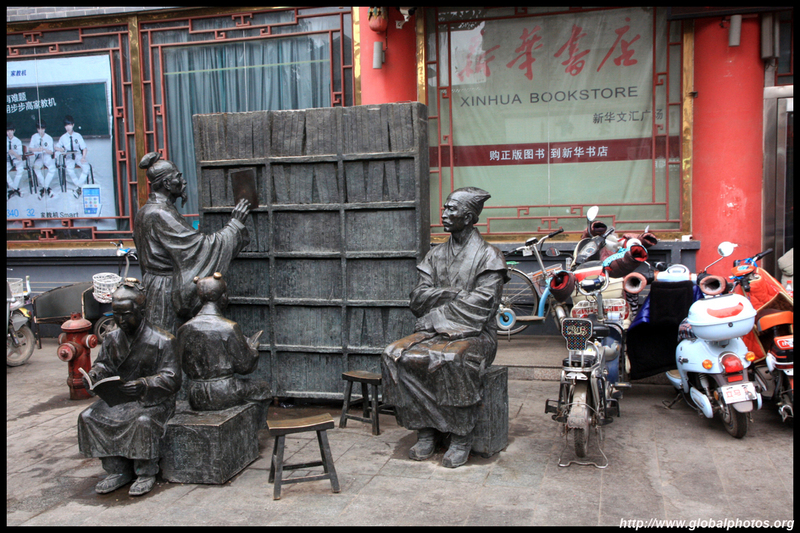 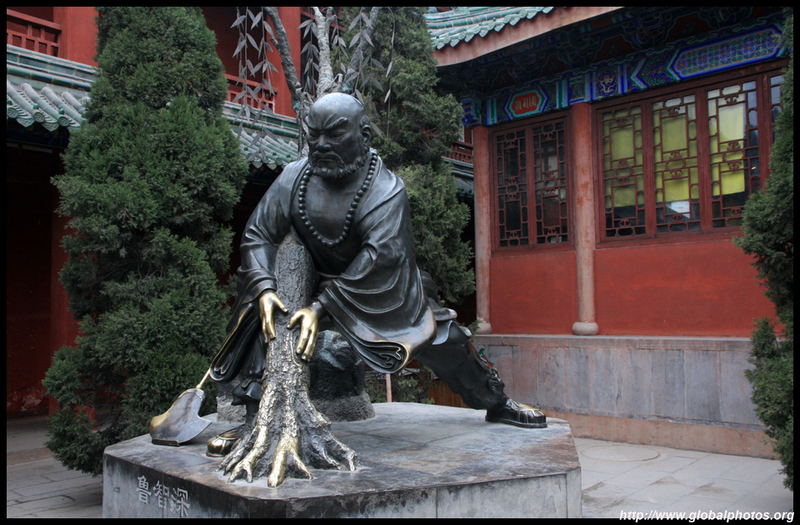 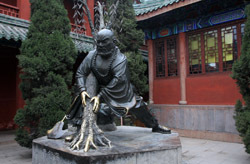 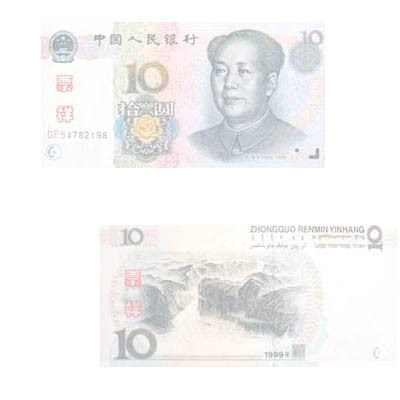 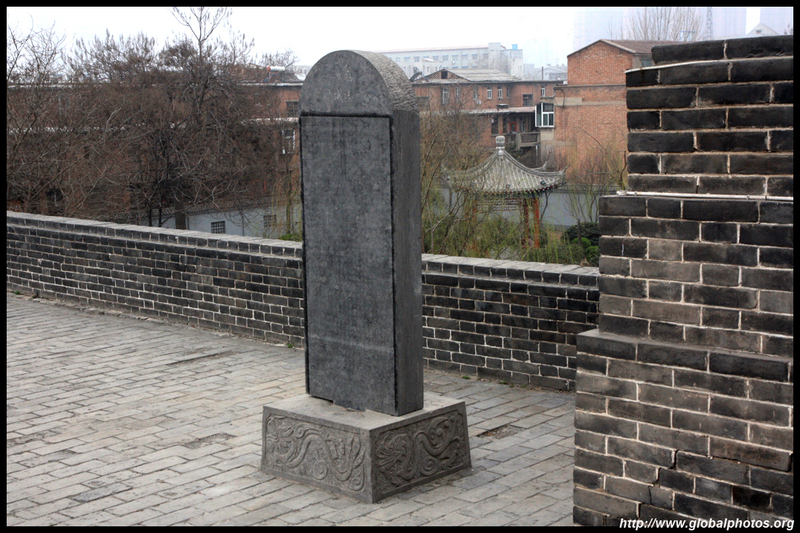 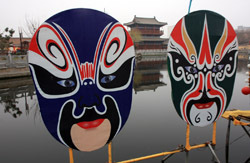 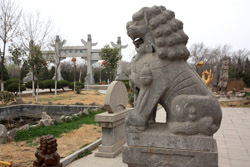 Baogong is a famous official from the Song Dynasty that battled corruption and earned great respect from the public. 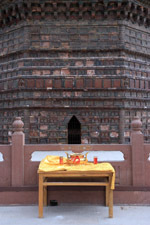 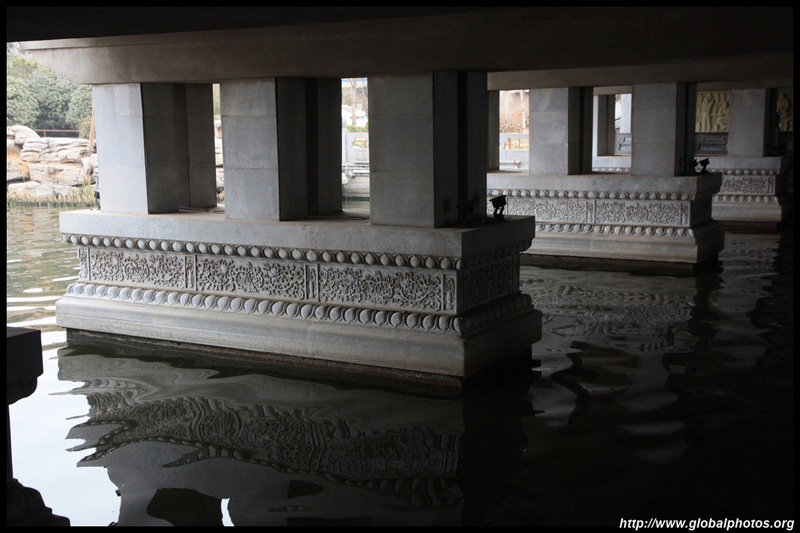 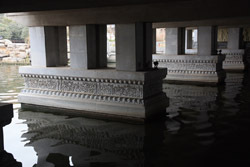 The original temple dedicated to him is long gone, so this structure is a recent reconstruction - a "fake". 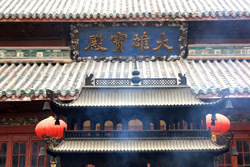 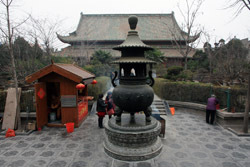 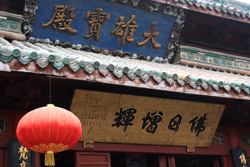 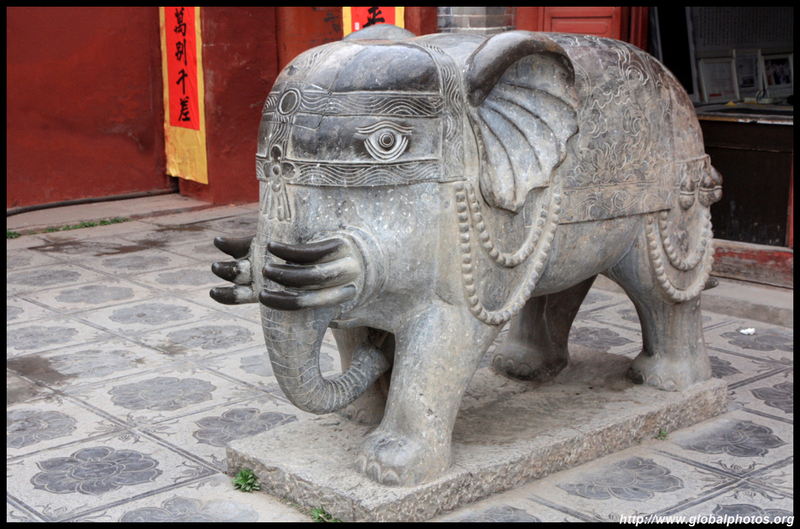 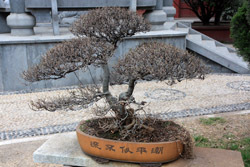 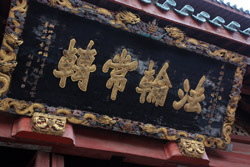 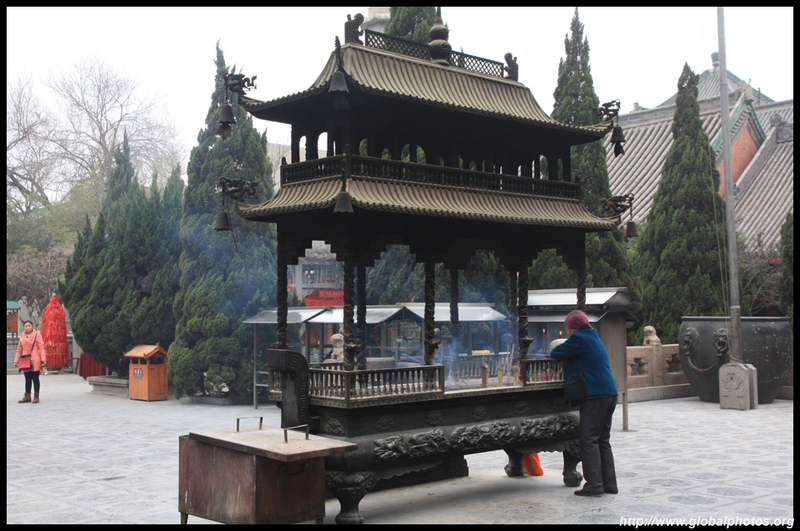 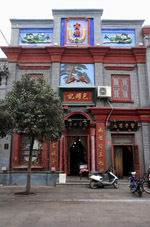 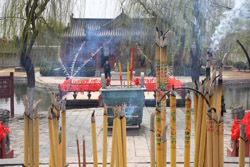 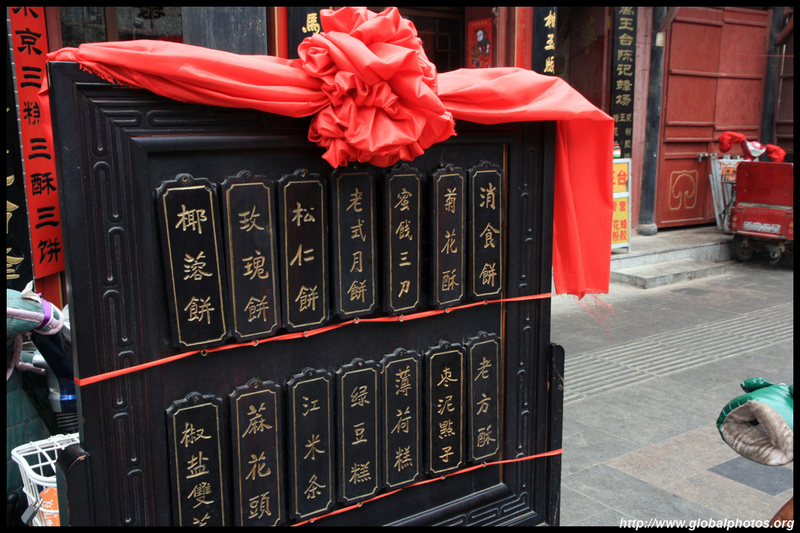 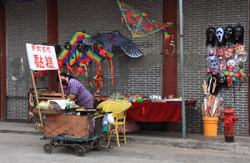 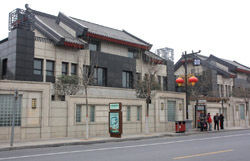 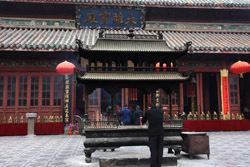 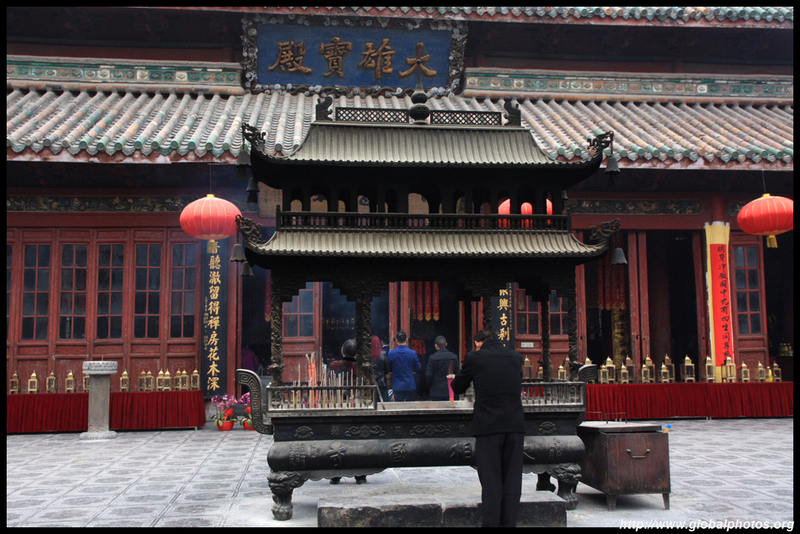 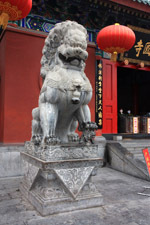 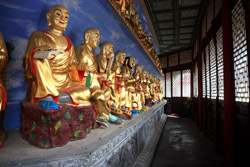 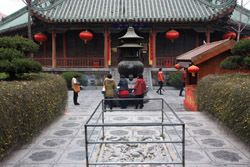 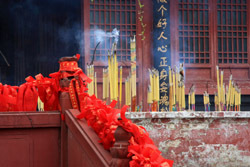 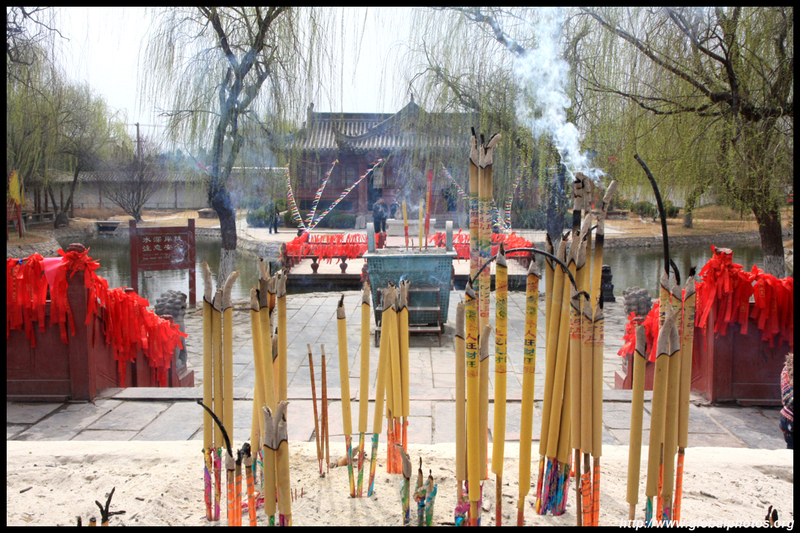 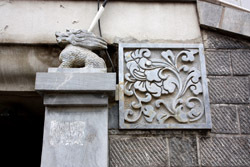 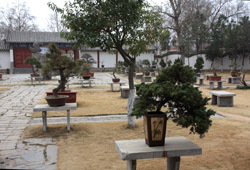 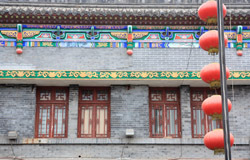 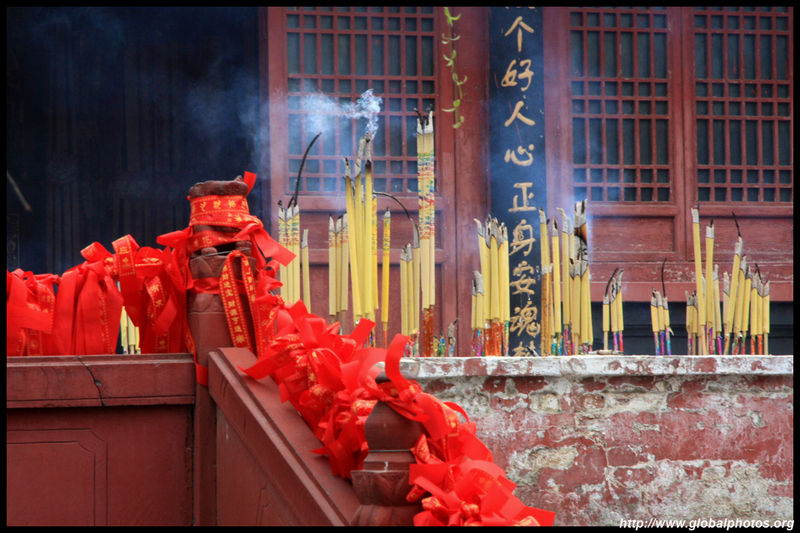 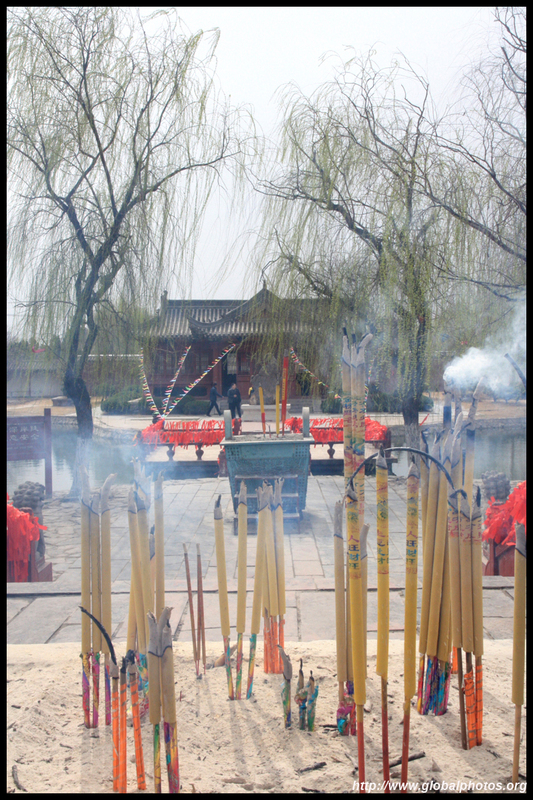 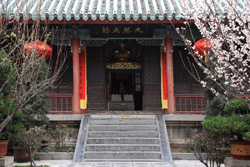 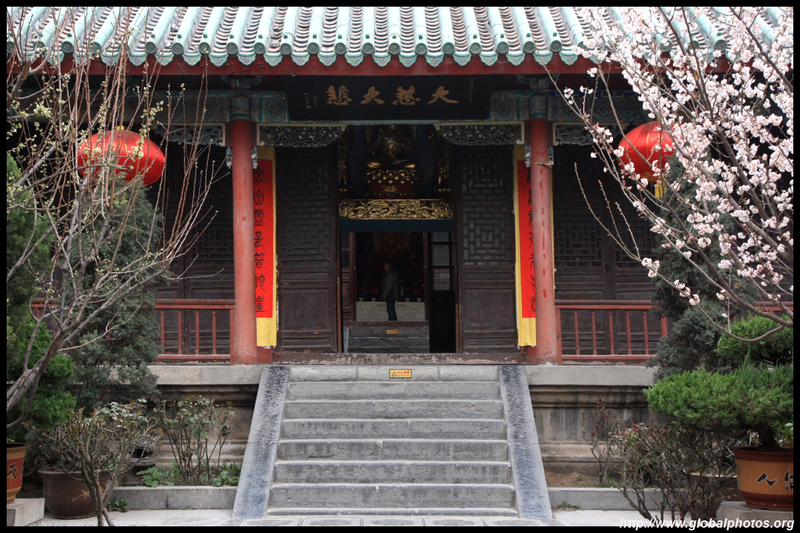 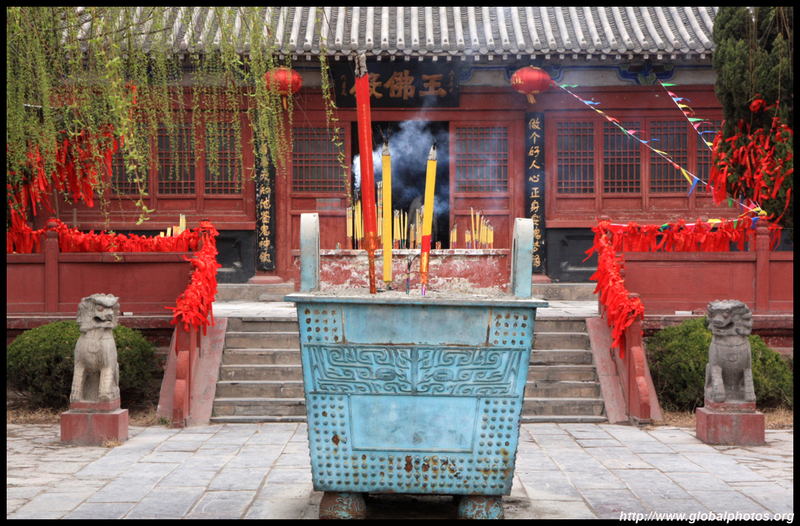 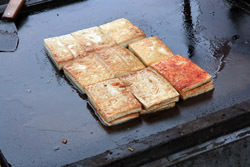 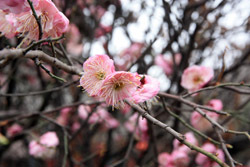 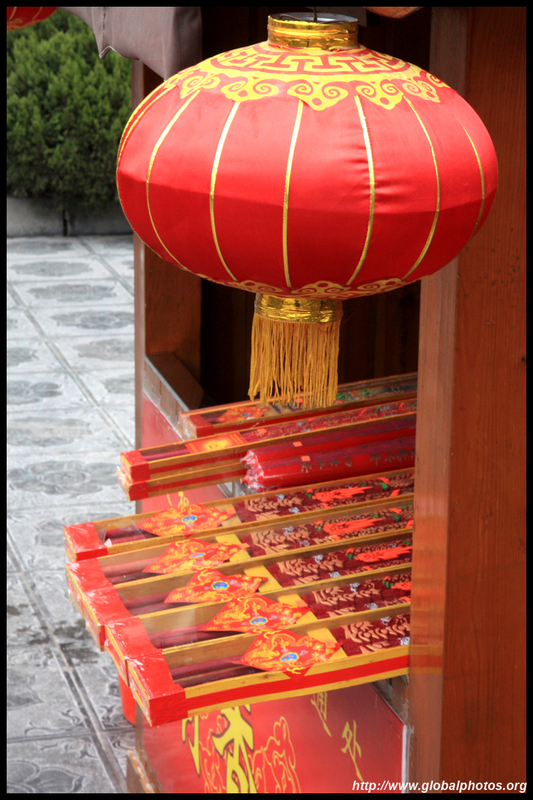 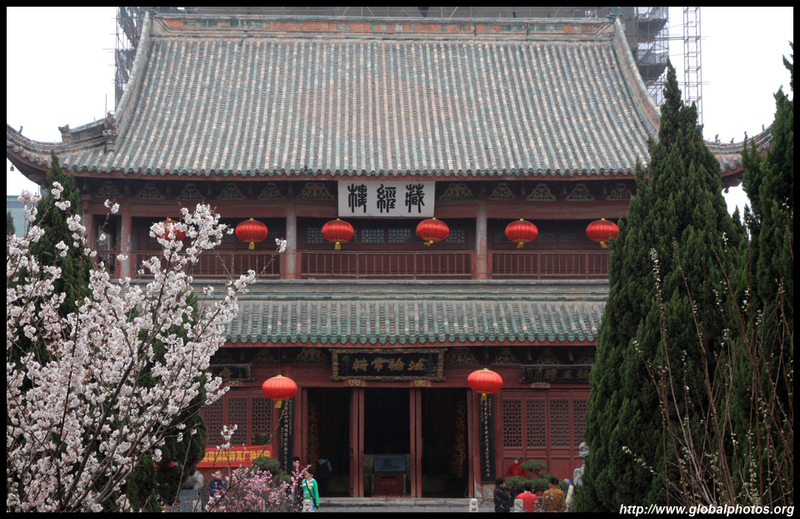 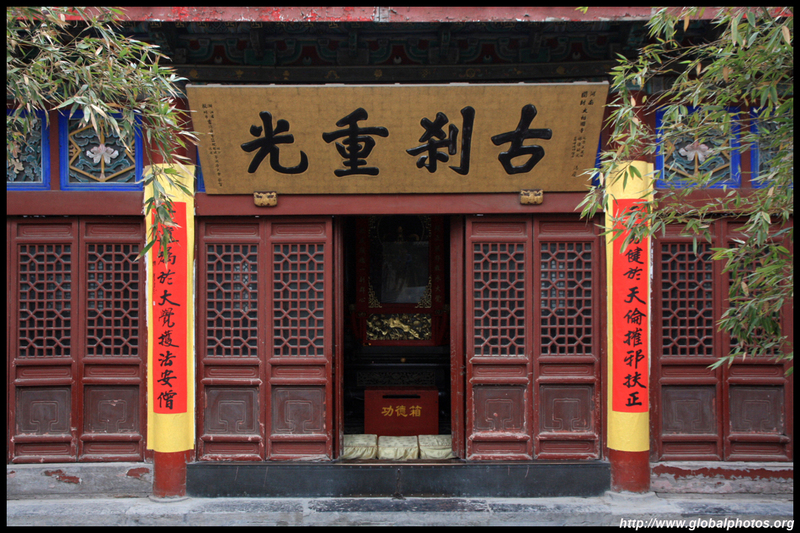 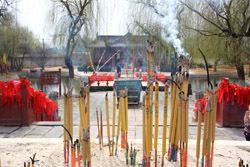 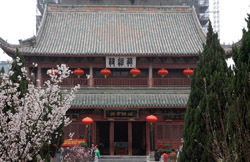 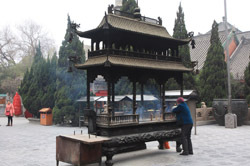 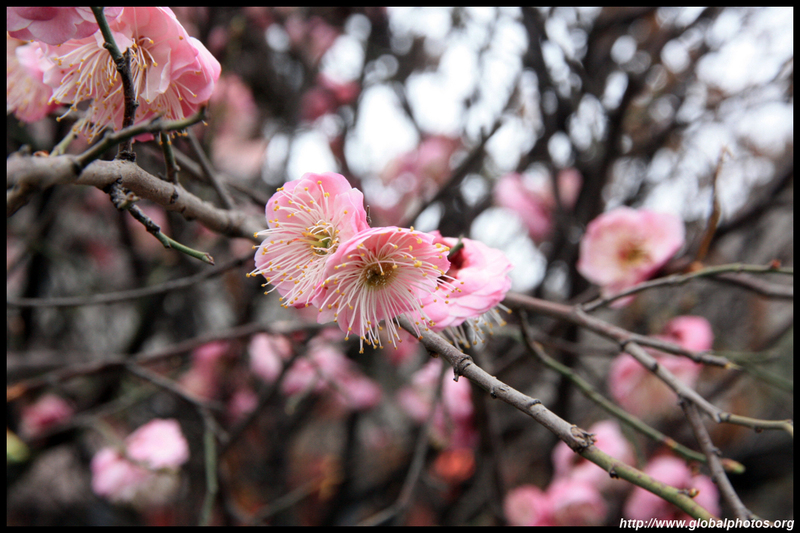 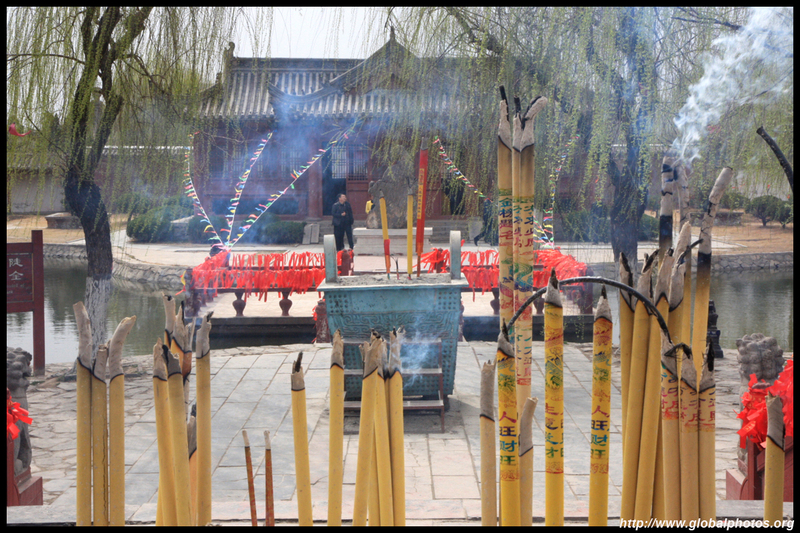 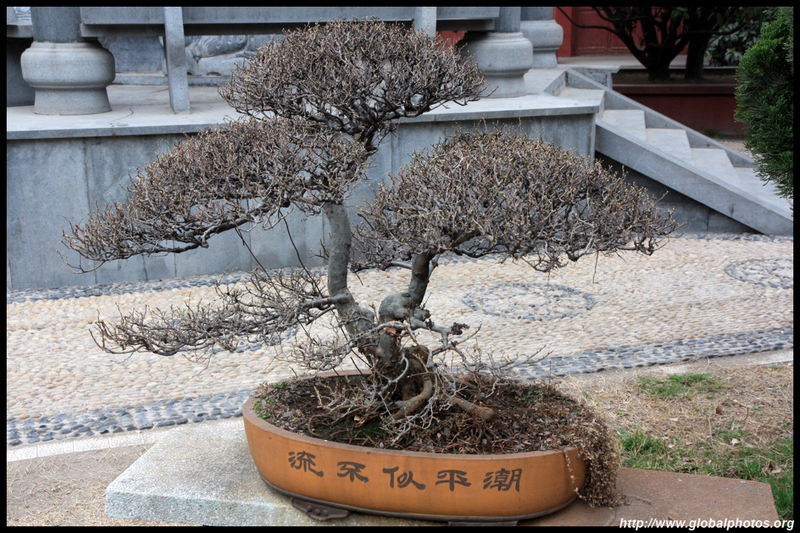 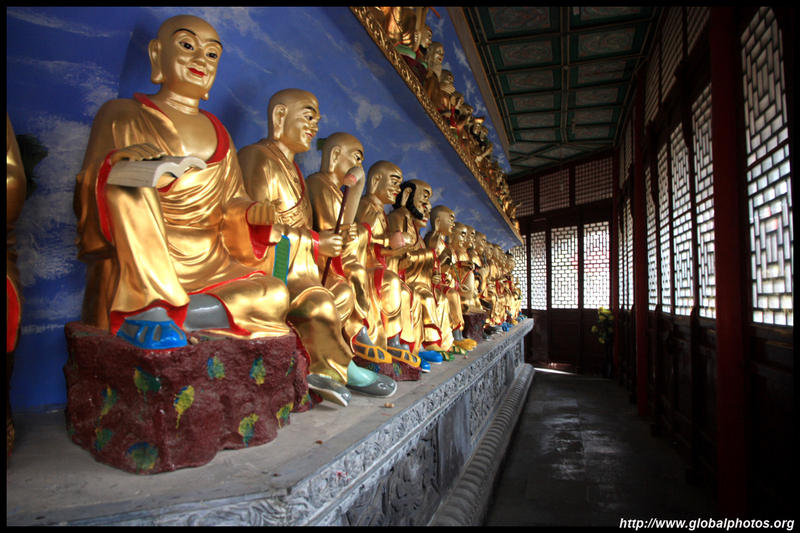 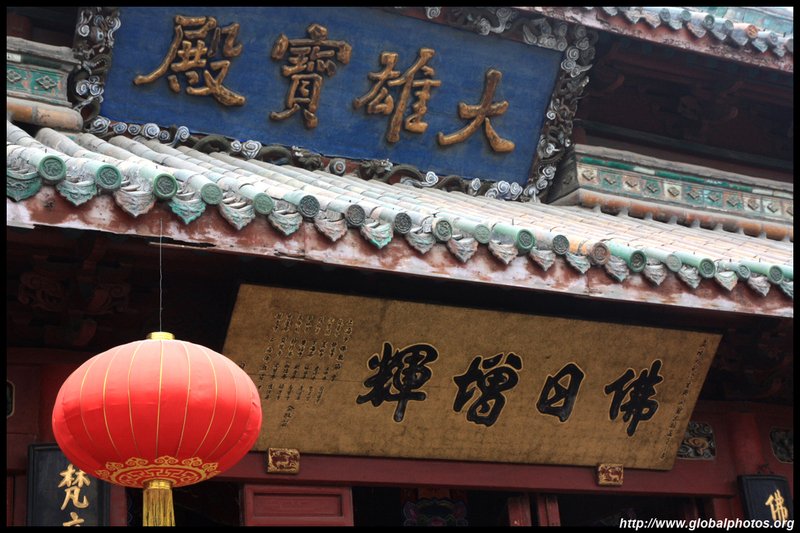 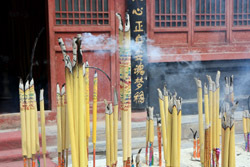 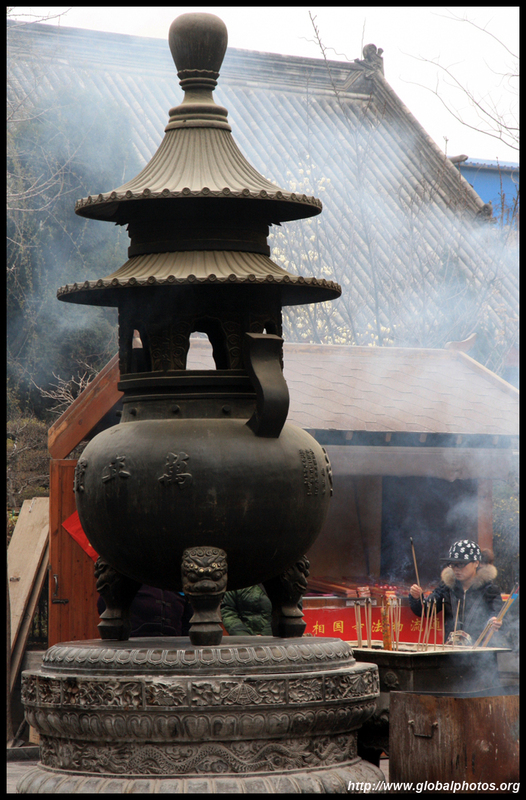 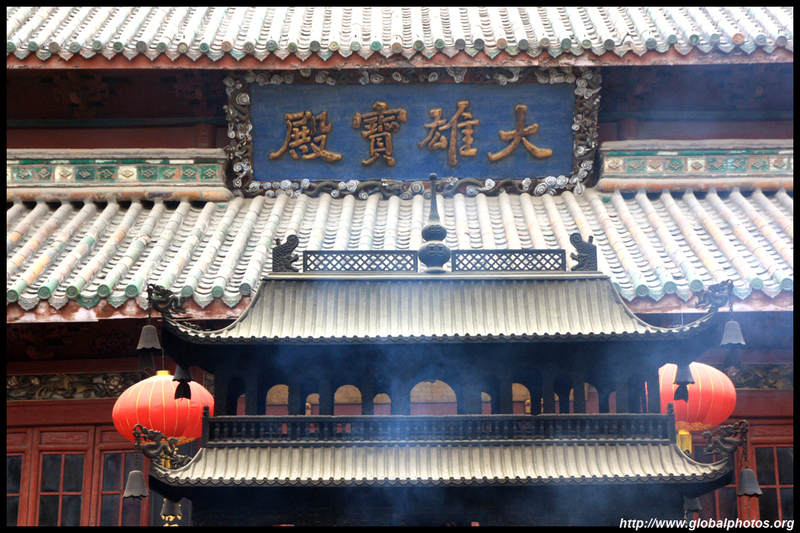 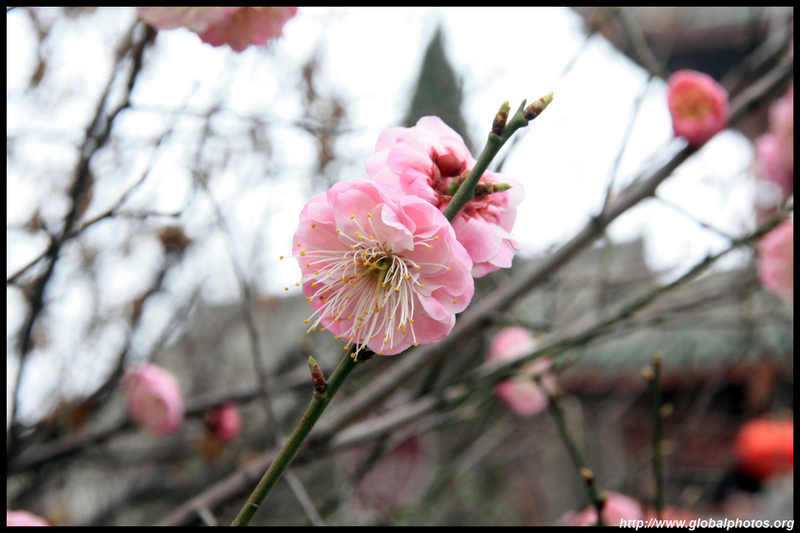 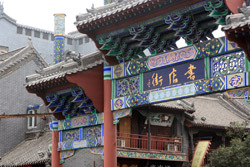 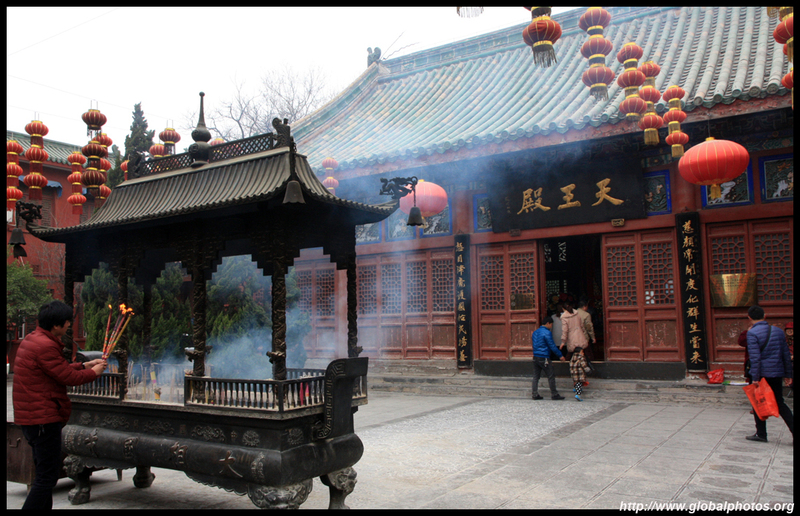 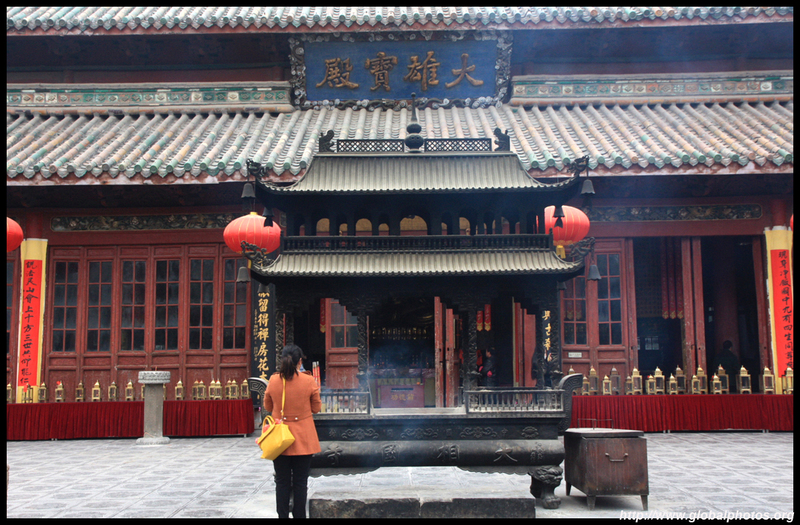 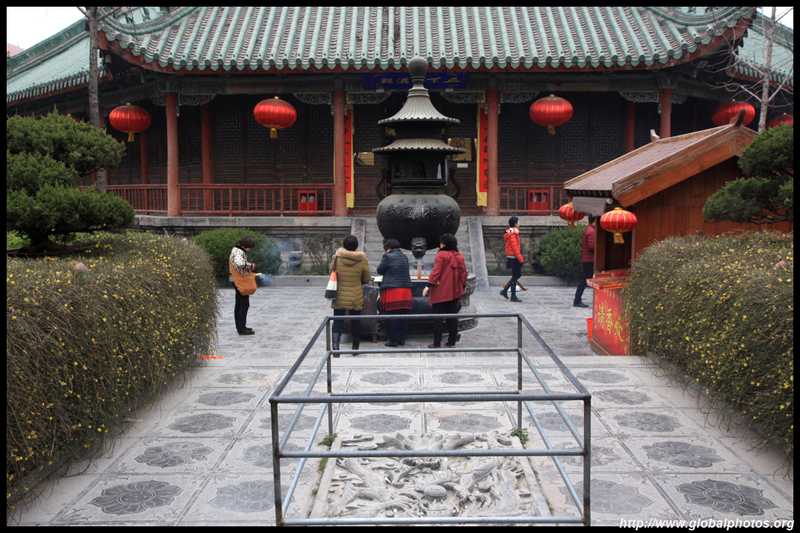 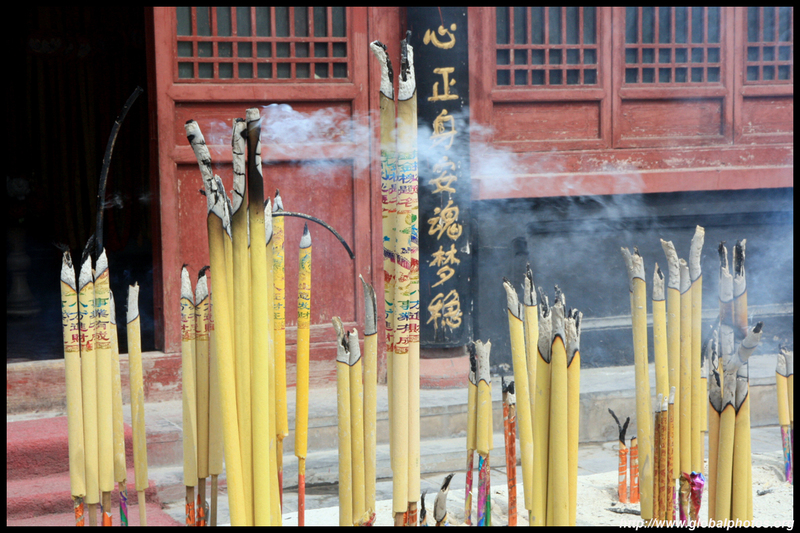 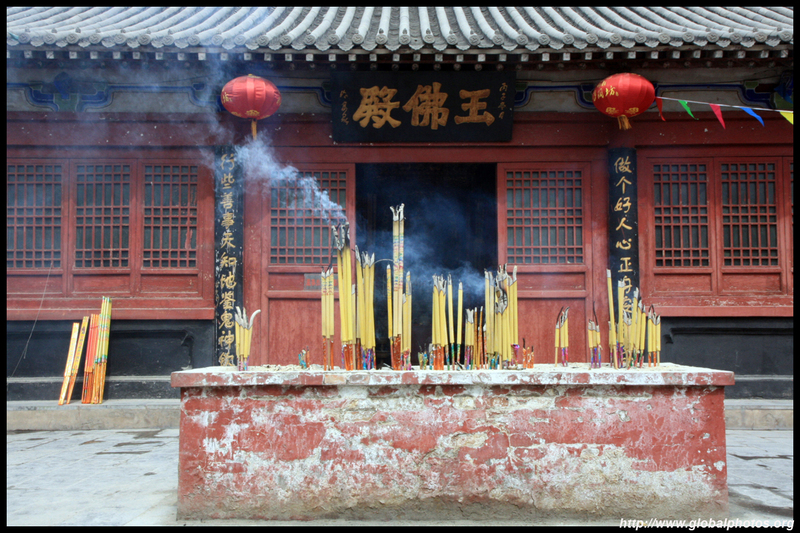 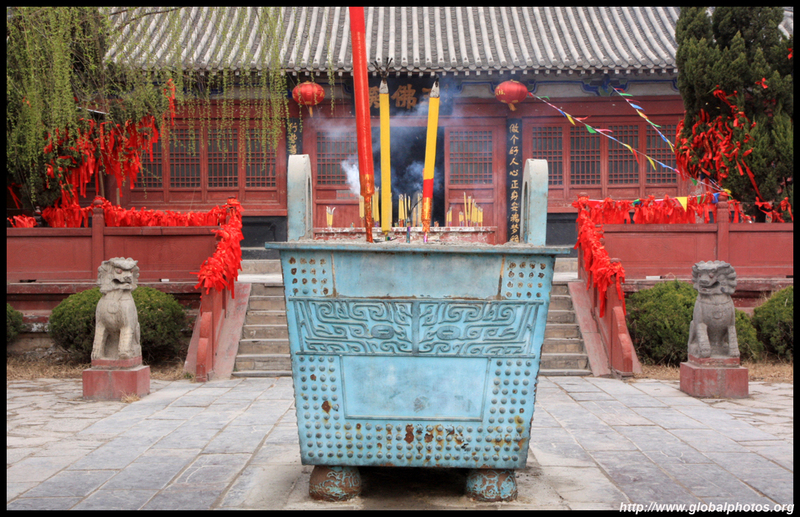 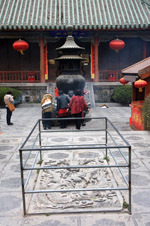 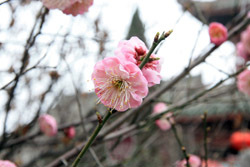 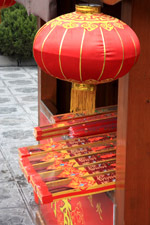 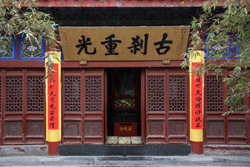 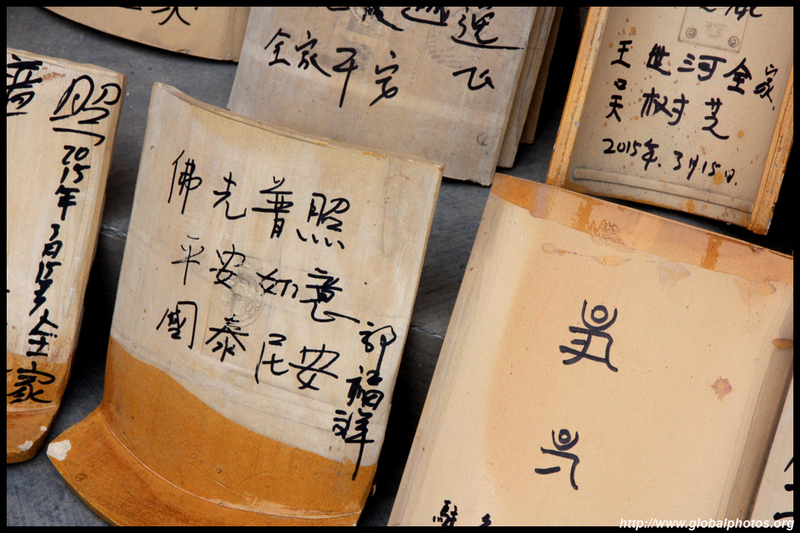 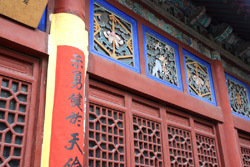 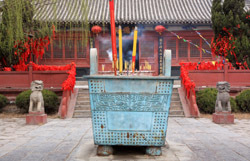 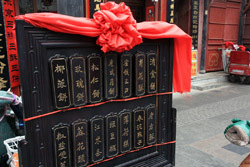 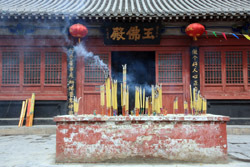 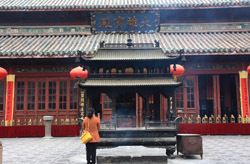 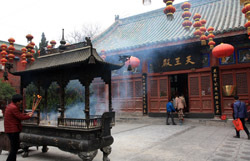 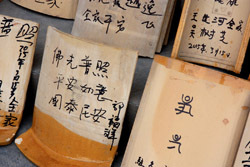 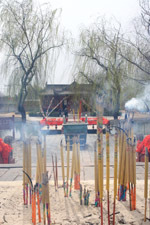 Daxiangguo is a popular local temple whose history goes back to the 6th century, although the current facility mainly dates from the Qing Dynasty. I didn't think it was worth a hefty admission to see a regular temple in action though. 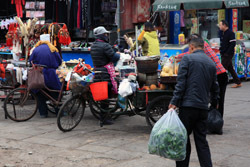 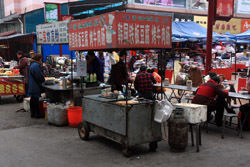 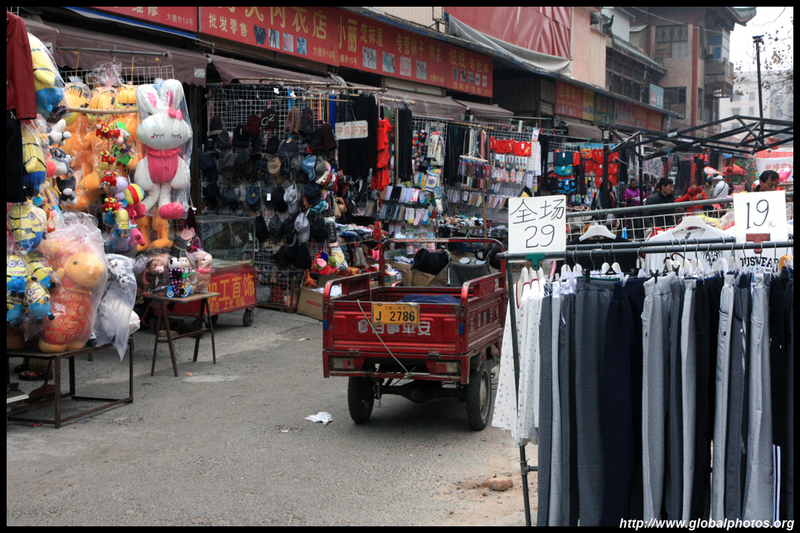 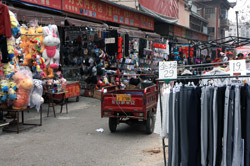 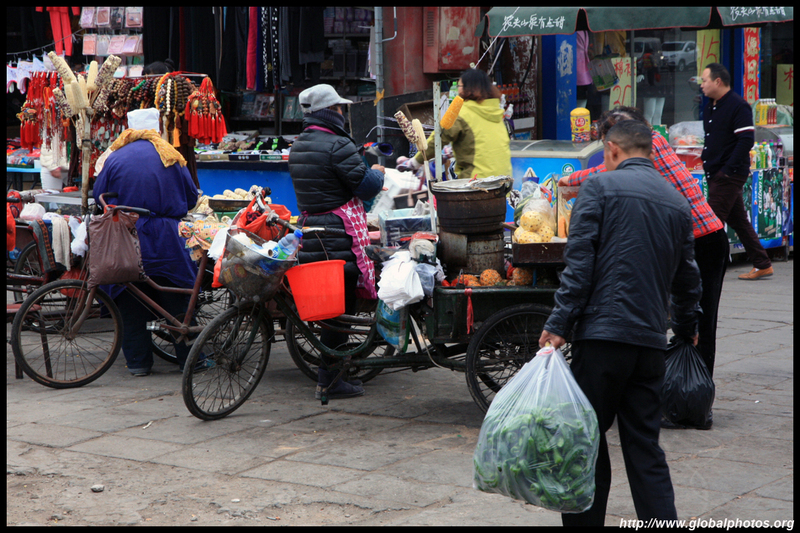 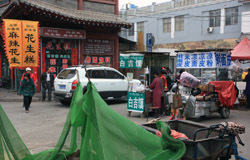 There is a bustling market next door with lots of food and clothing available for sale. 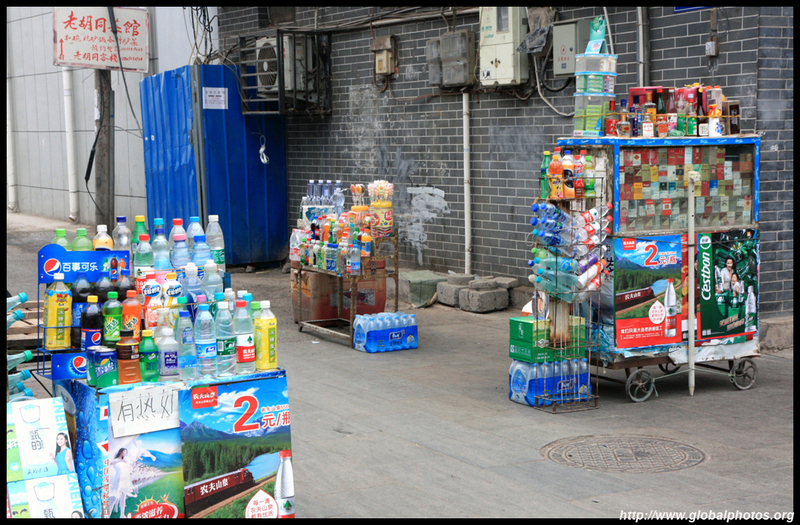 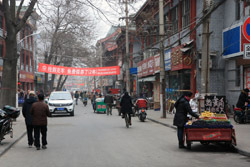 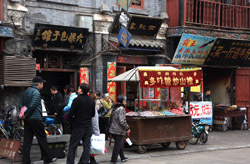 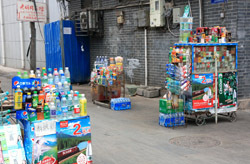 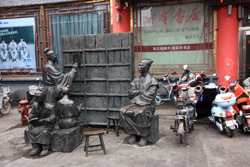 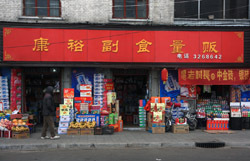 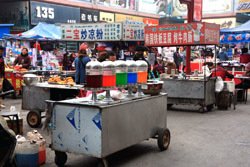 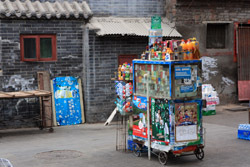 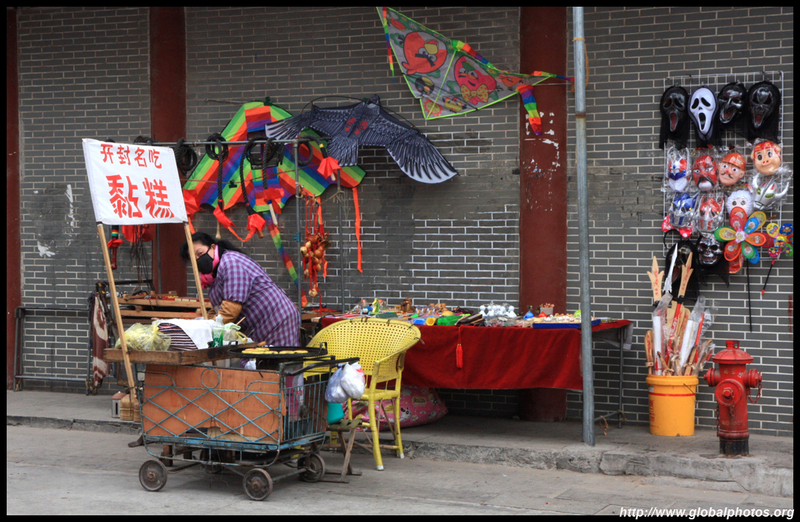 "Bookstore Street" has been revitalized and is now mostly selling non-book items. 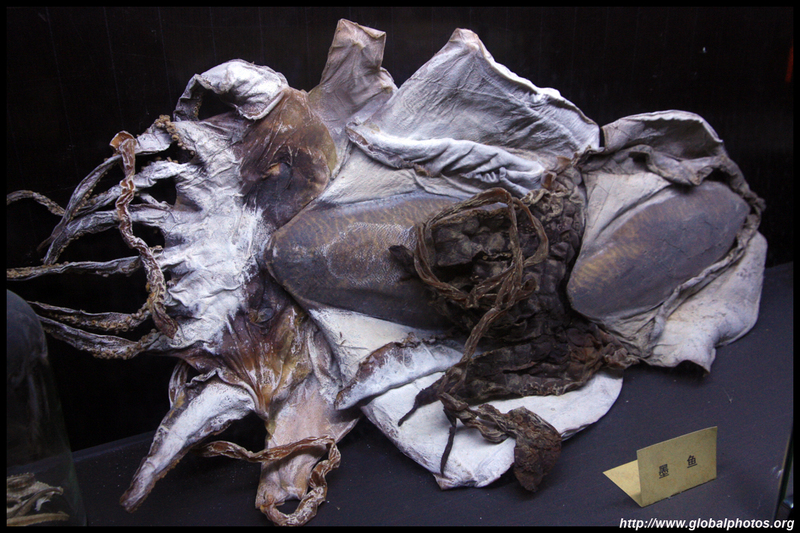 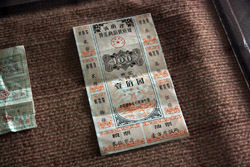 I'm not a big fan of this type of commercialization / preservation. 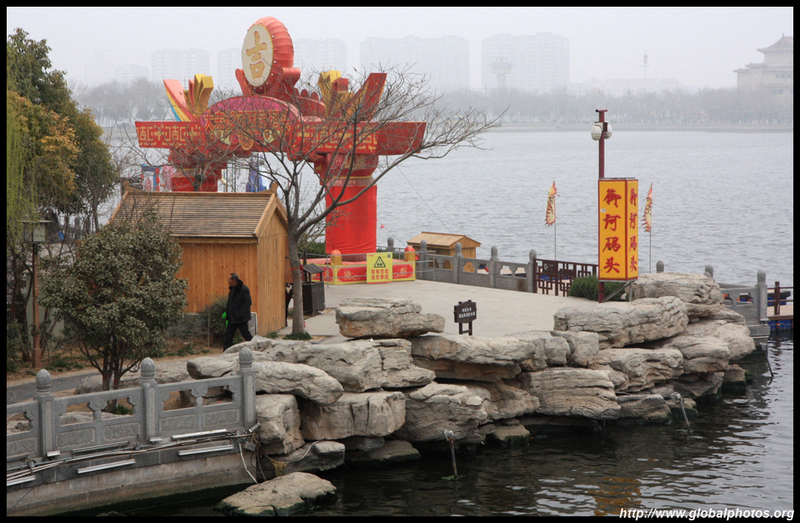 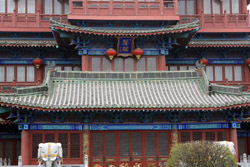 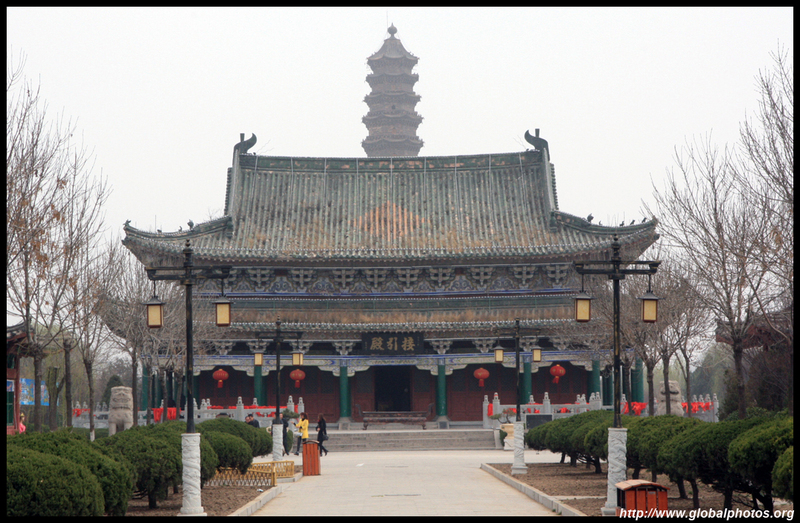 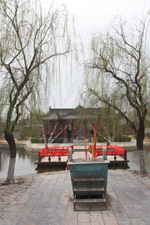 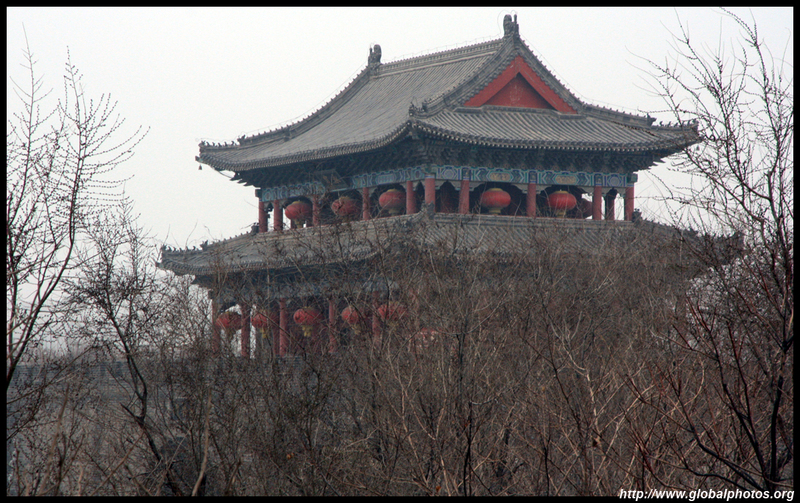 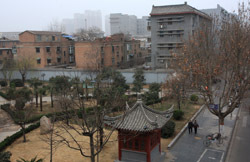 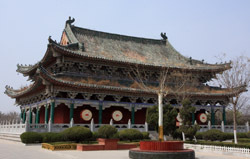 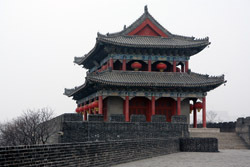 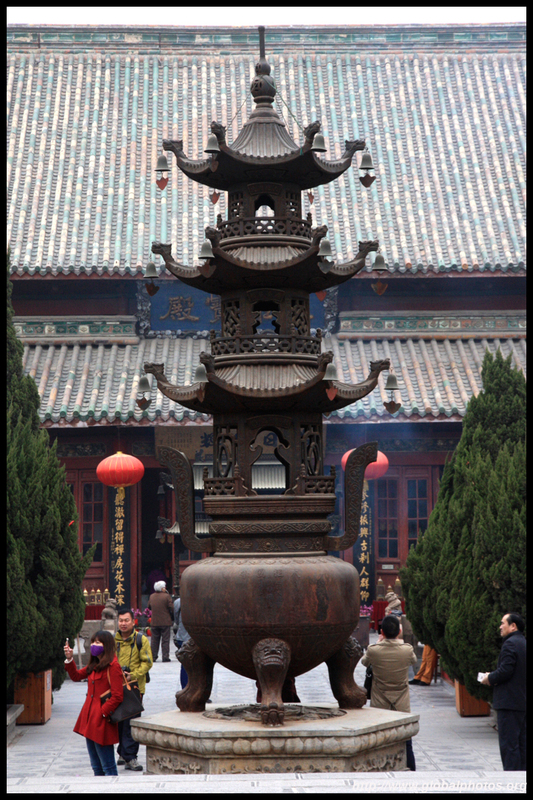 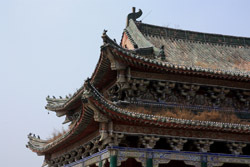 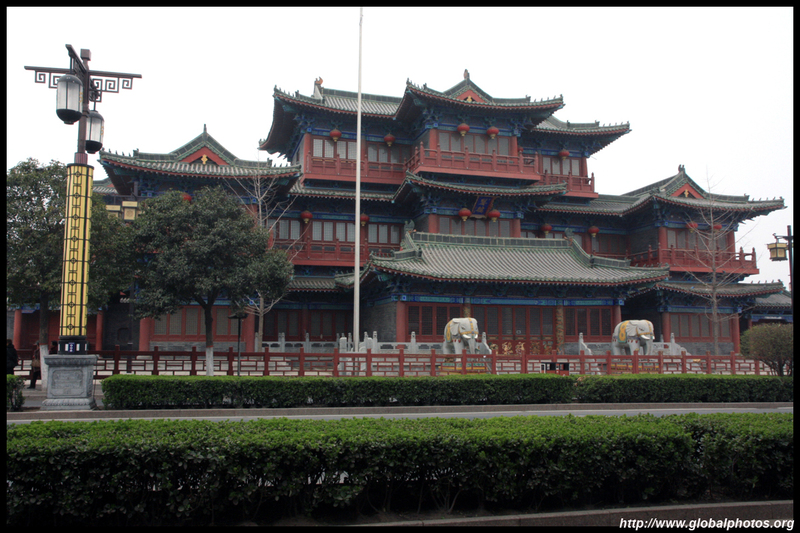 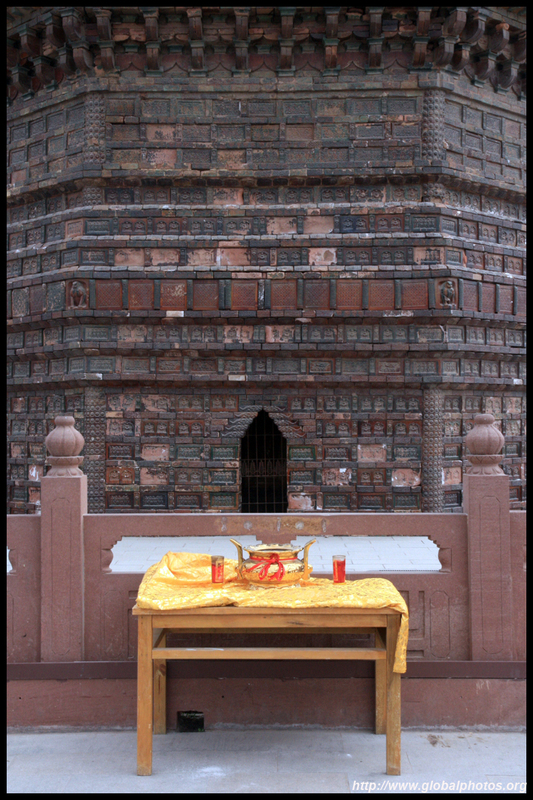 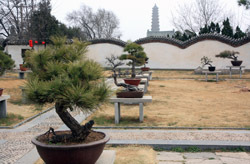 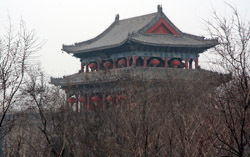 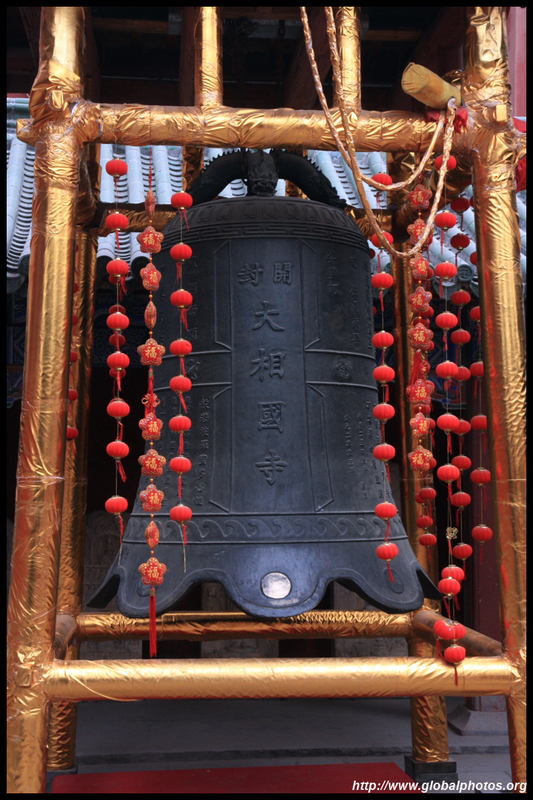 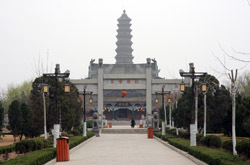 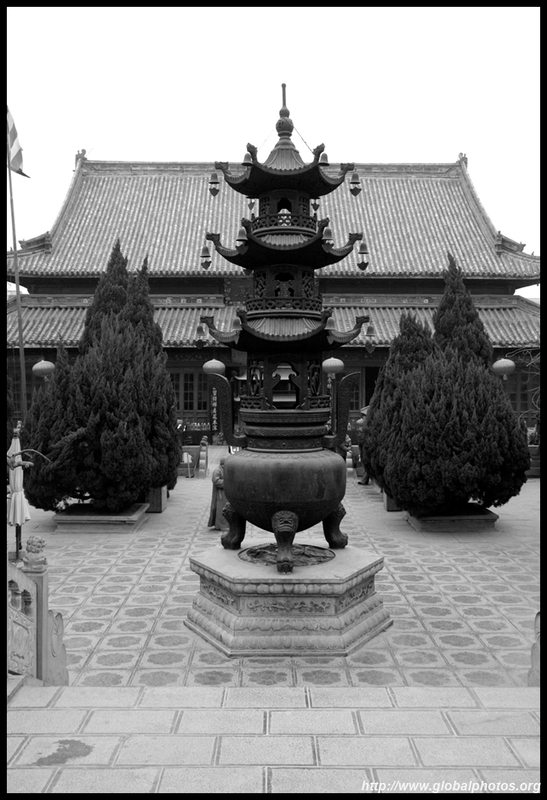 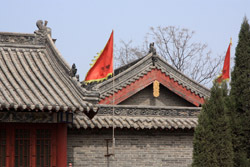 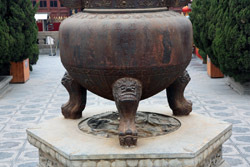 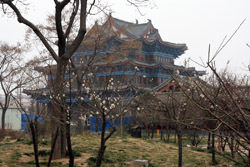 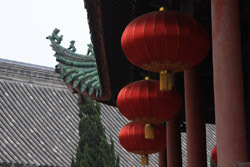 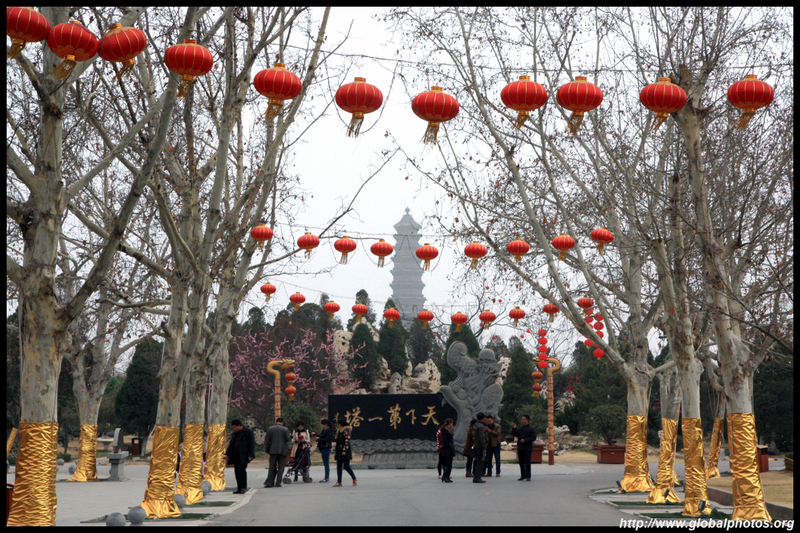 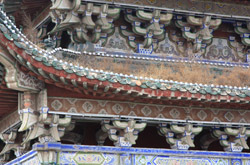 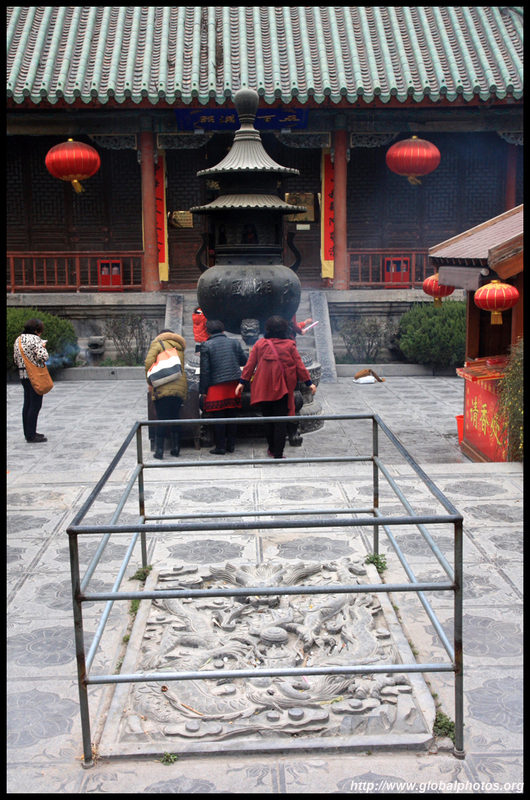 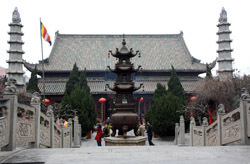 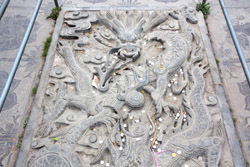 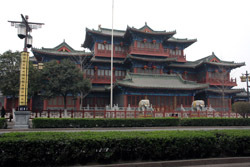 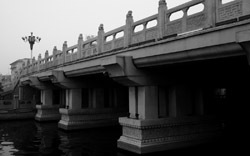 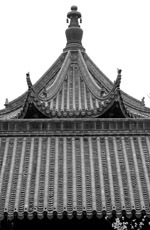 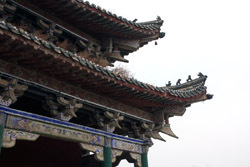 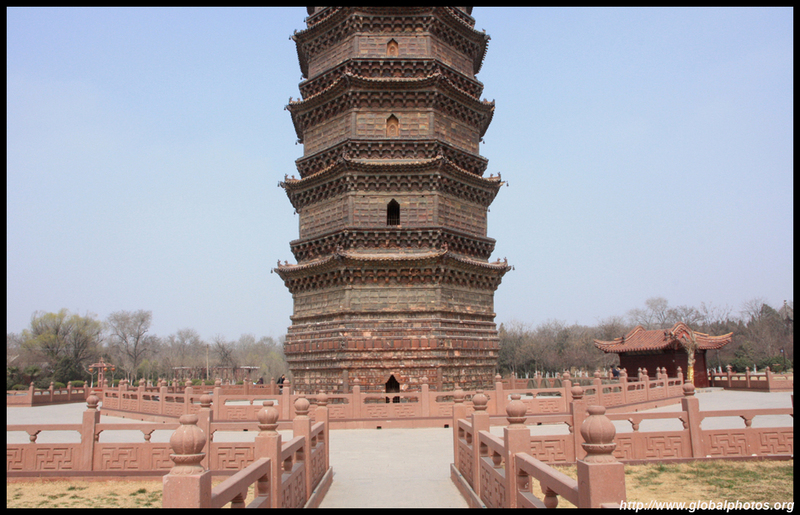 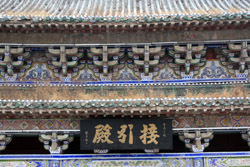 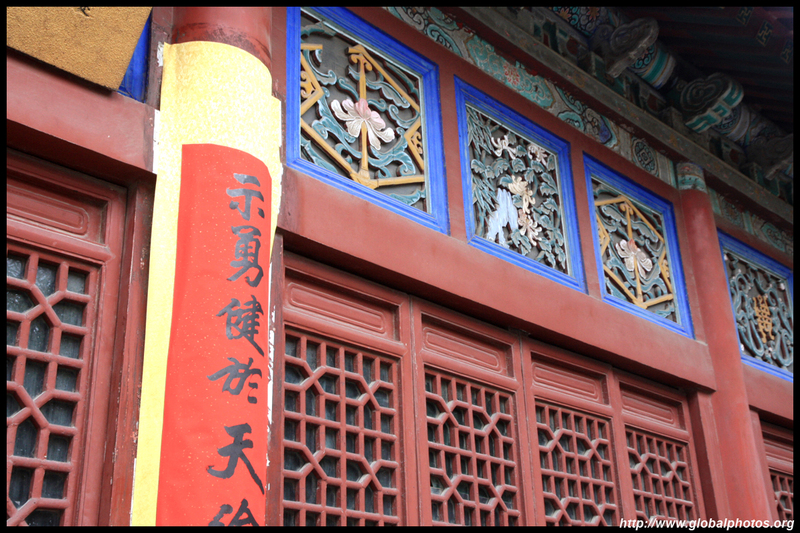 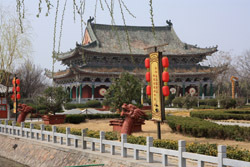 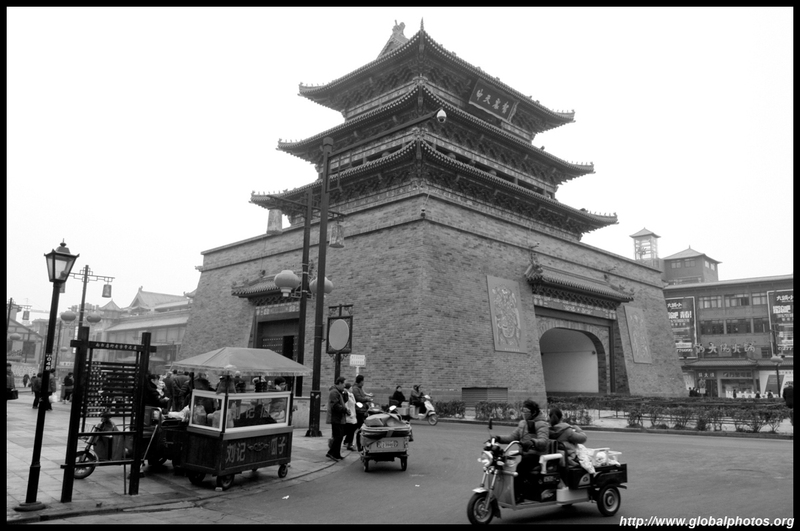 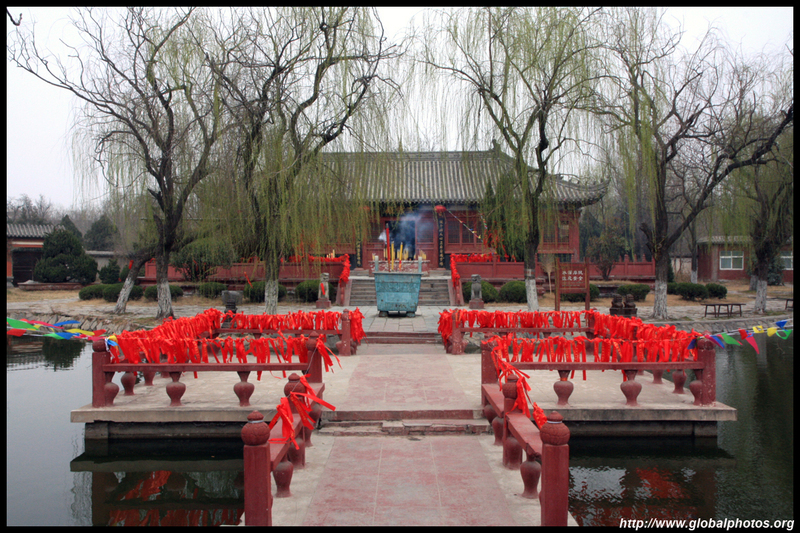 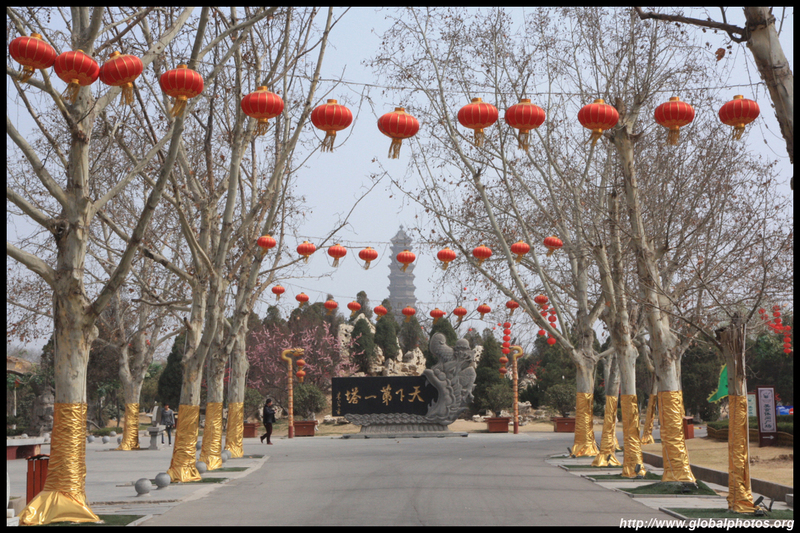 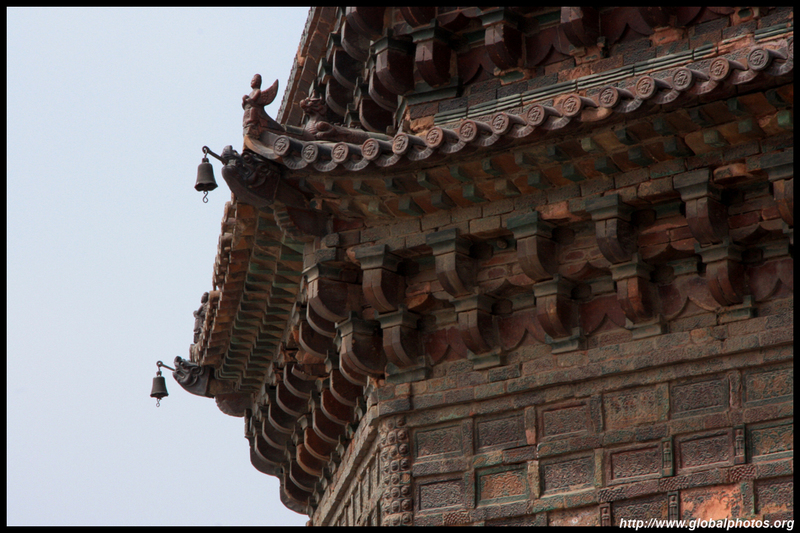 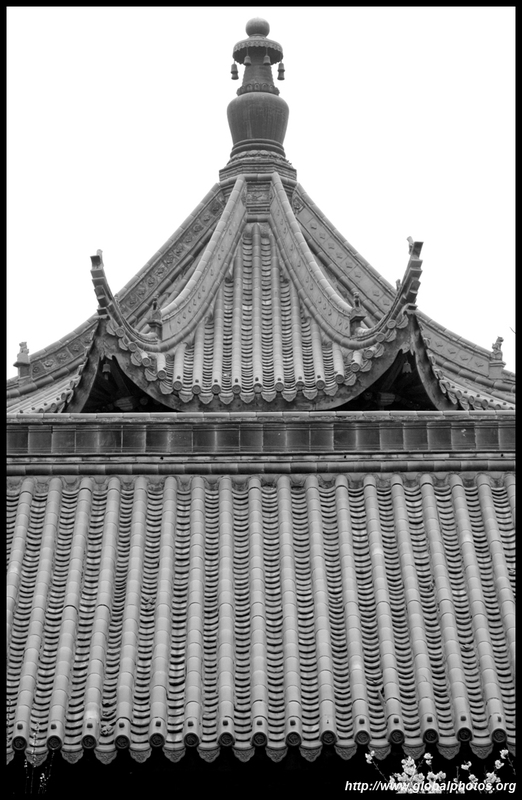 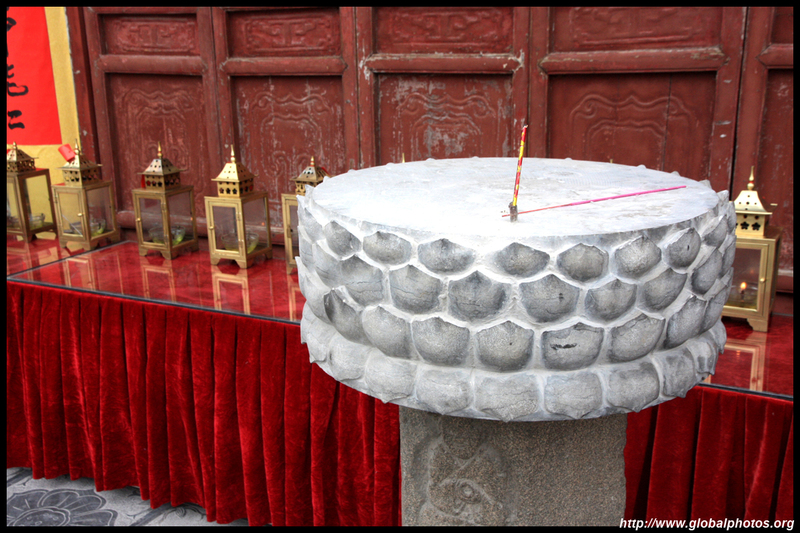 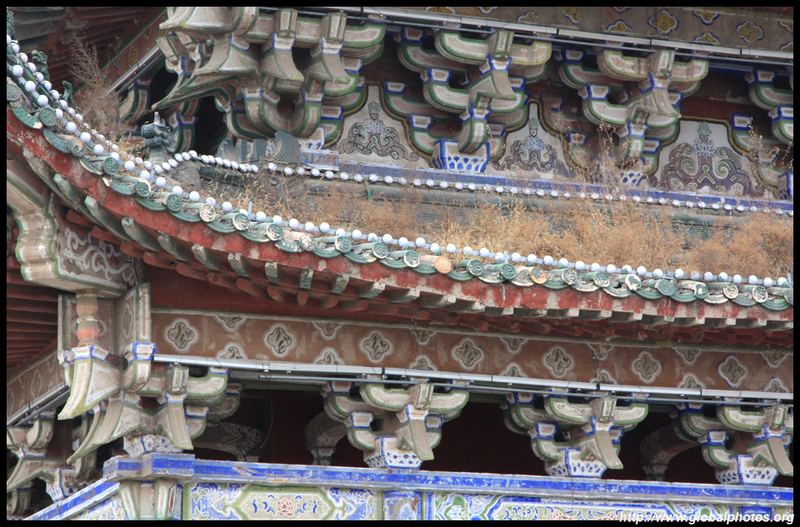 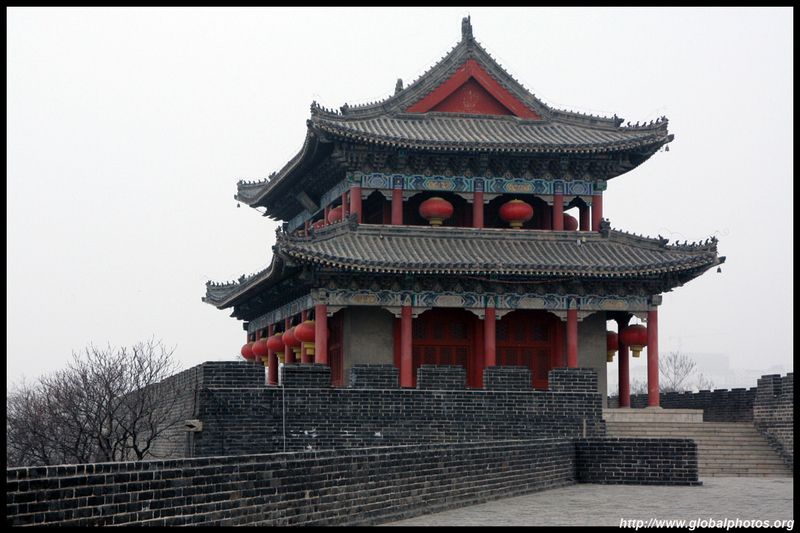 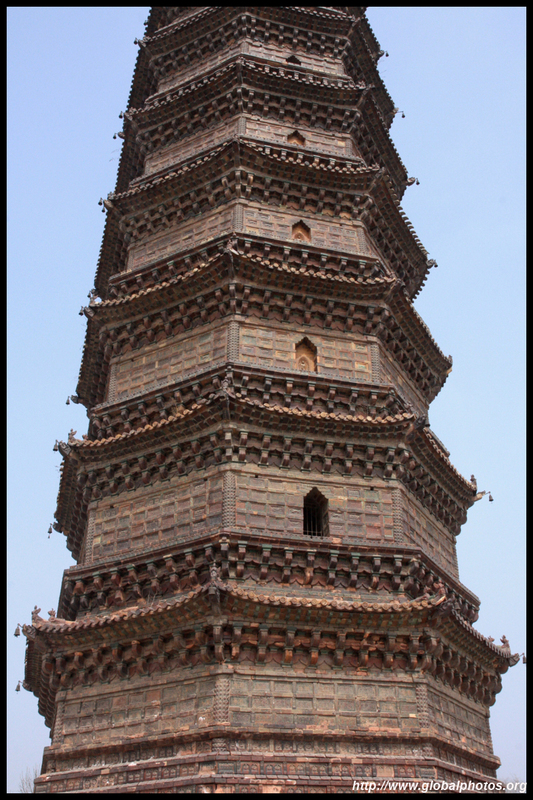 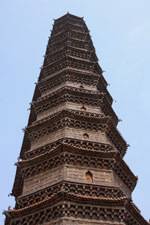 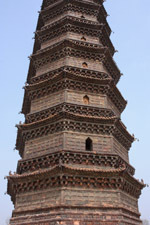 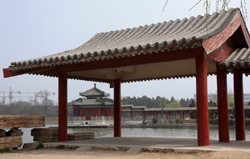 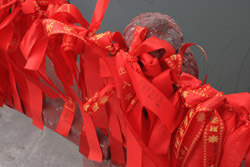 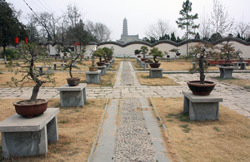 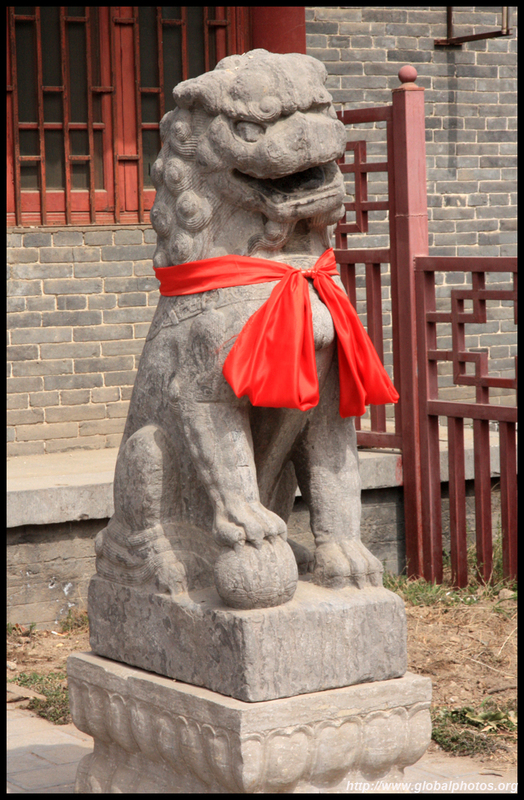 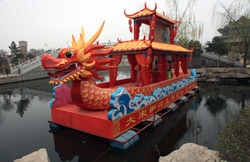 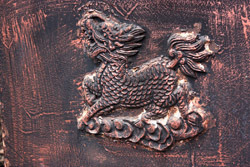 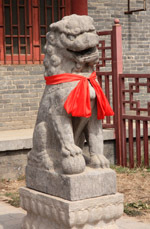 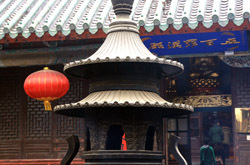 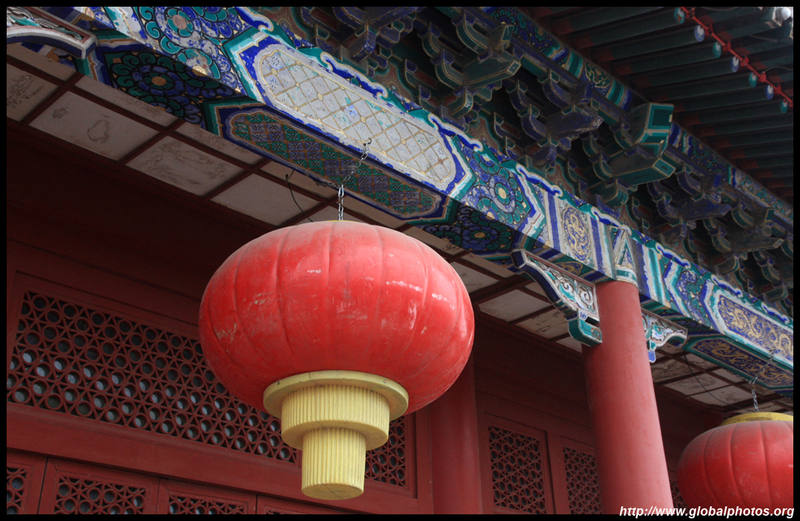 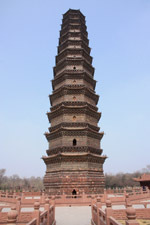 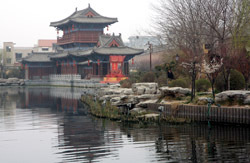 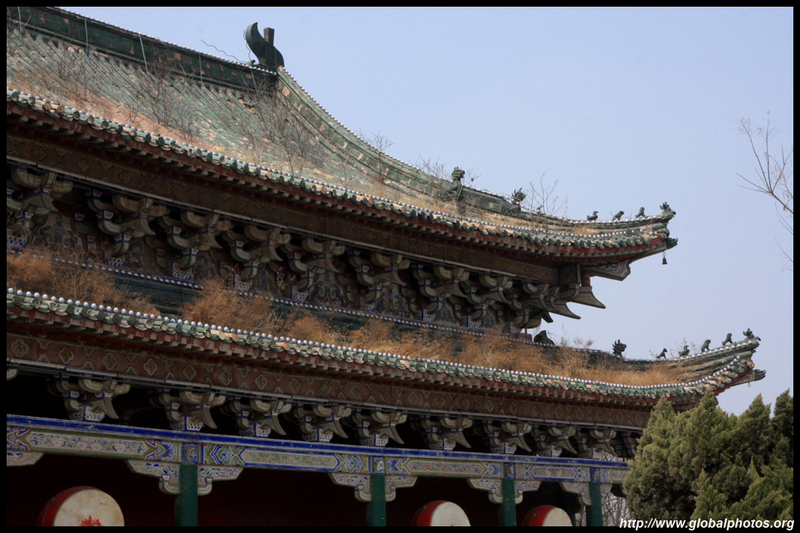 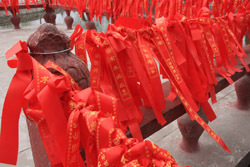 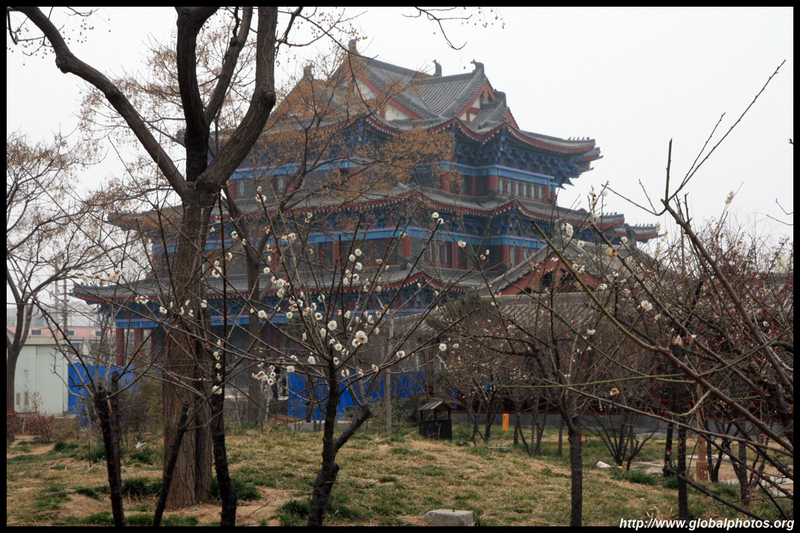 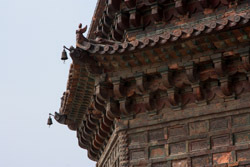 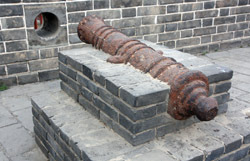 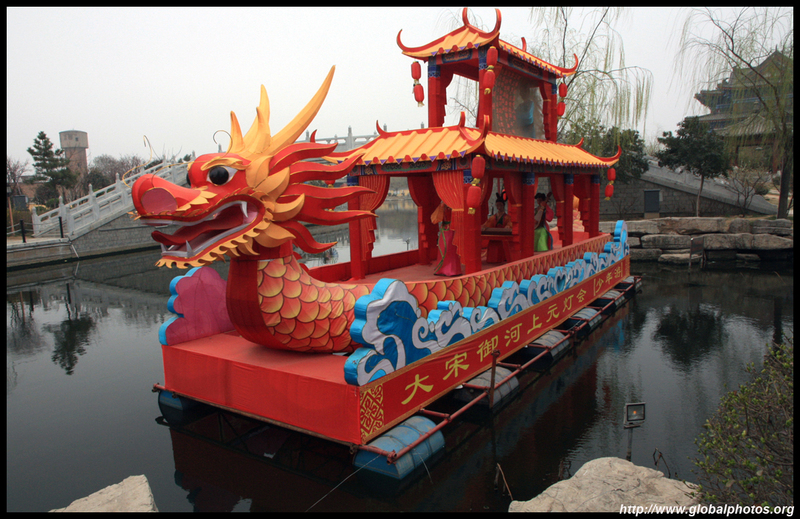 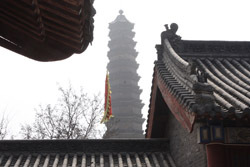 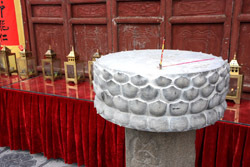 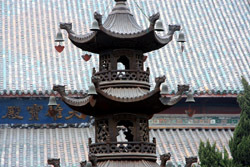 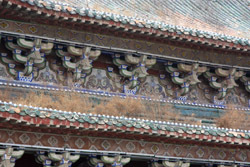 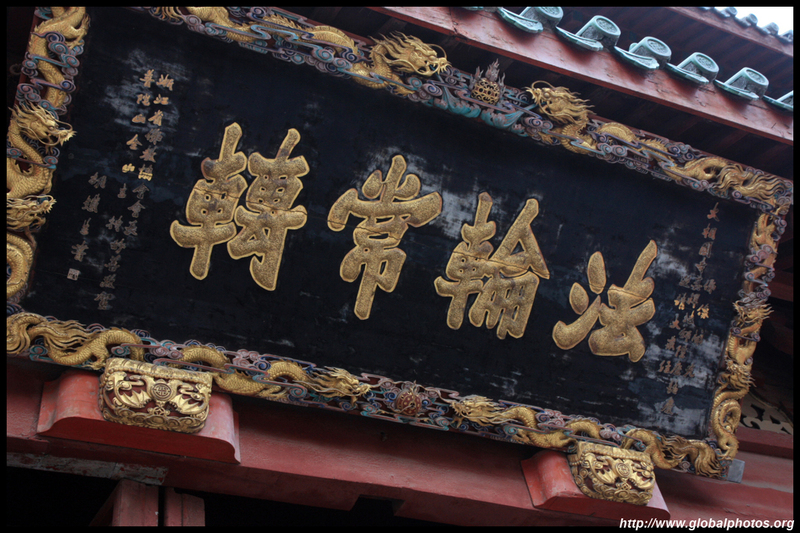 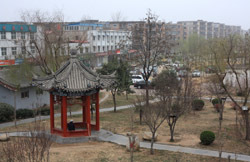 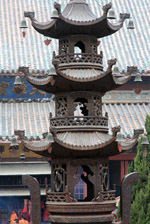 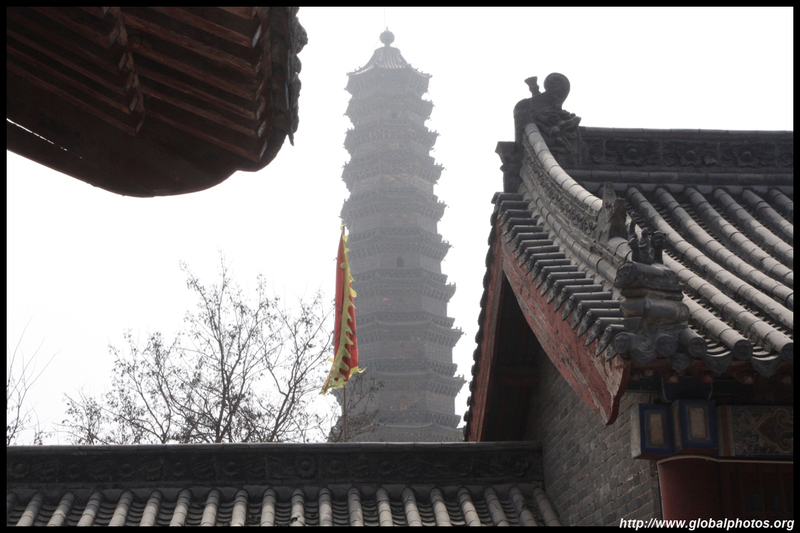 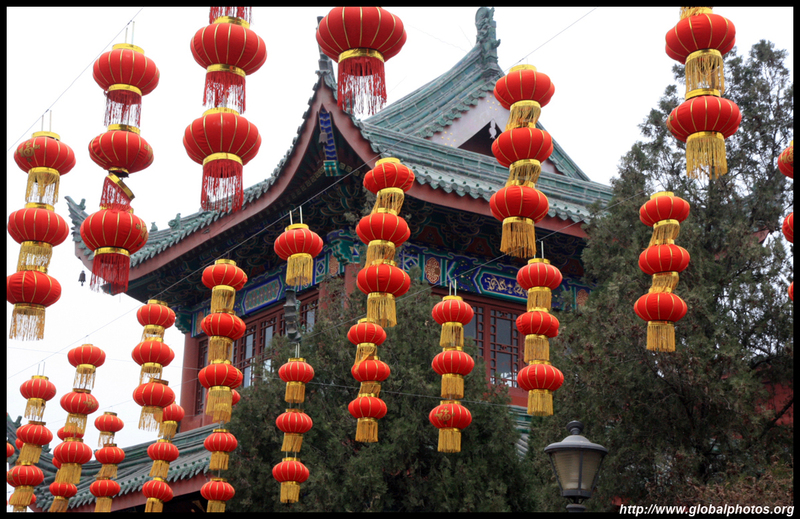 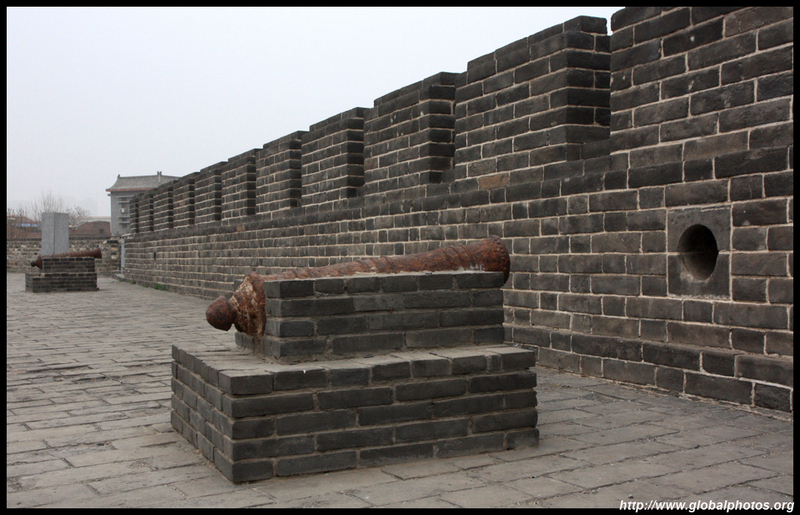 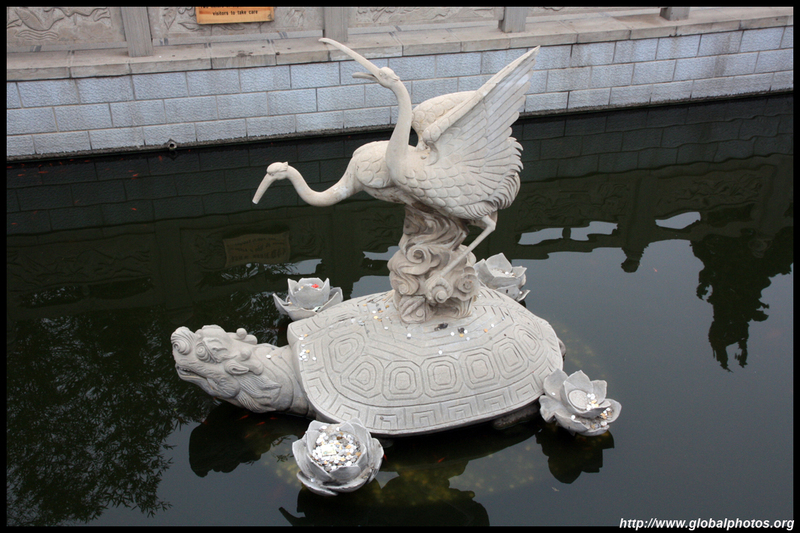 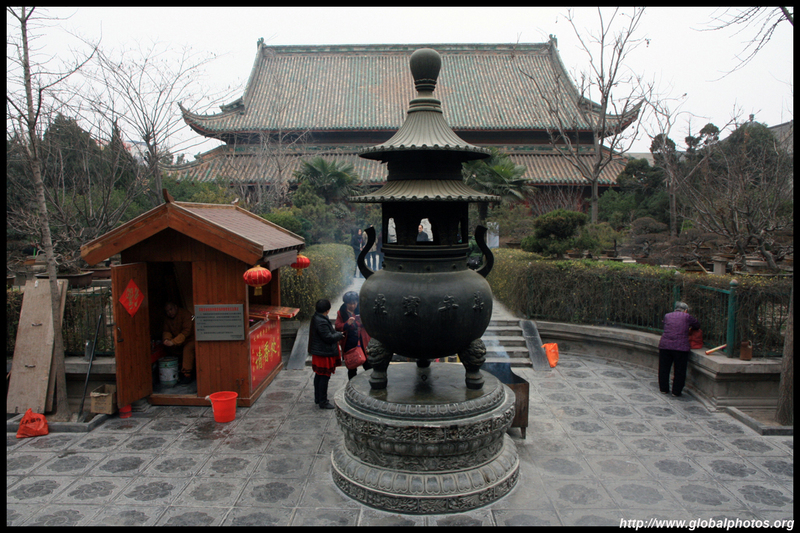 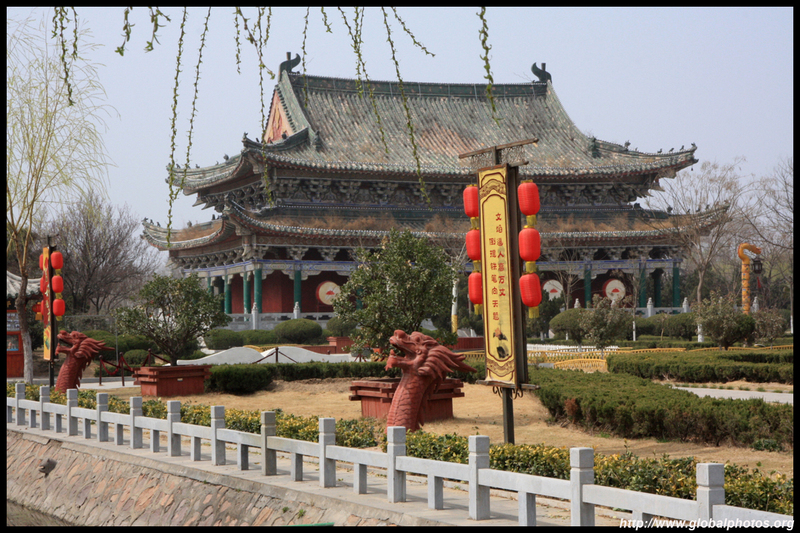 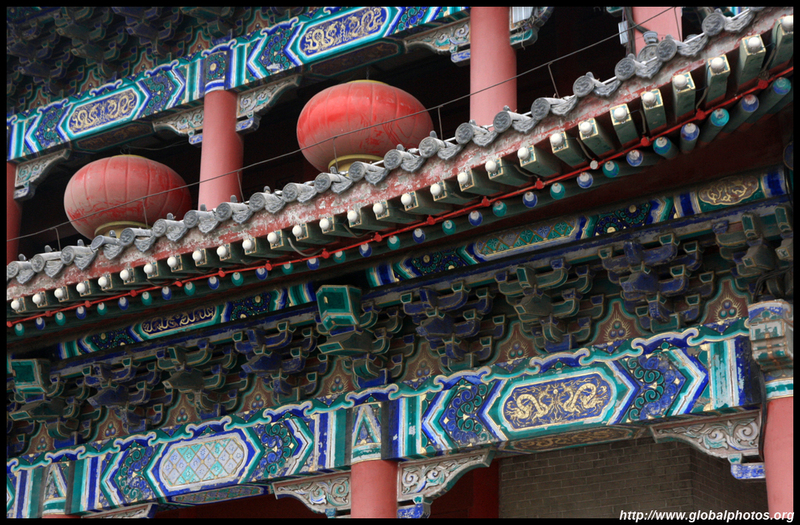 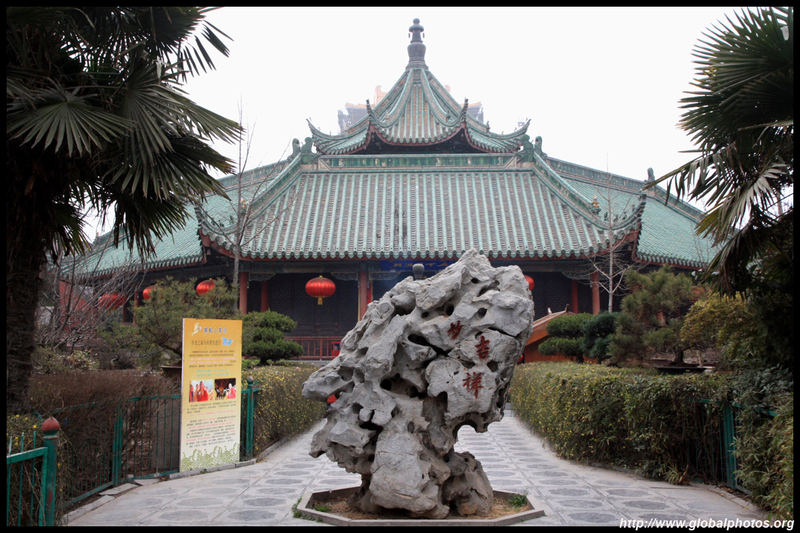 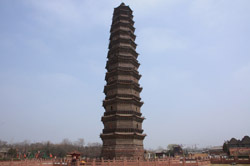 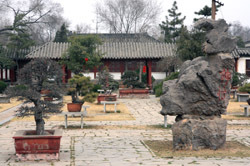 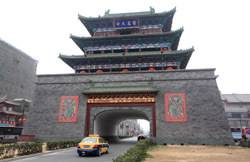 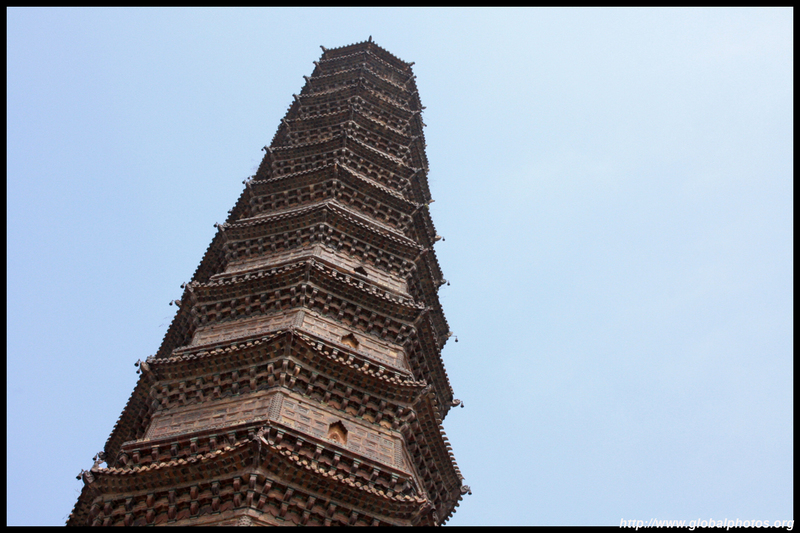 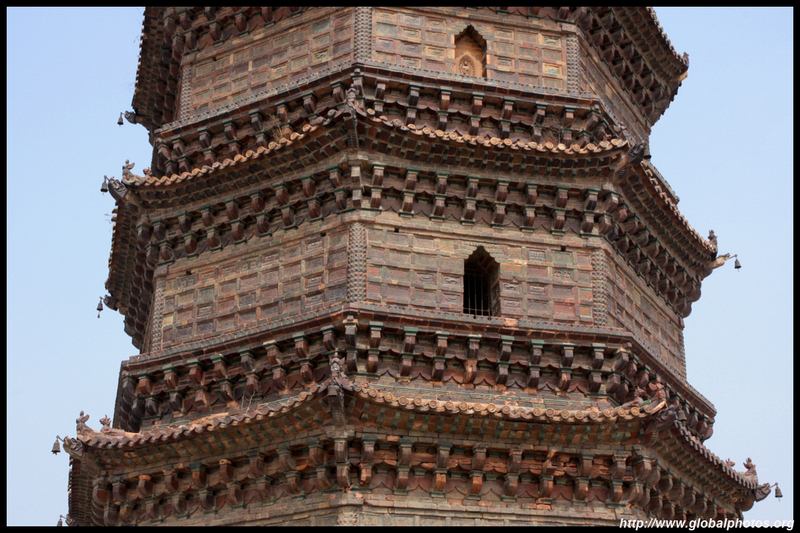 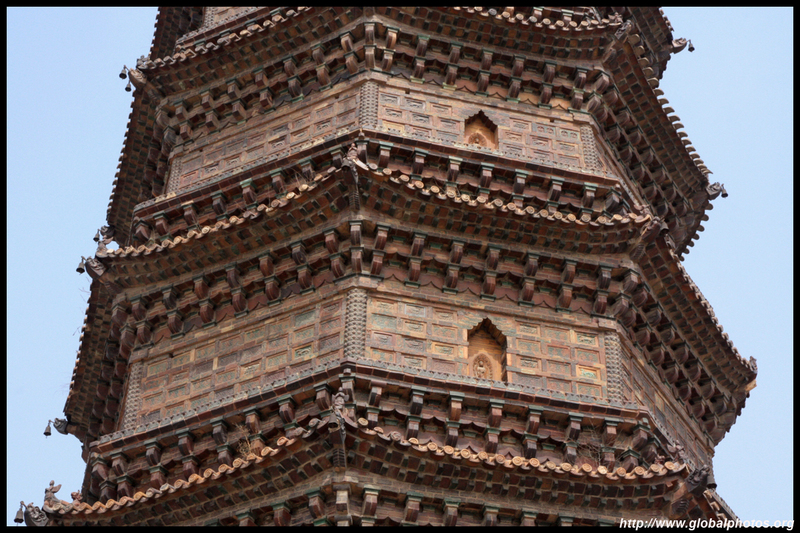 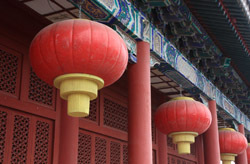 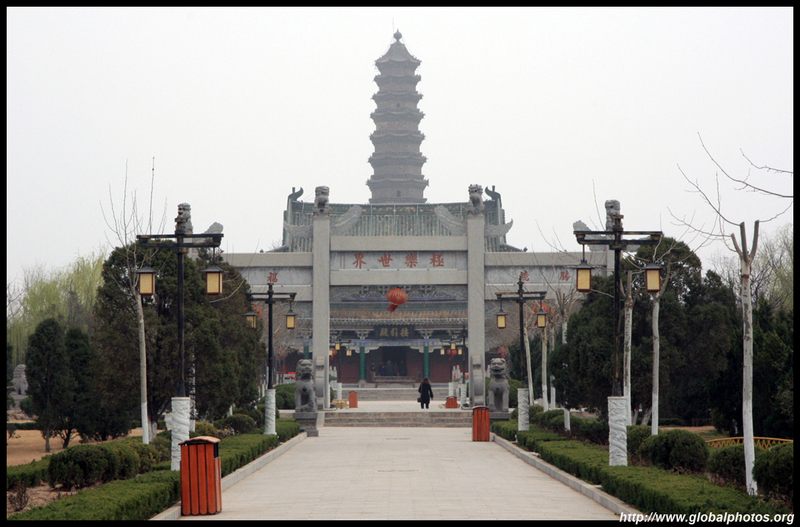 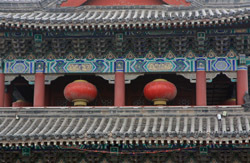 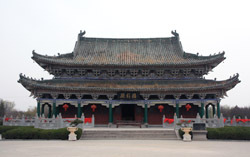 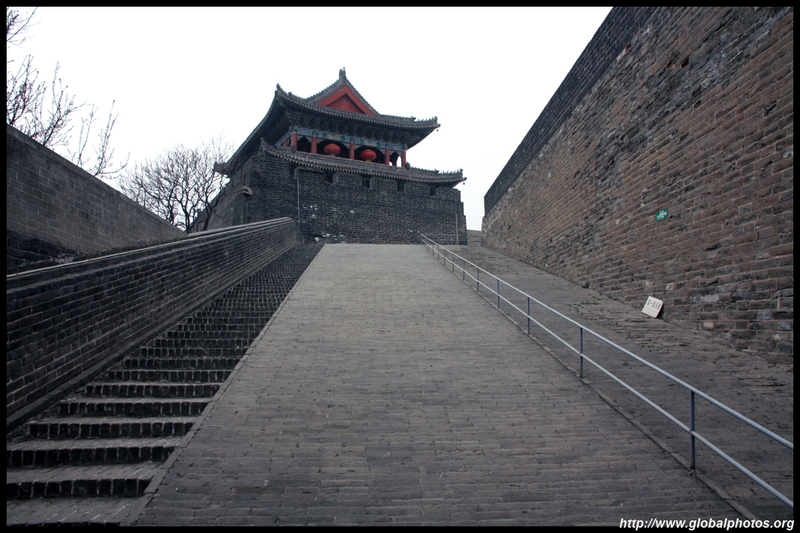 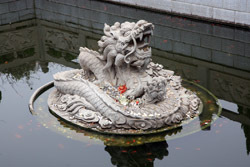 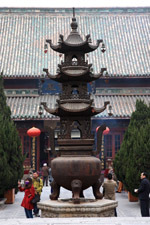 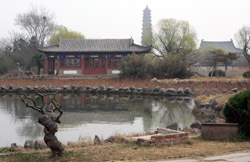 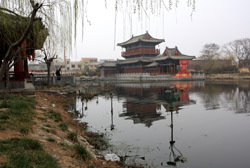 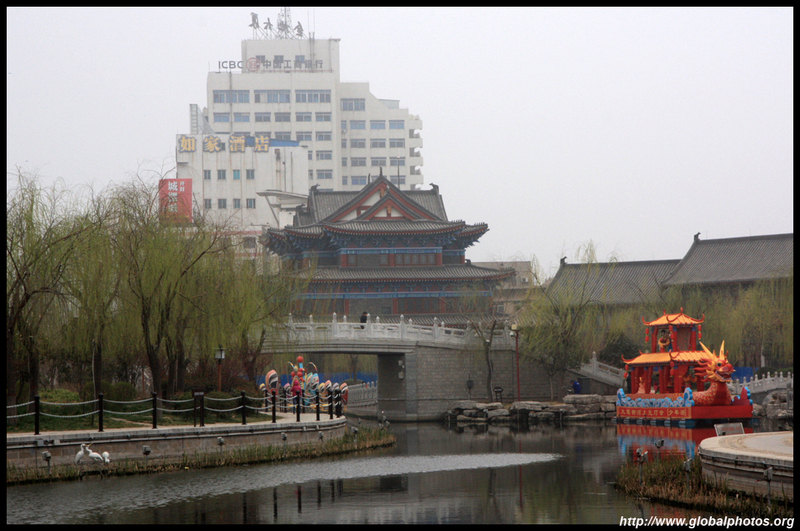 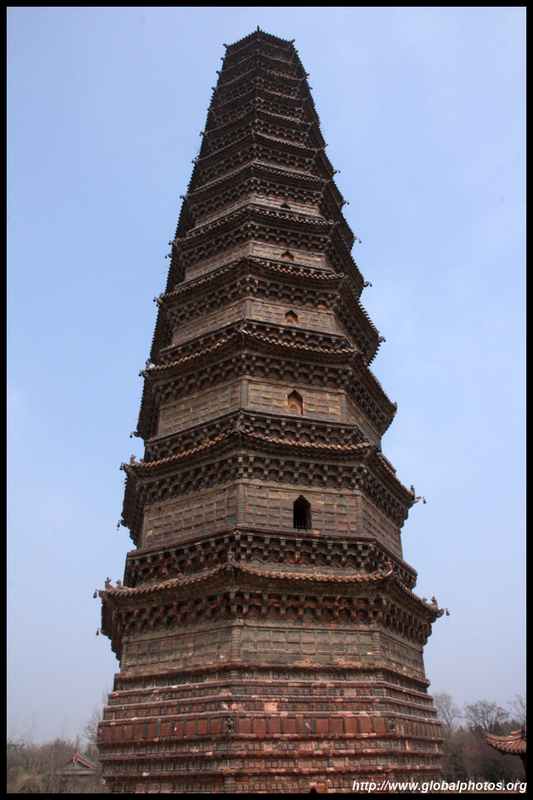 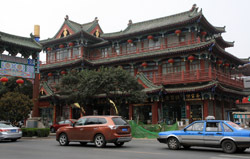 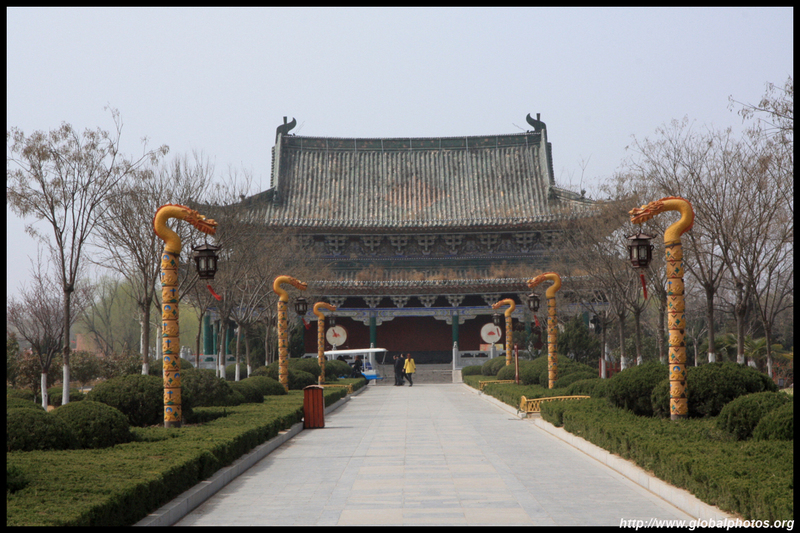 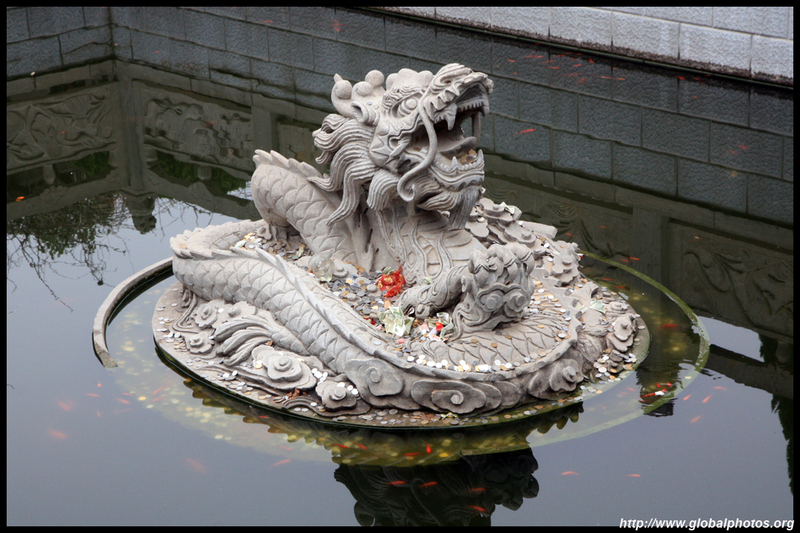 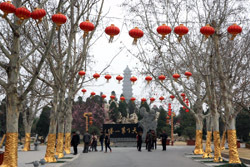 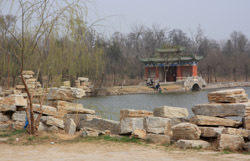 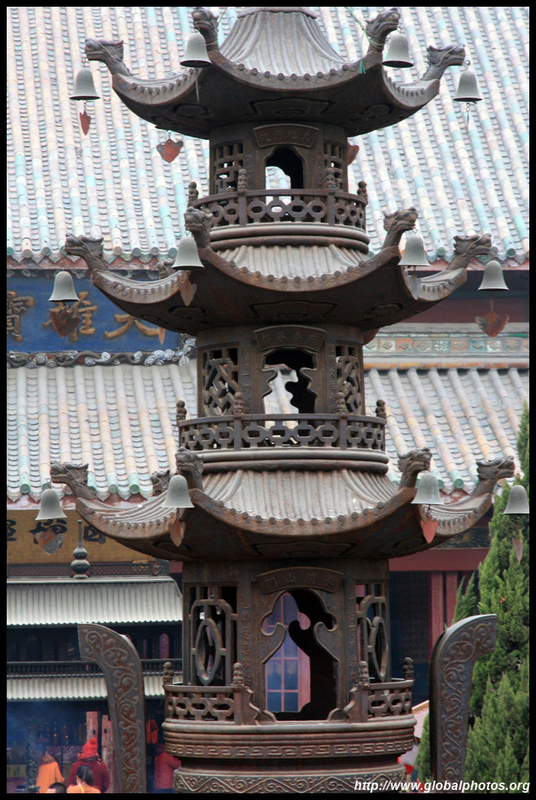 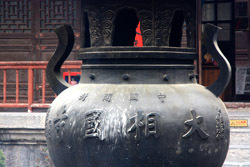 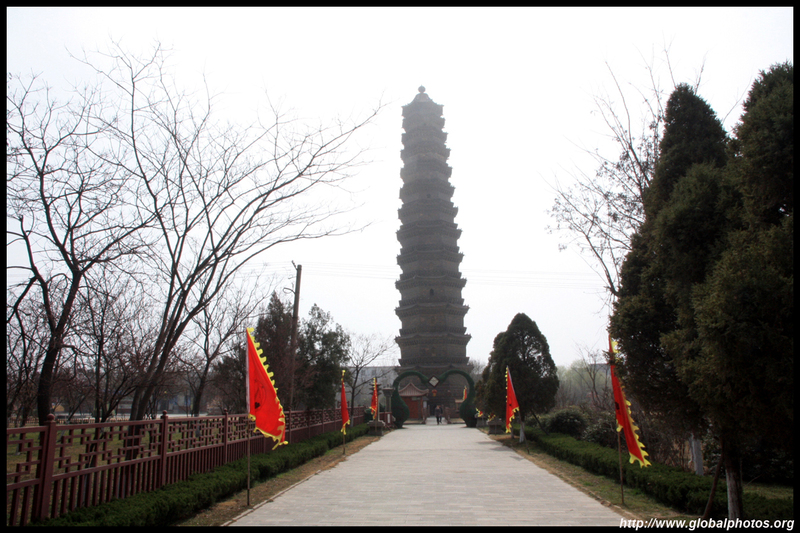 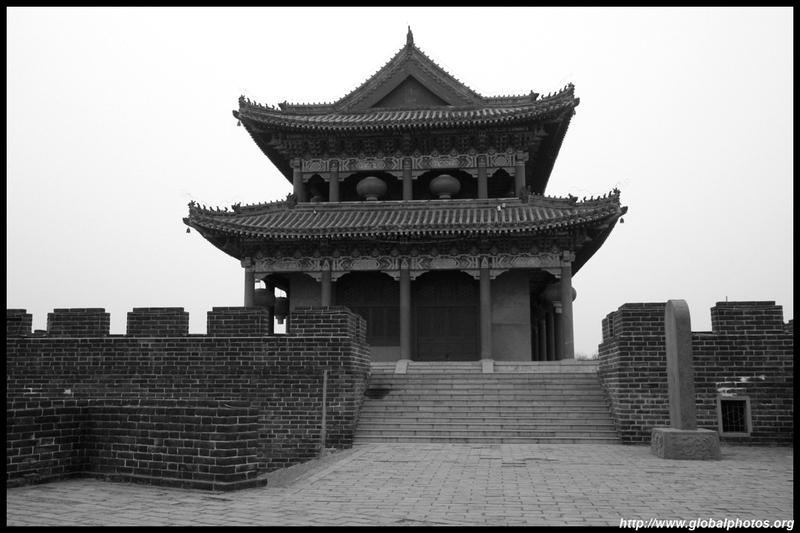 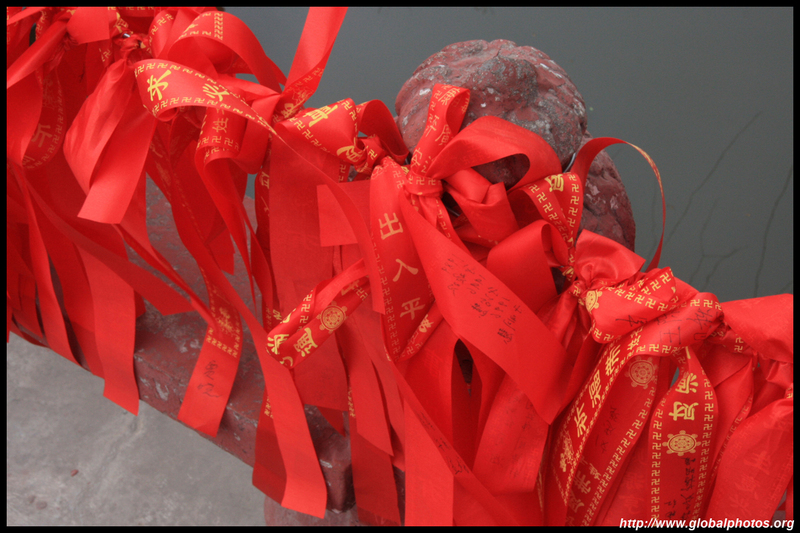 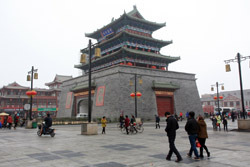 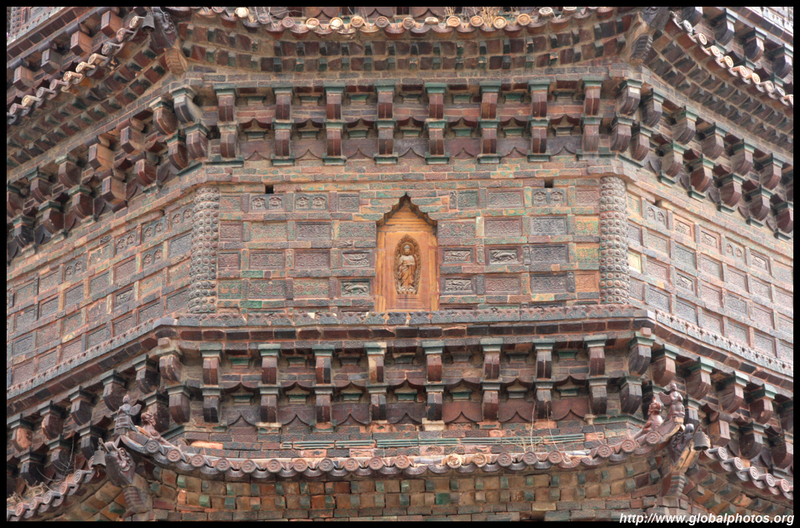 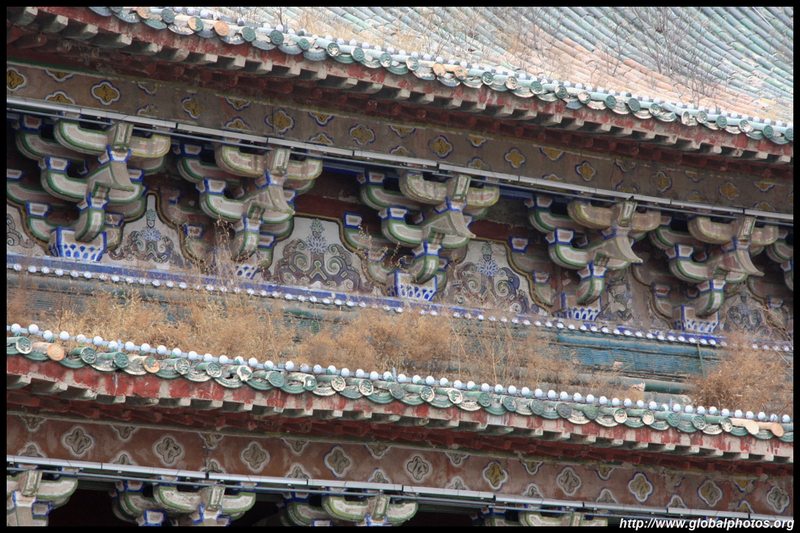 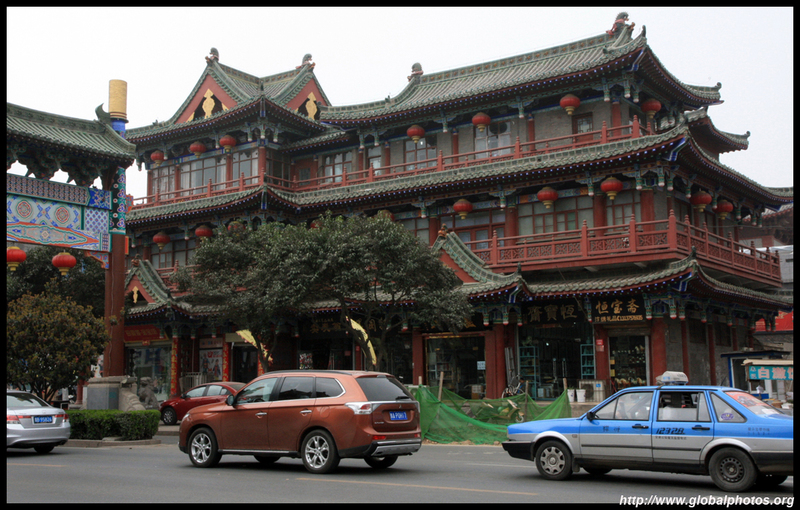 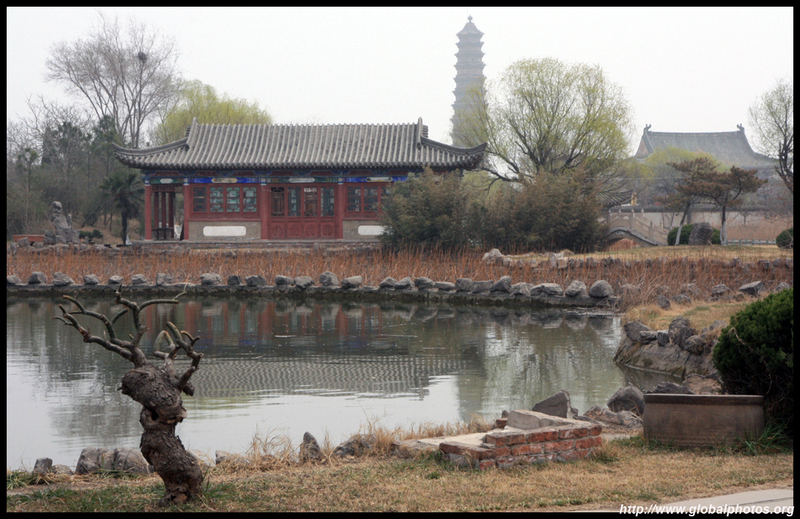 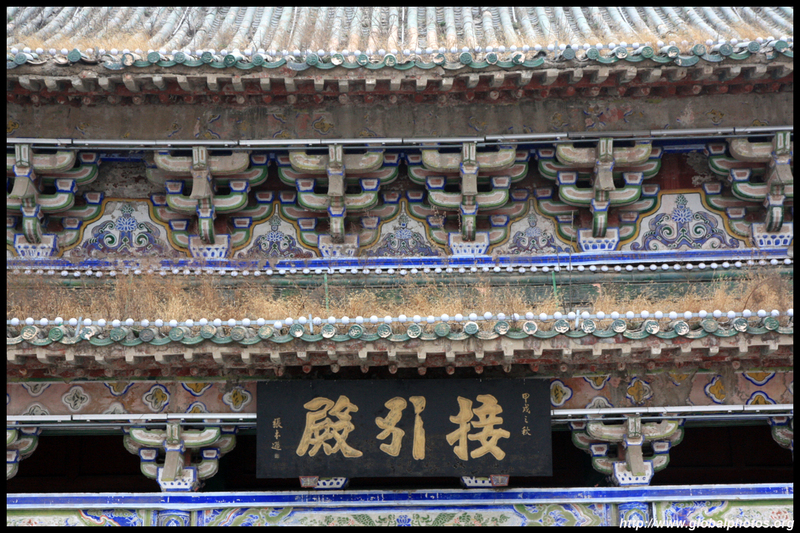 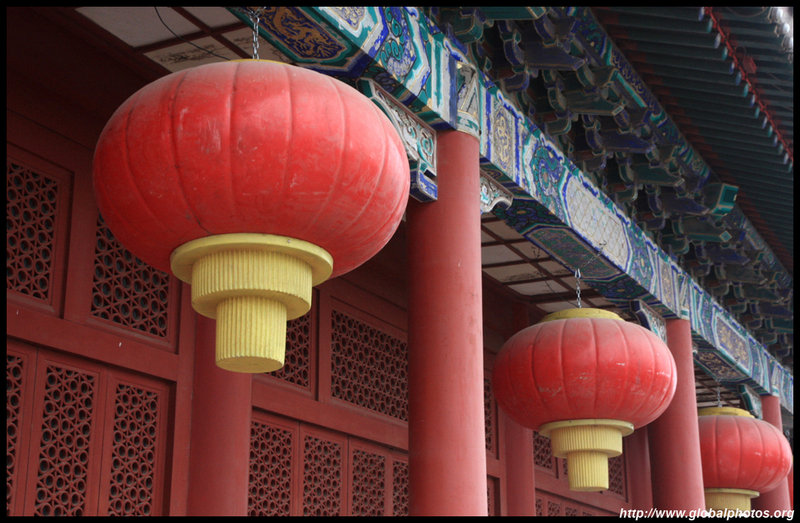 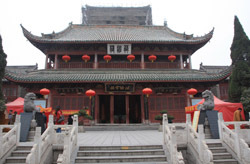 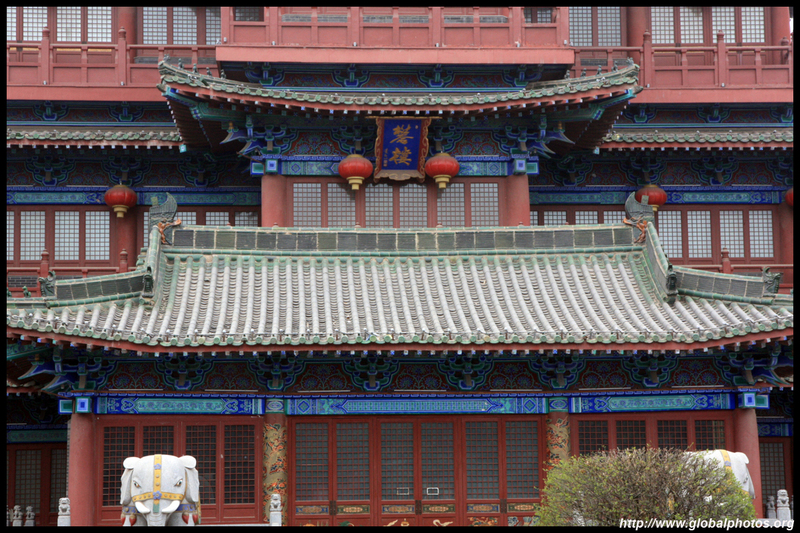 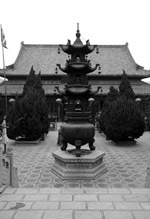 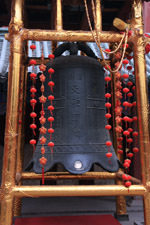 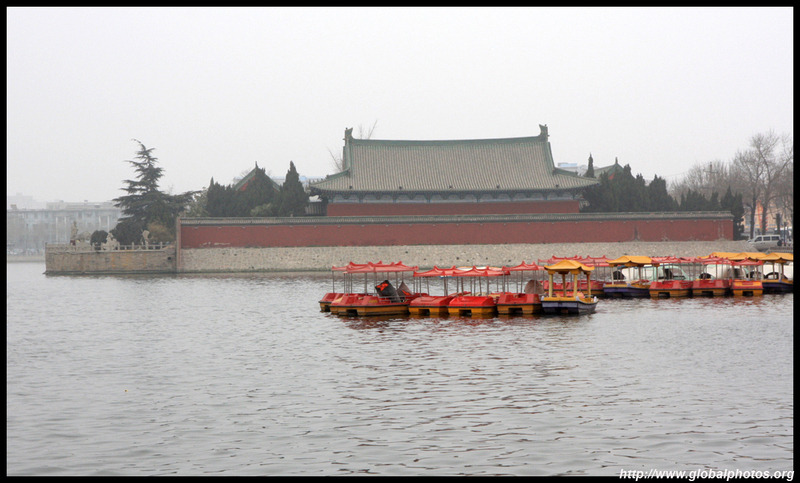 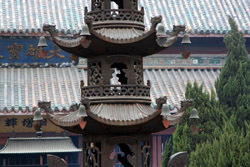 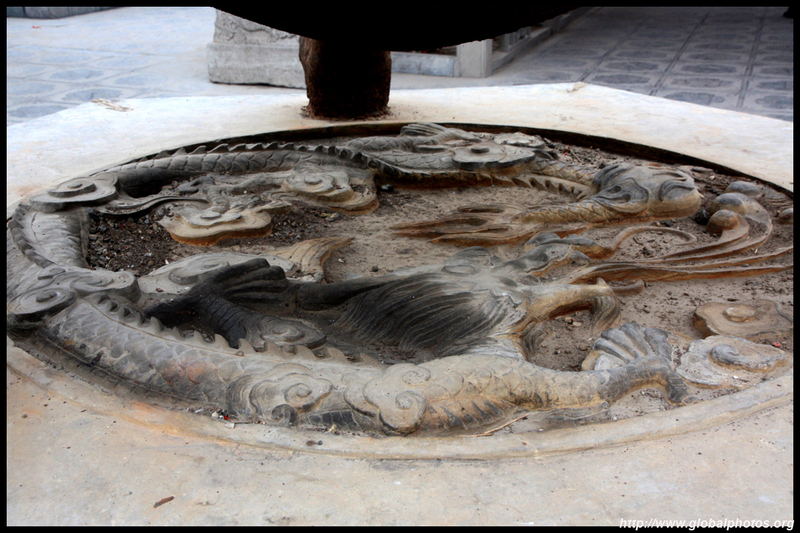 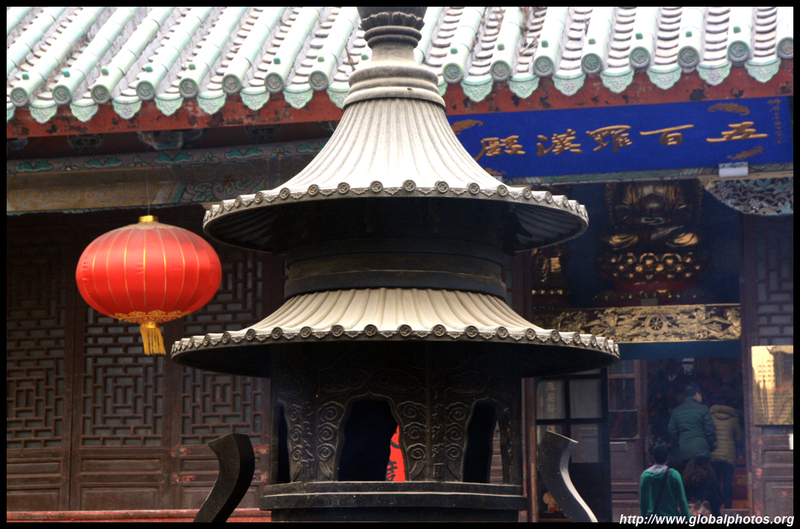 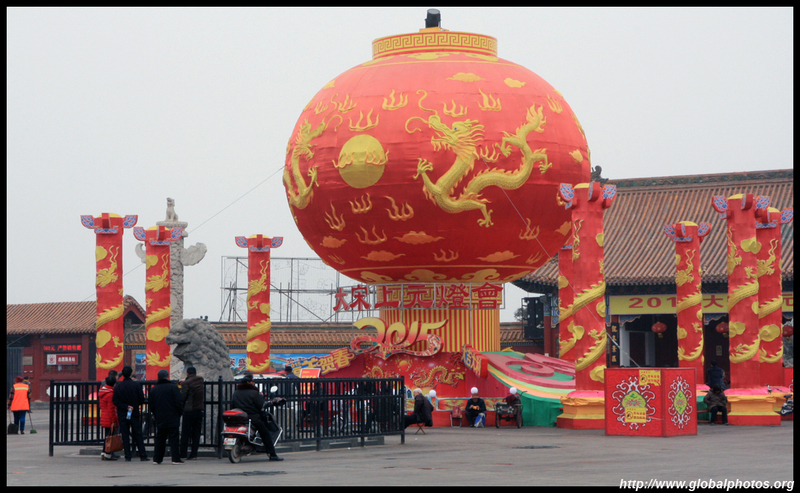 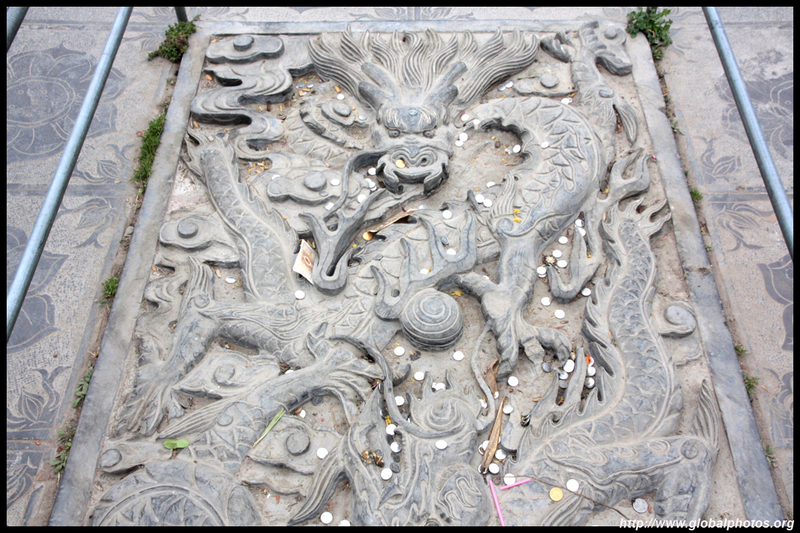 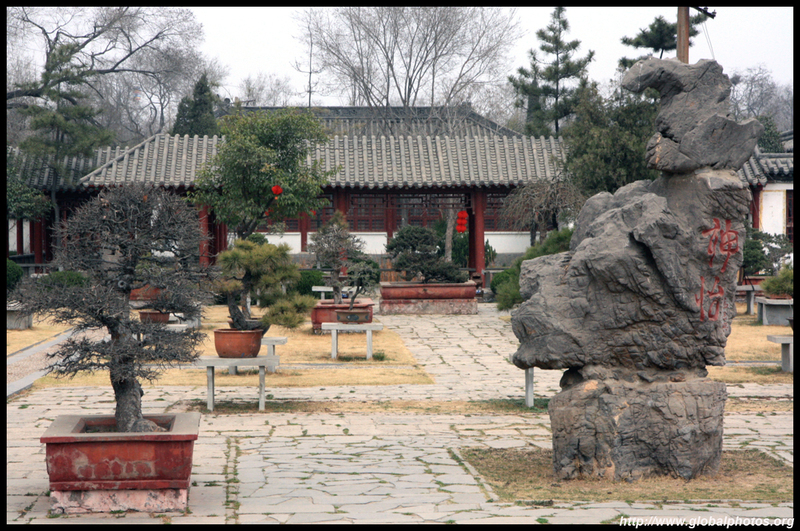 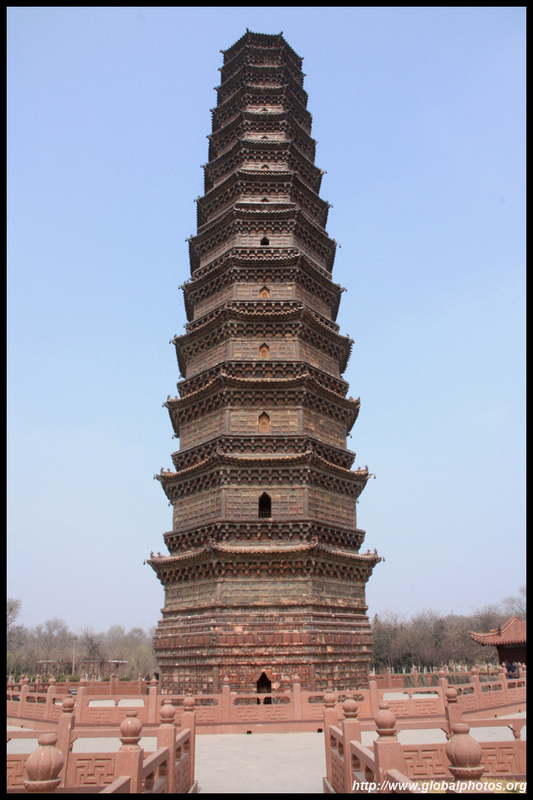 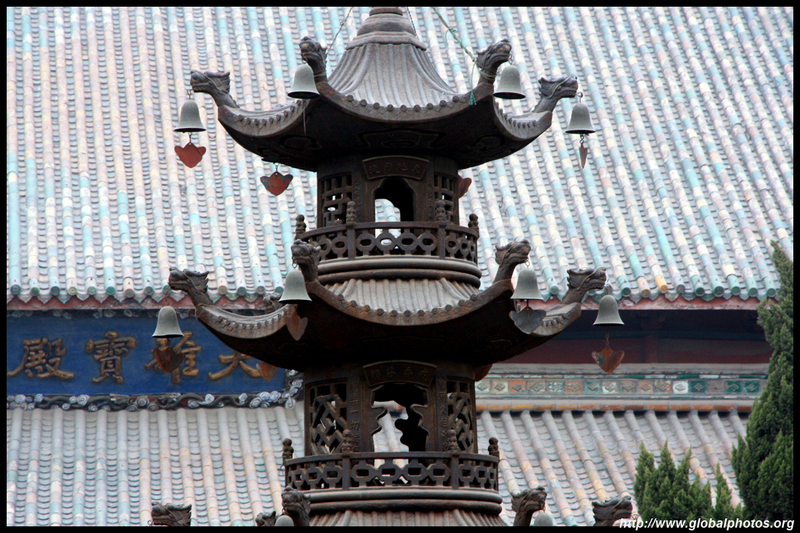 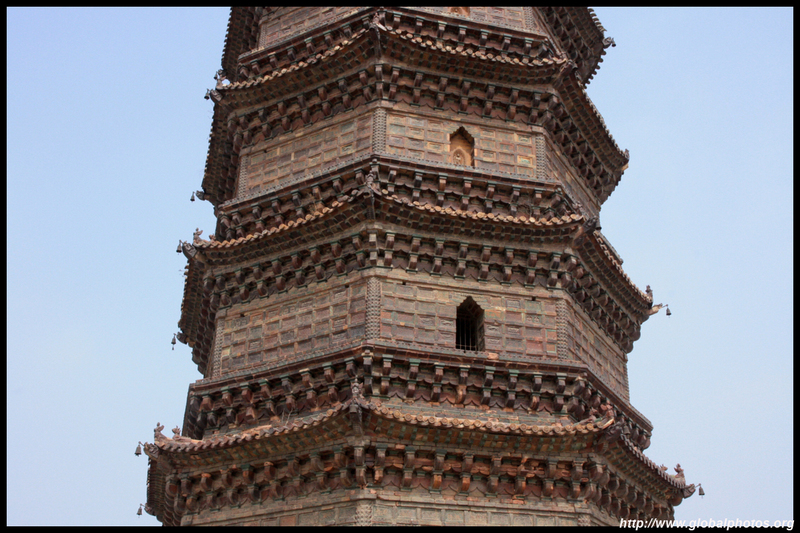 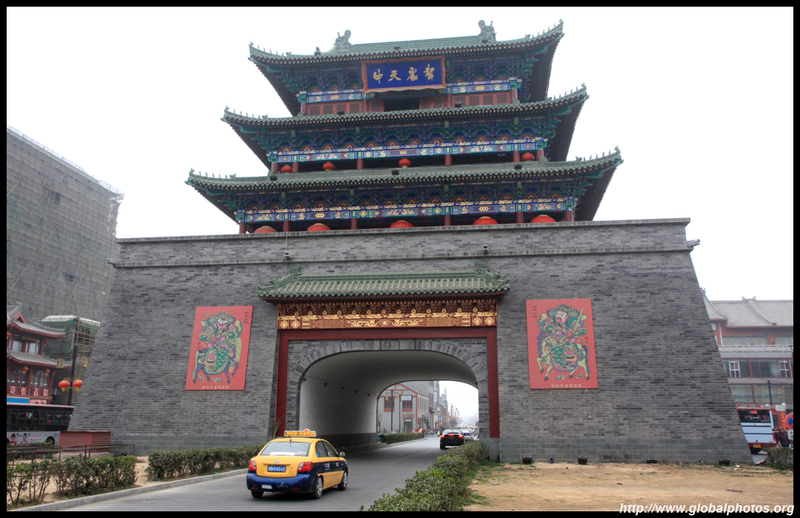 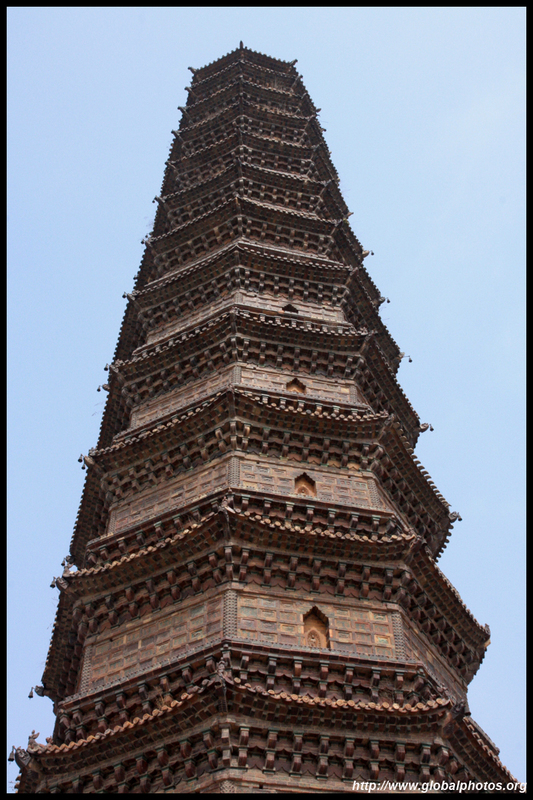 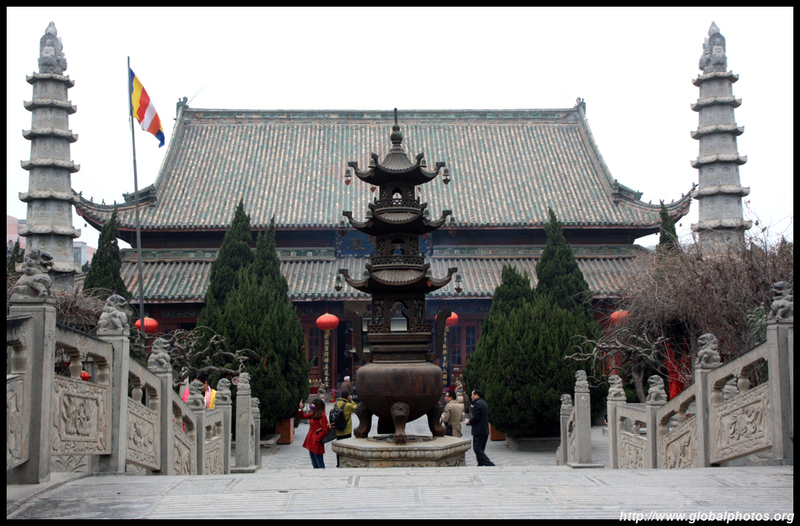 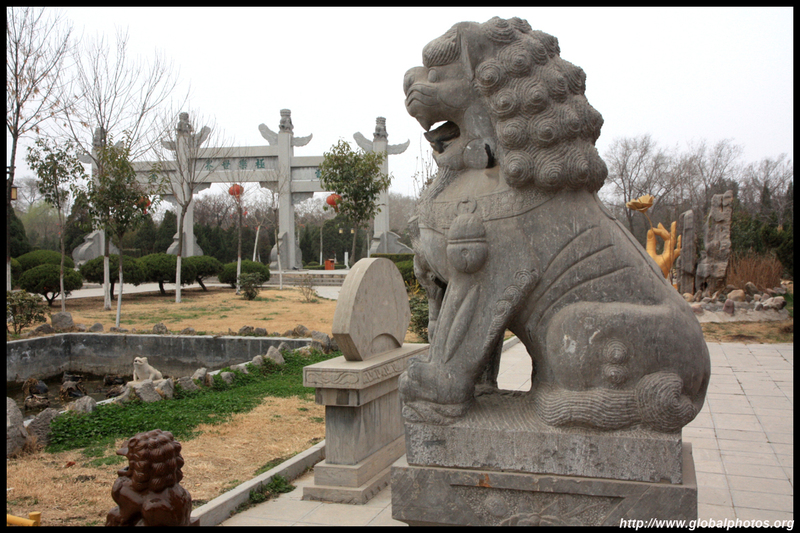 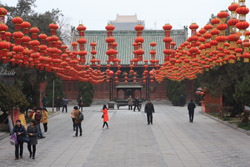 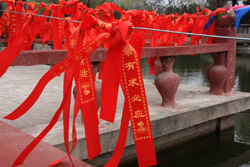 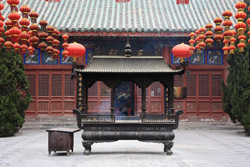 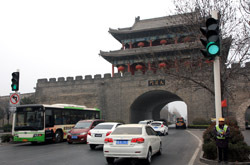 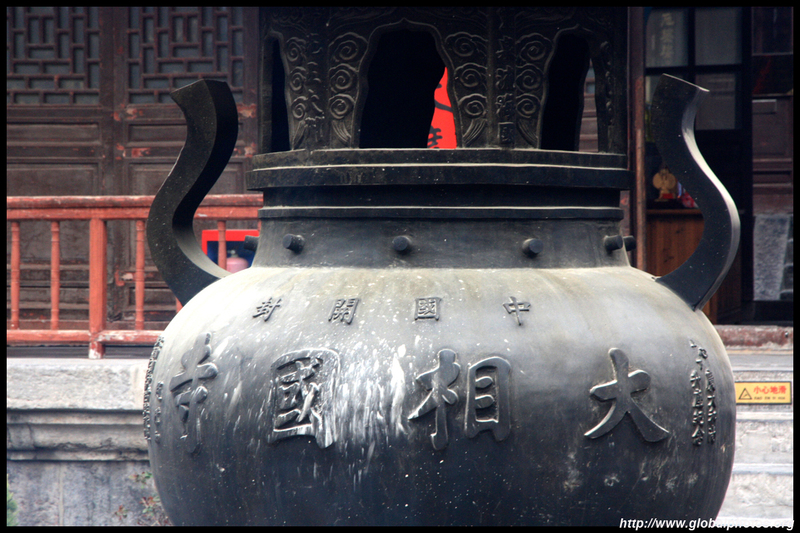 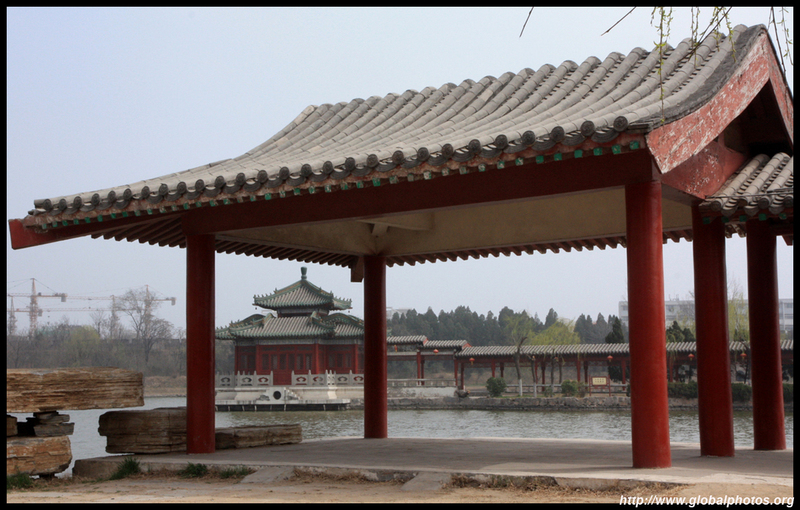 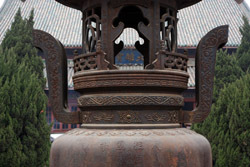 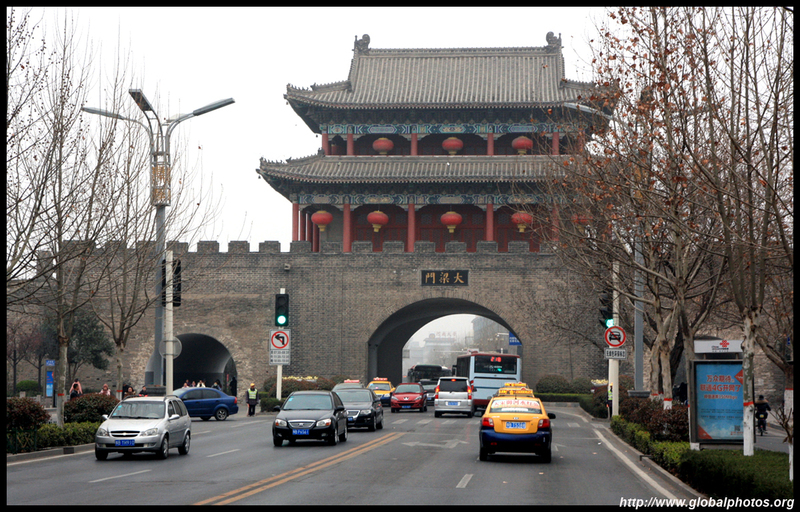 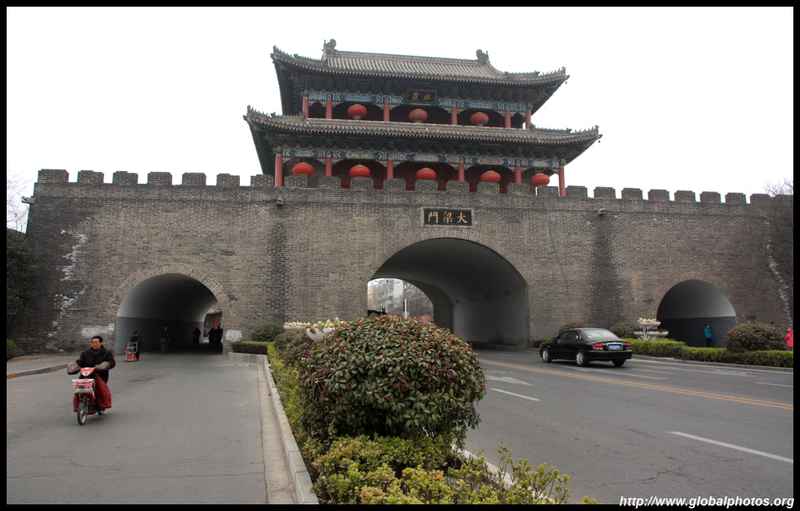 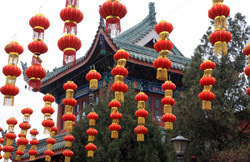 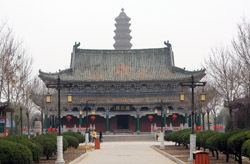 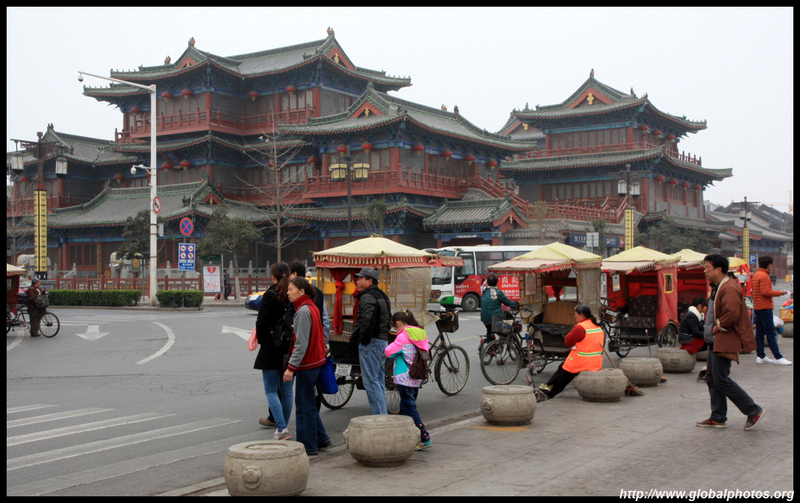 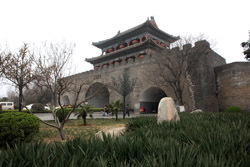 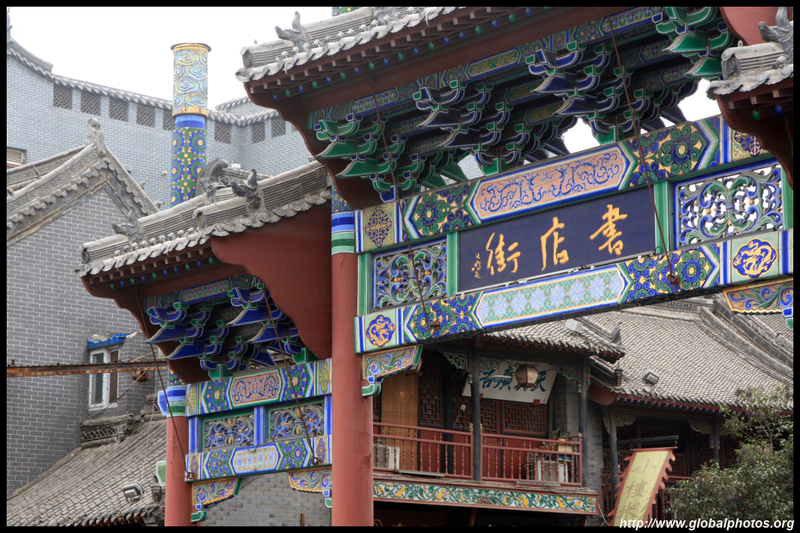 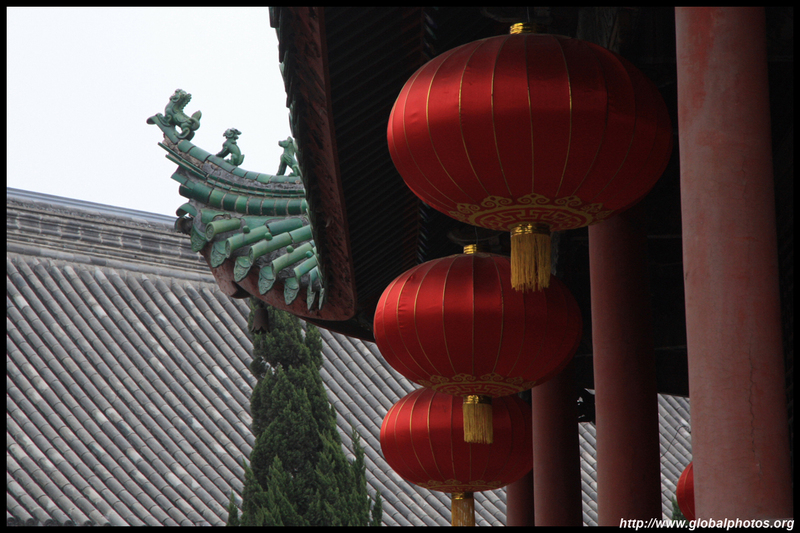 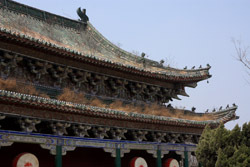 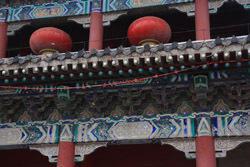 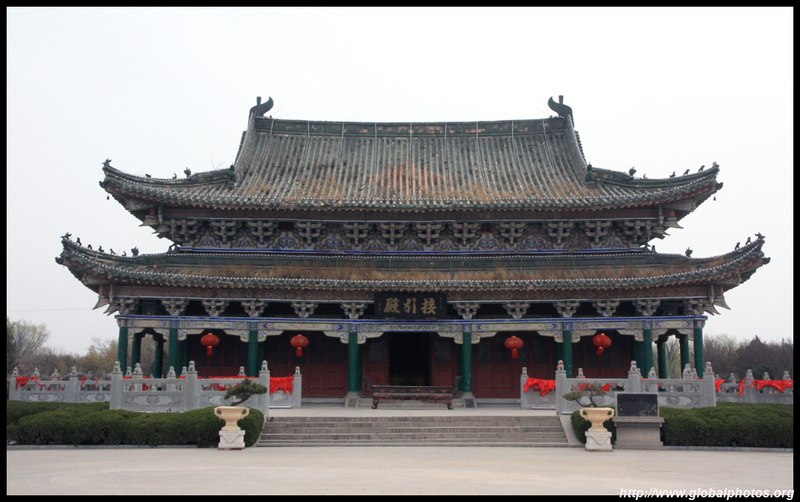 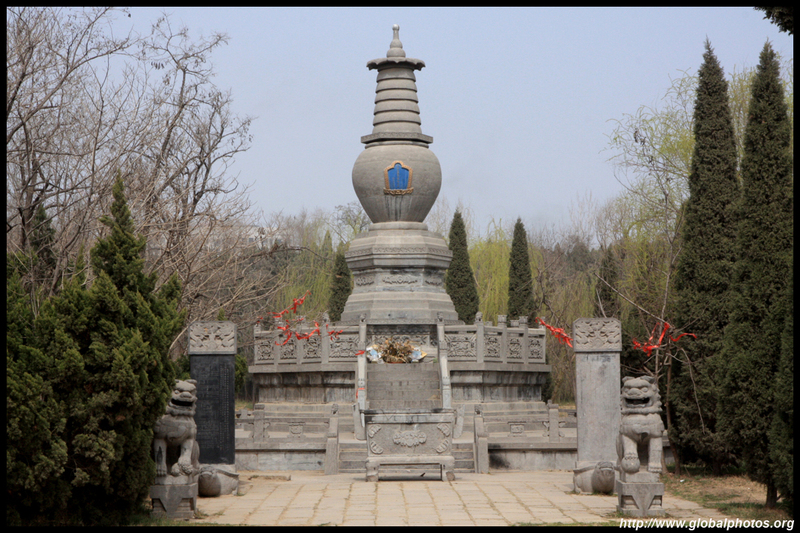 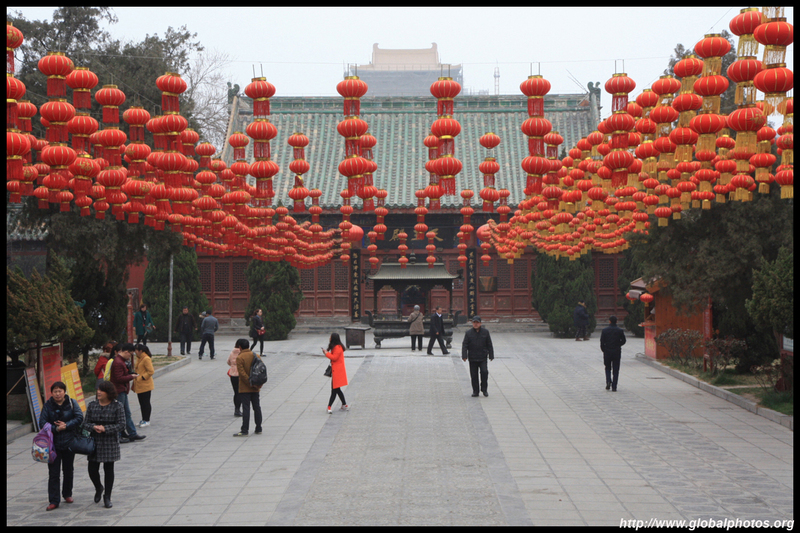 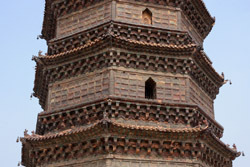 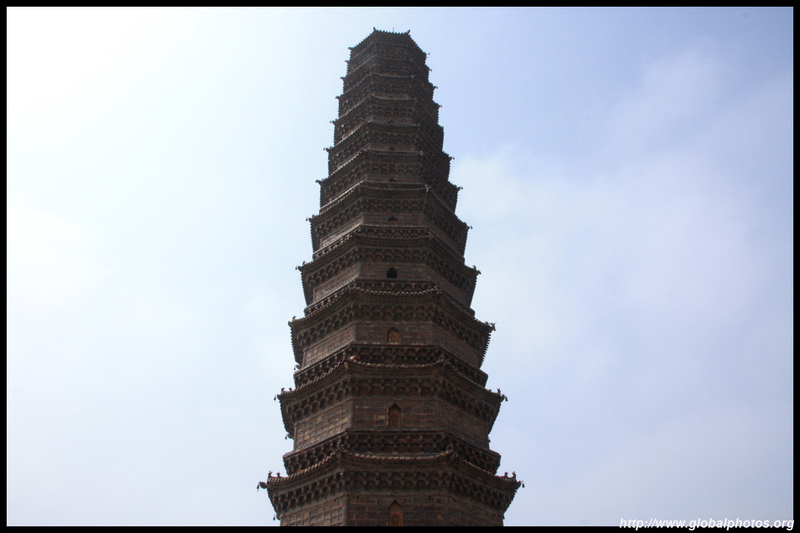 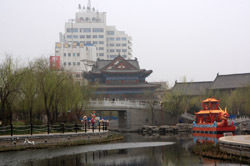 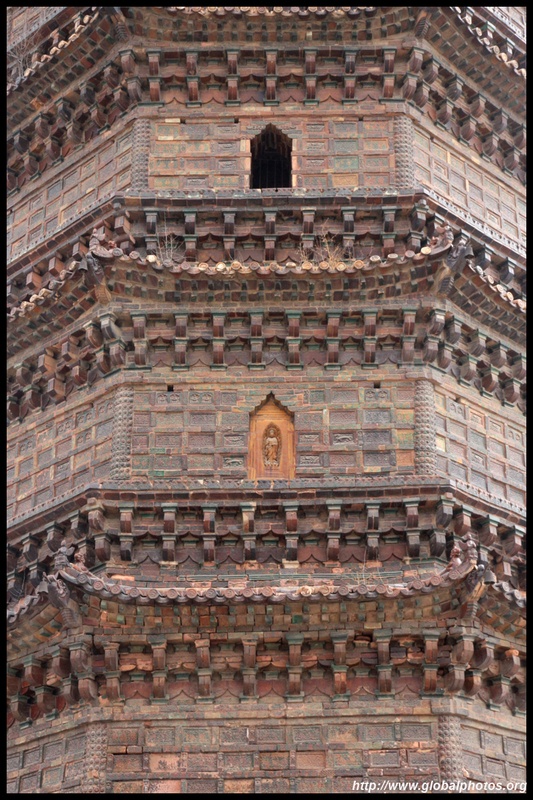 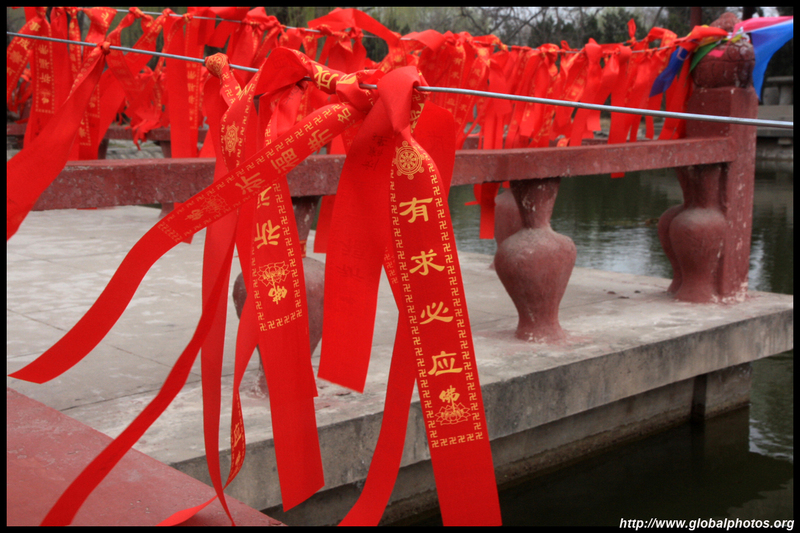 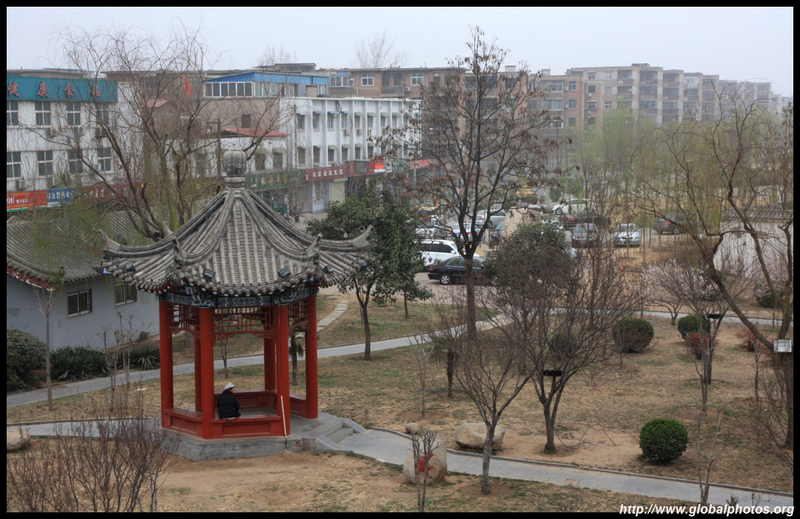 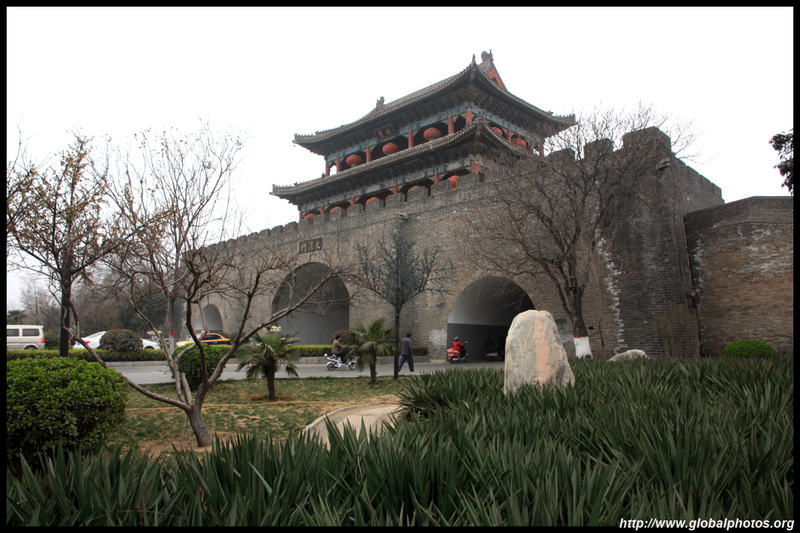 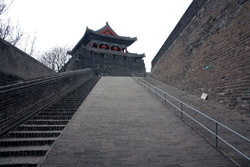 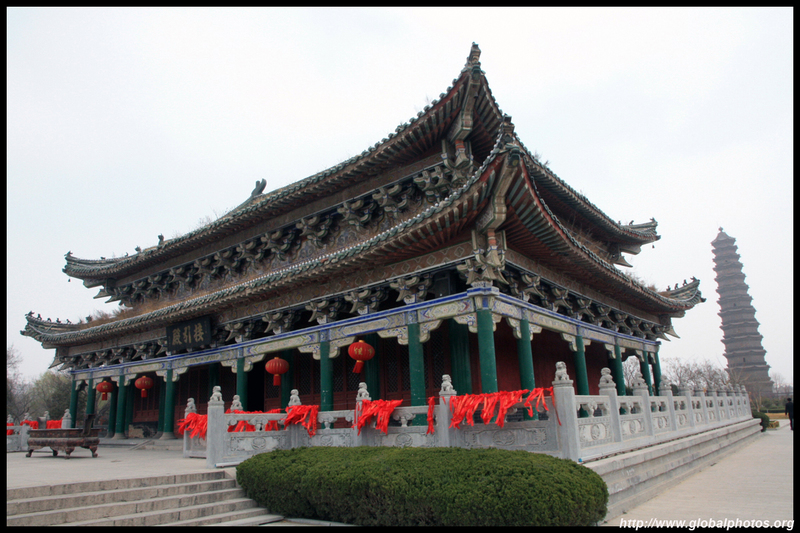 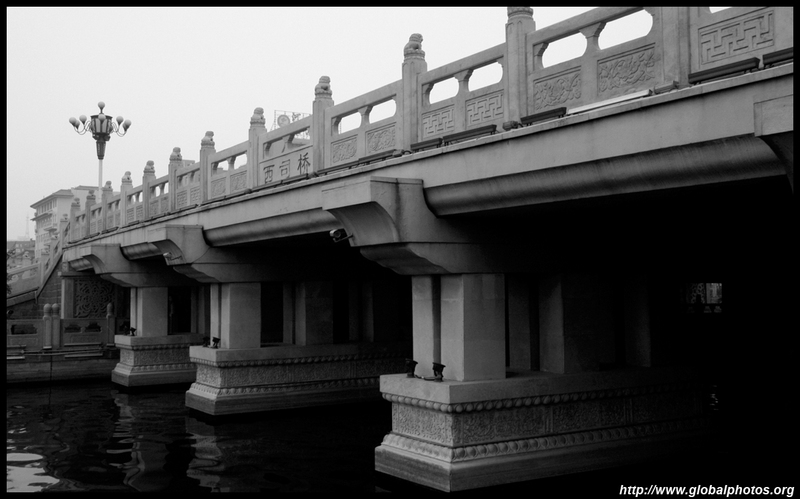 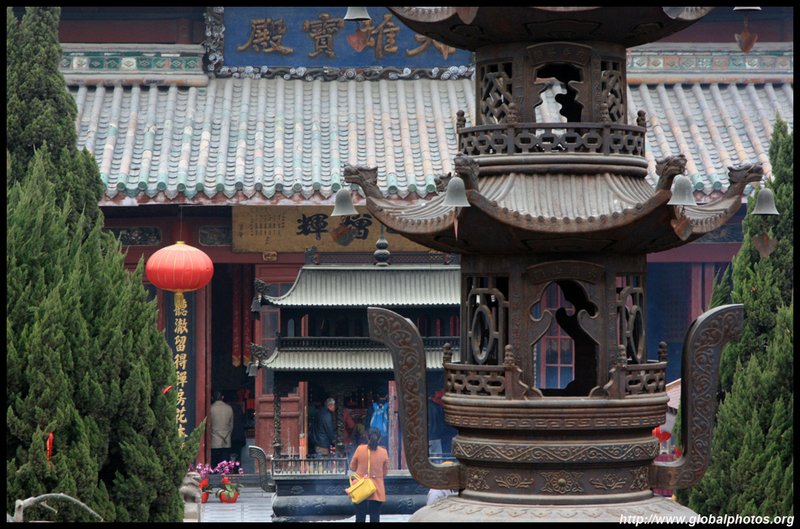 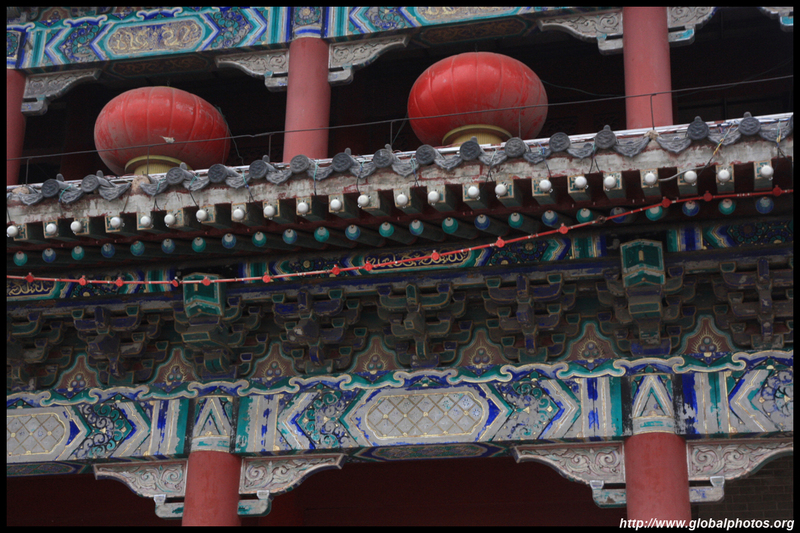 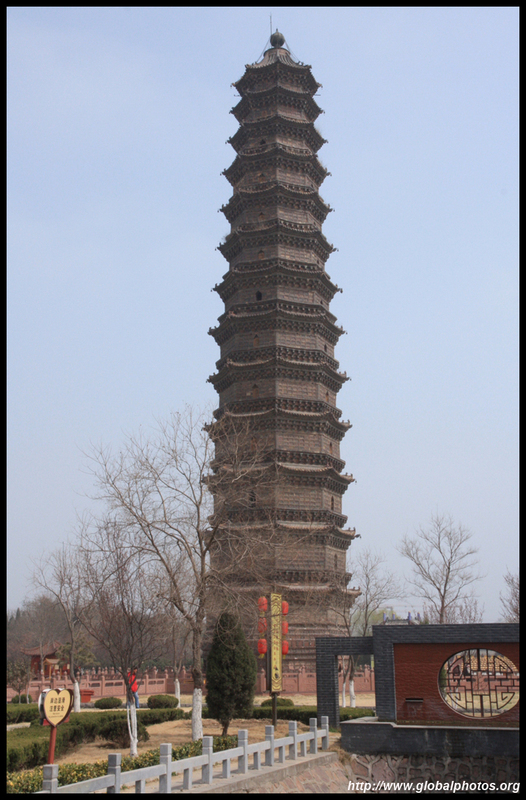 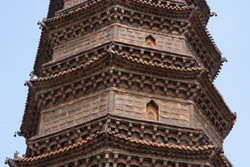 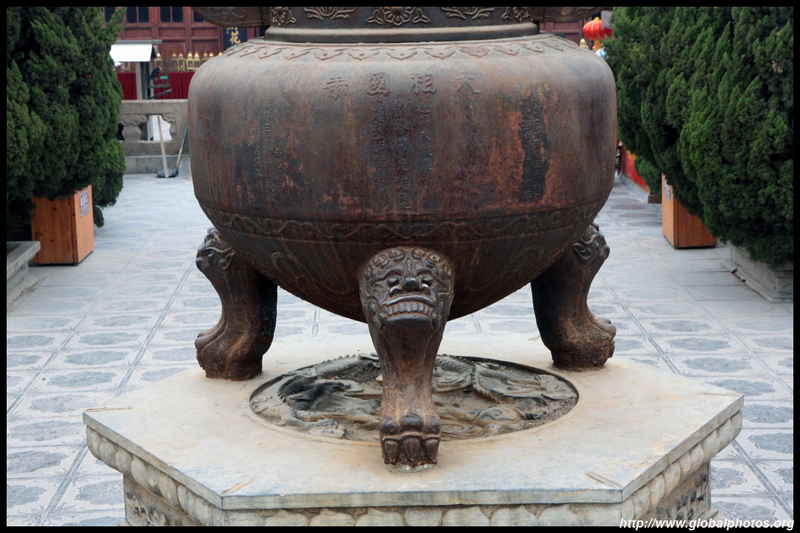 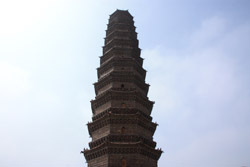 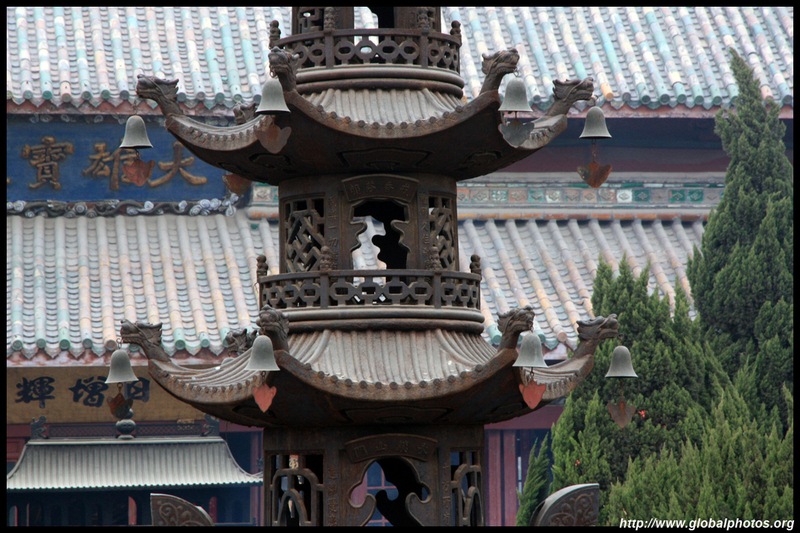 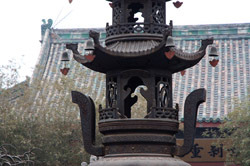 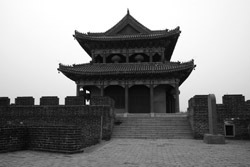 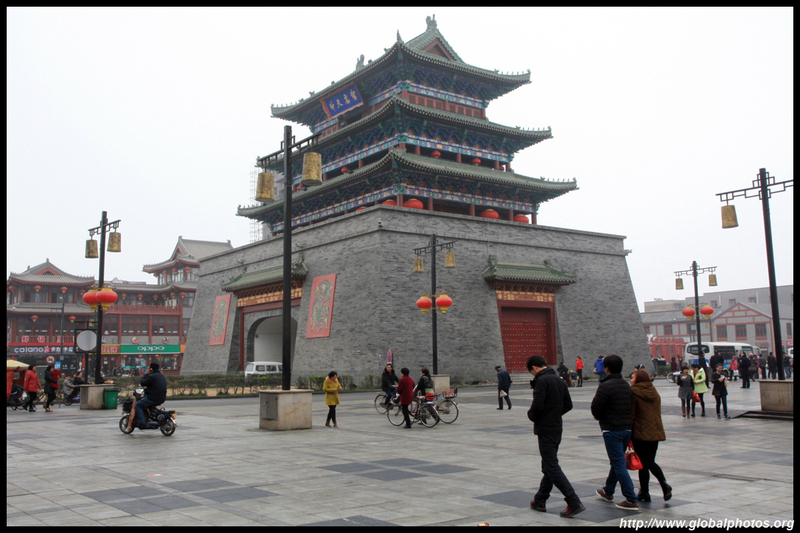 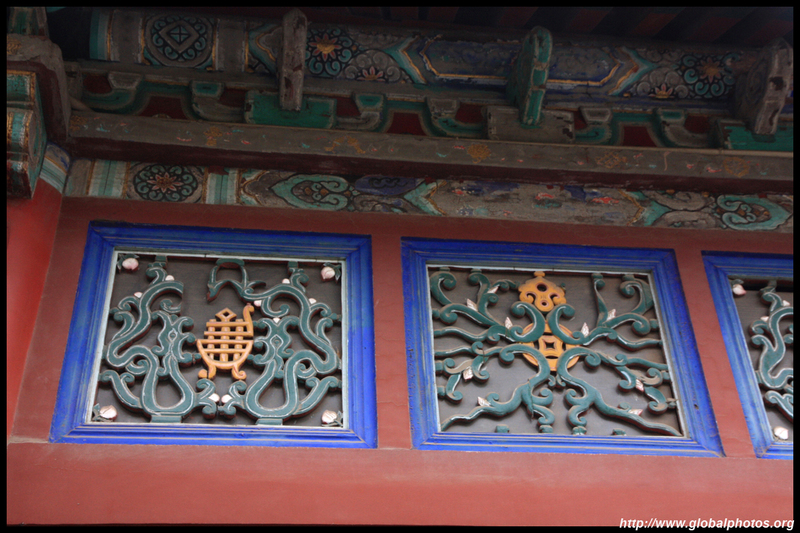 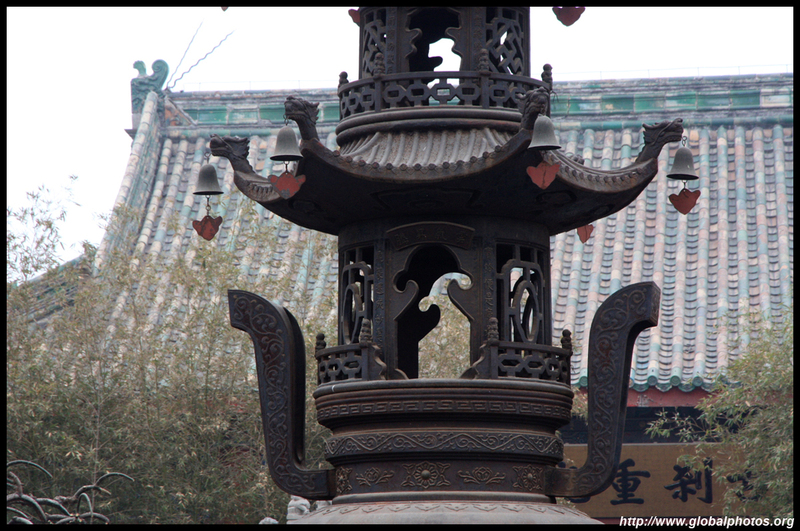 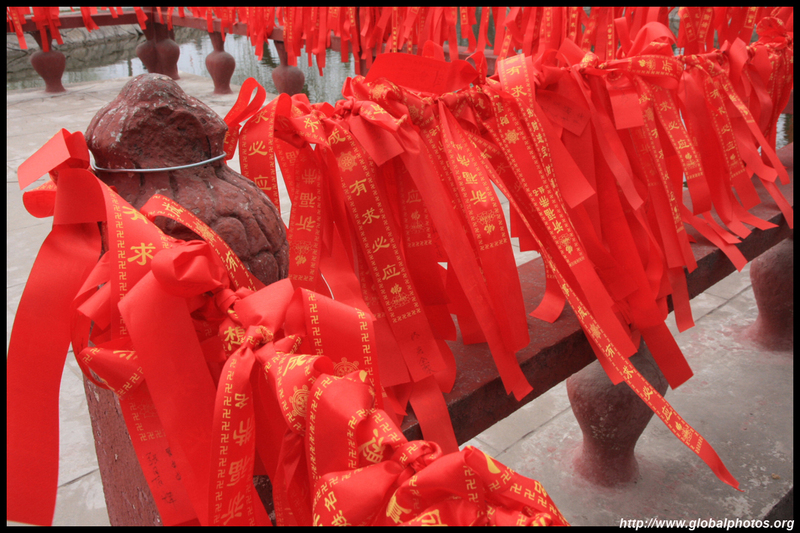 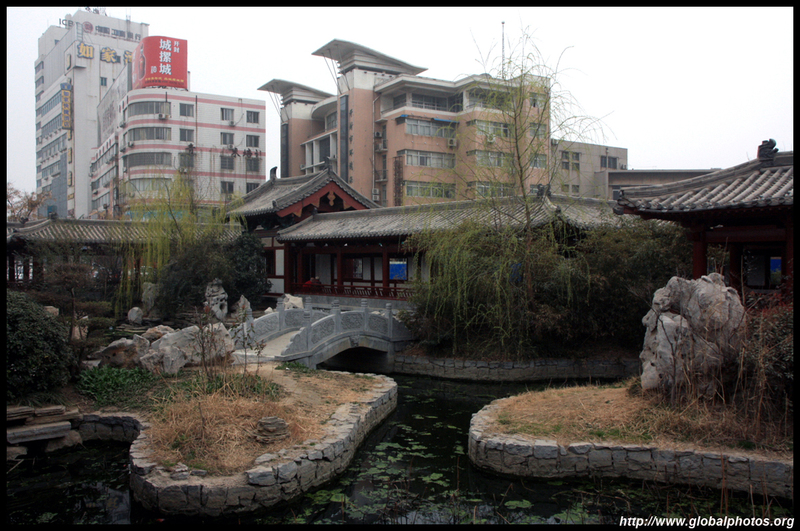 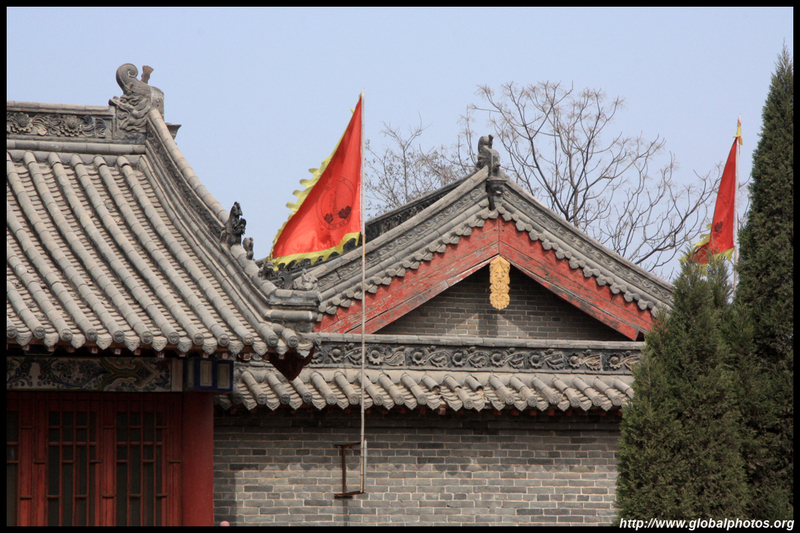 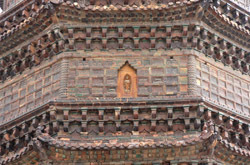 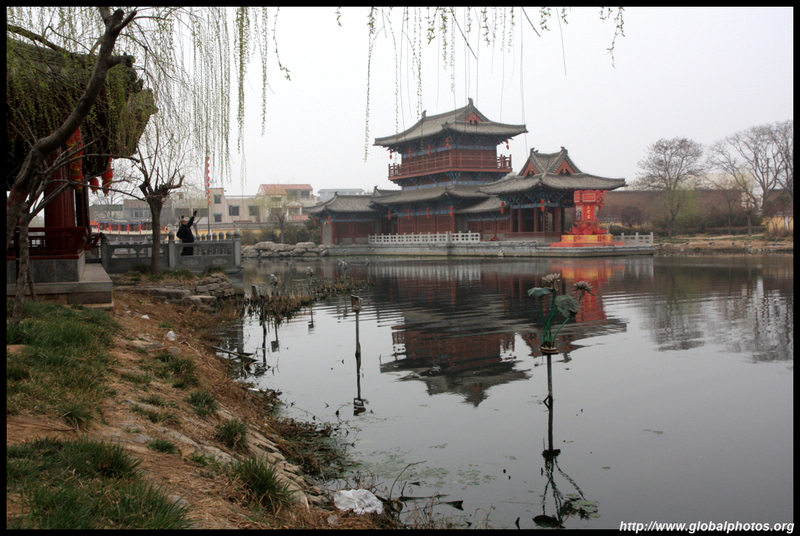 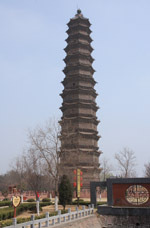 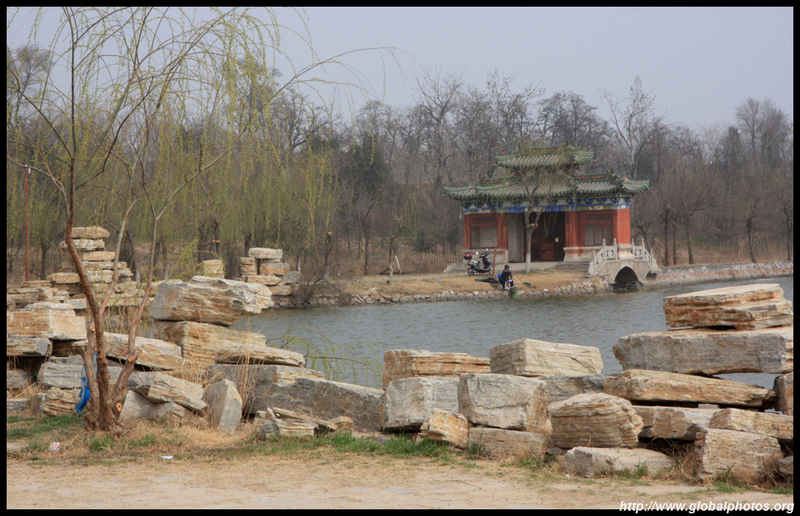 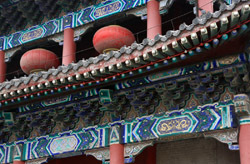 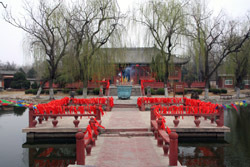 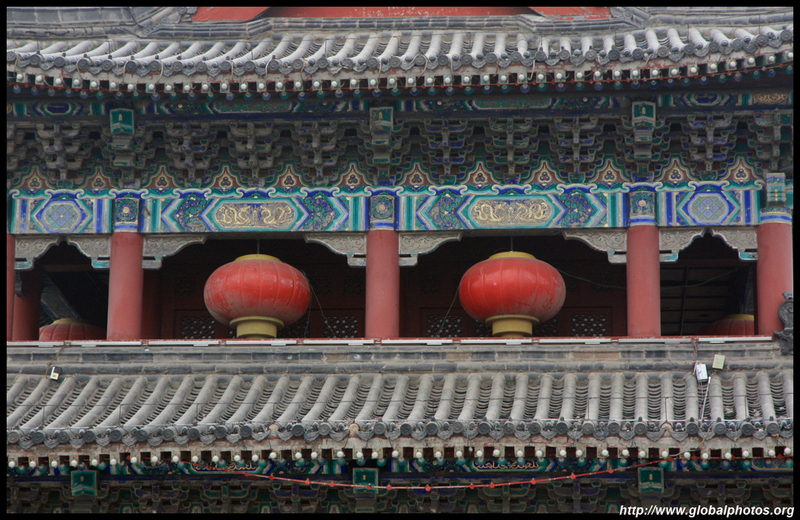 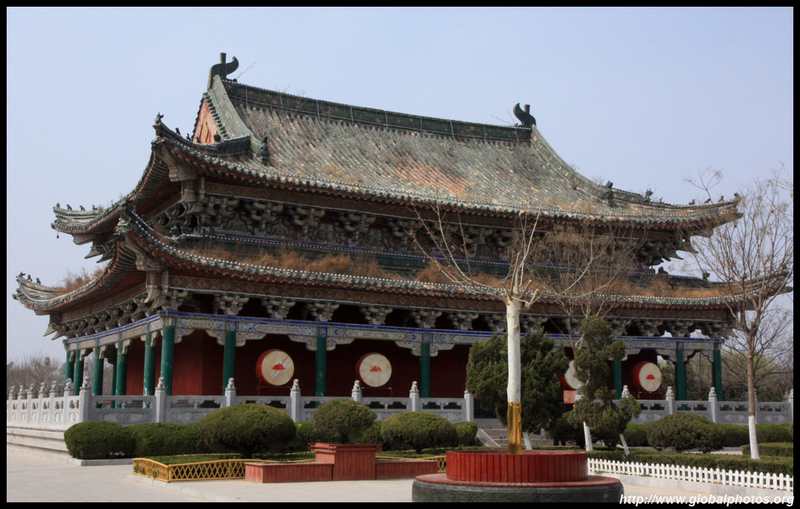 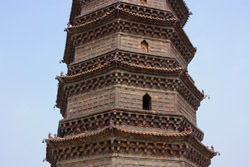 The Iron Pagoda is probably the only "real" historic monument worth a visit. 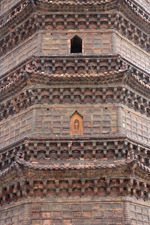 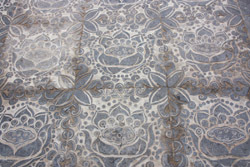 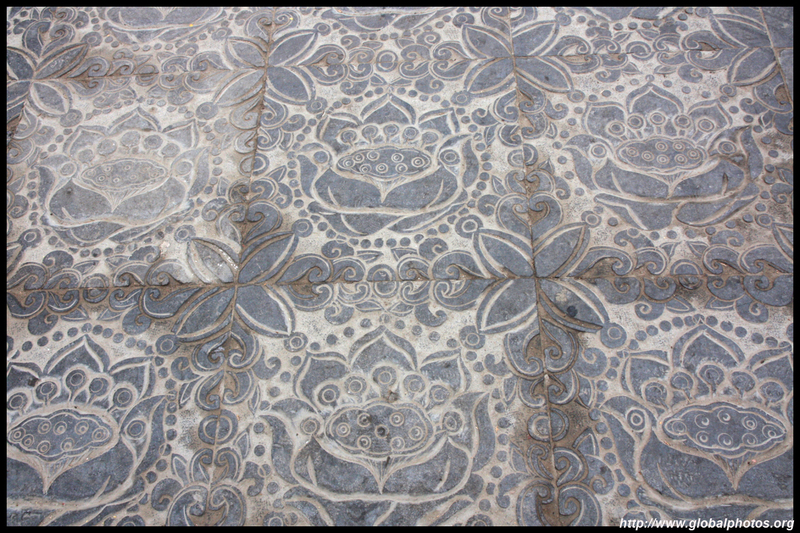 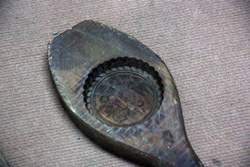 Built in the 11th century, it is coloured like iron, and not made of it. 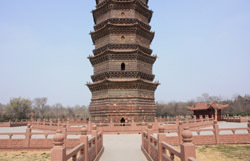 You need to make your way past some tacky tourist traps before reaching the actual structure. 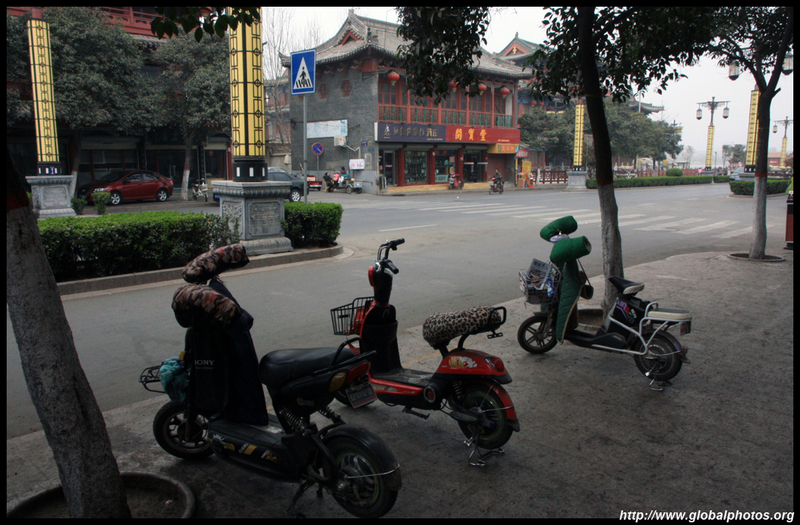 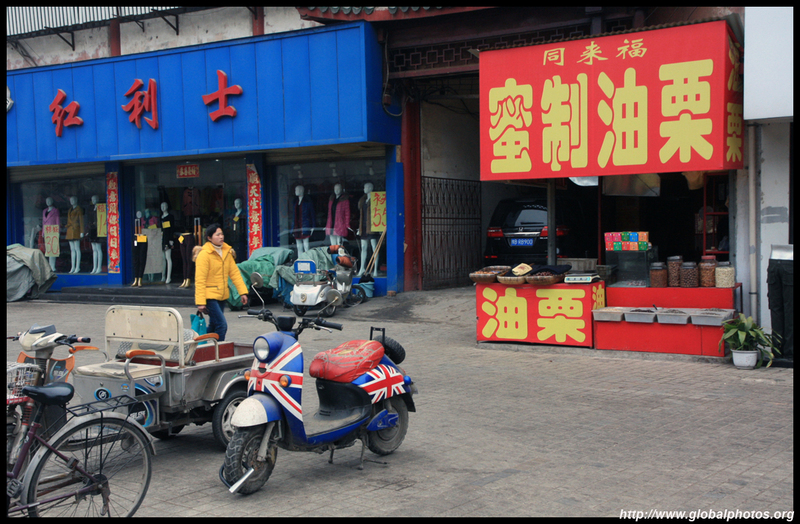 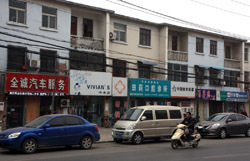 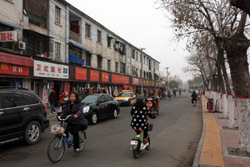 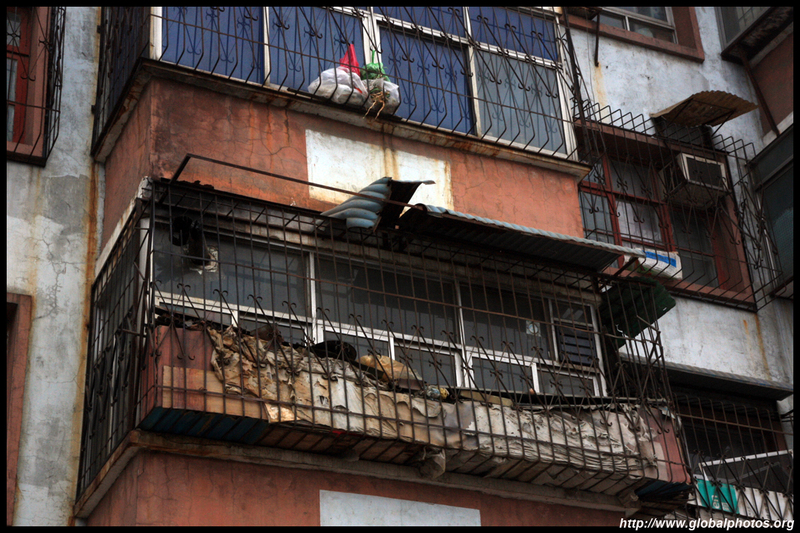 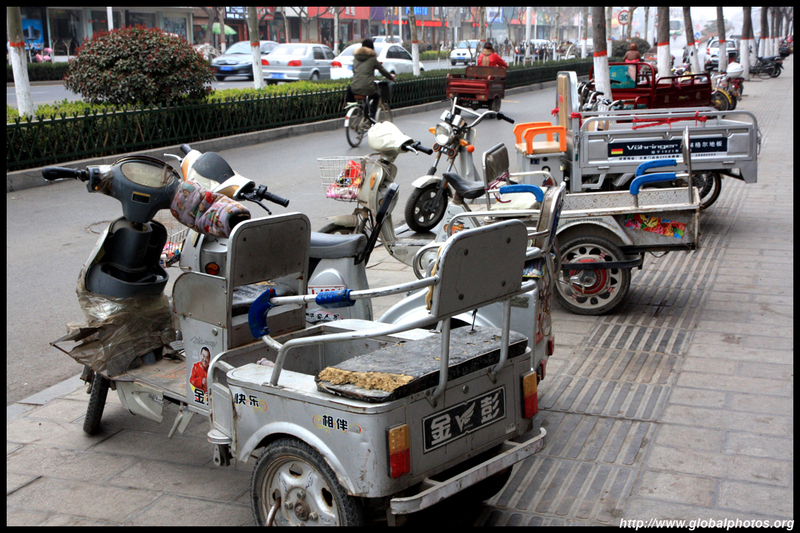 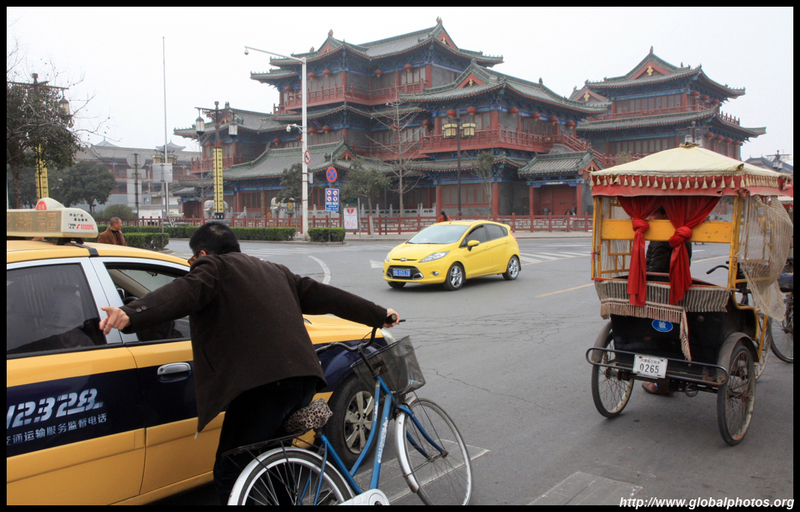 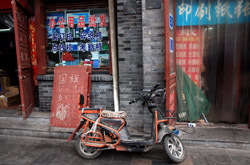 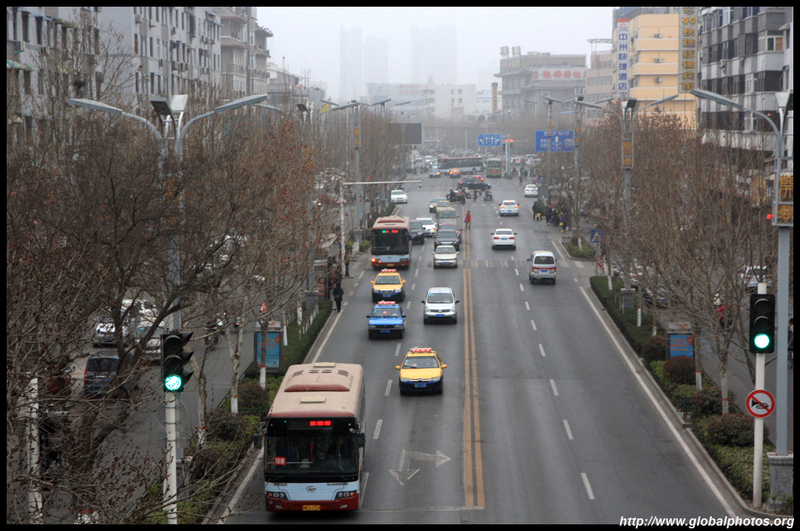 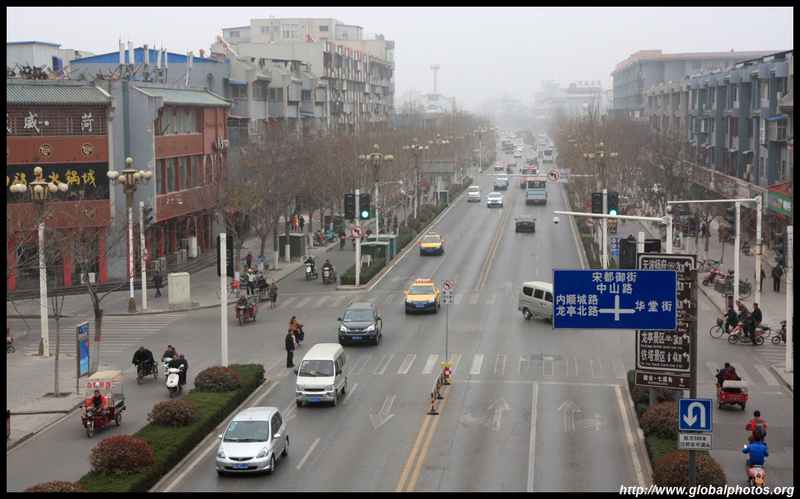 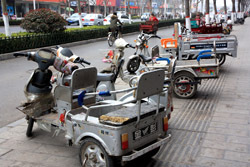 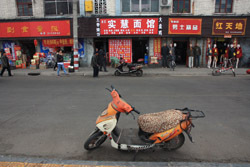 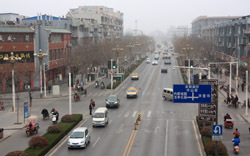 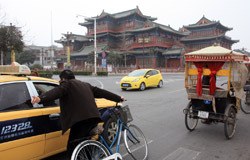 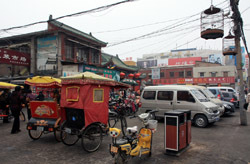 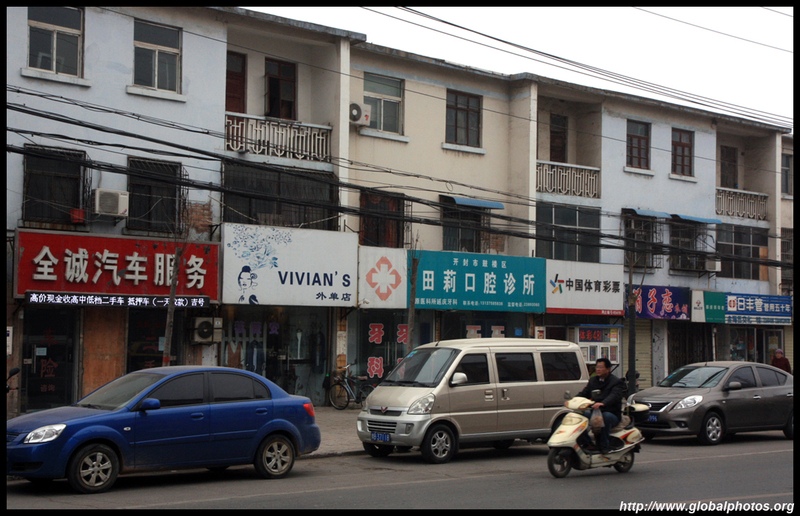 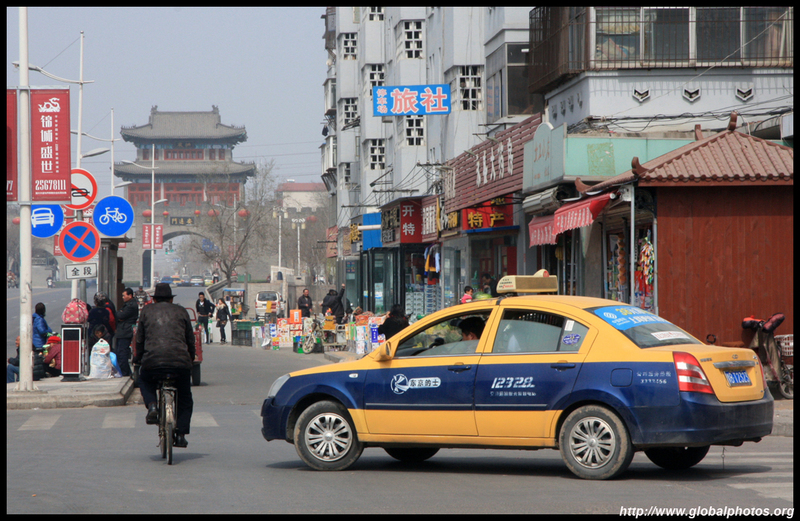 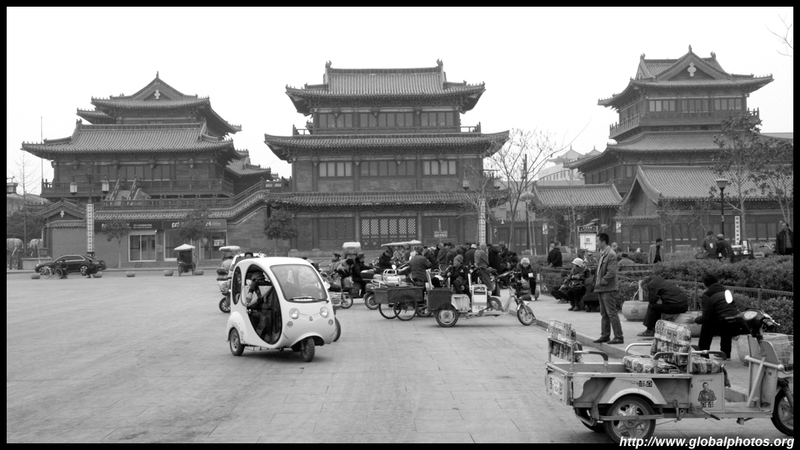 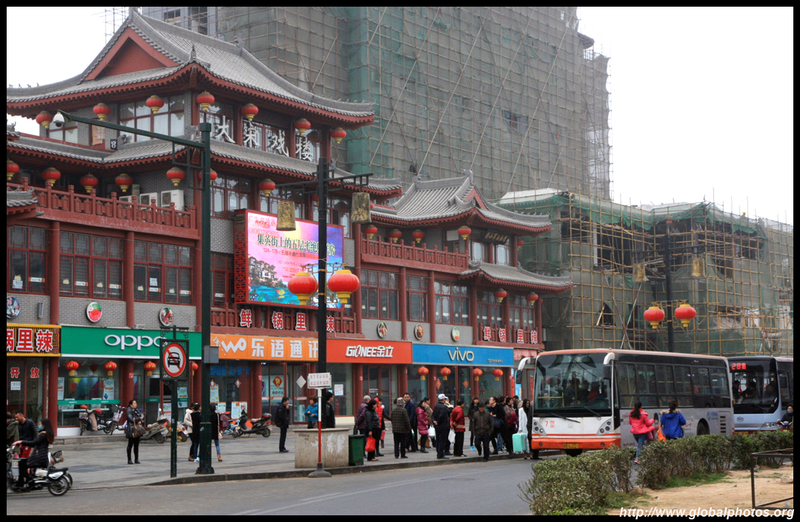 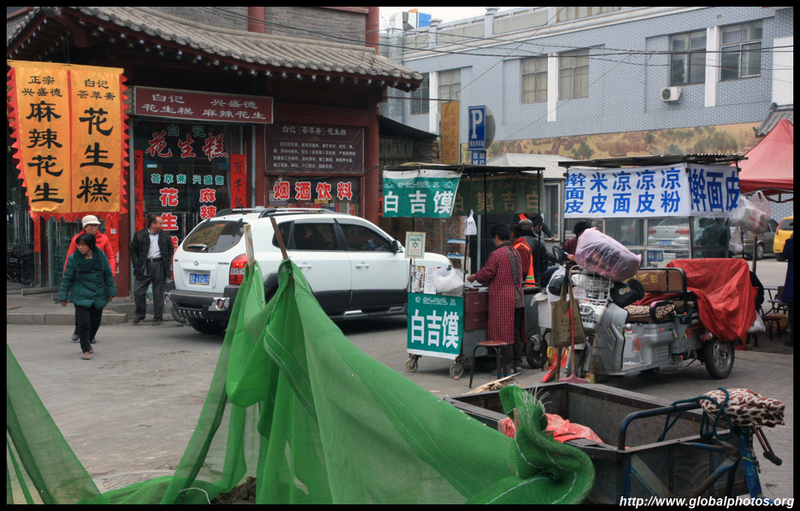 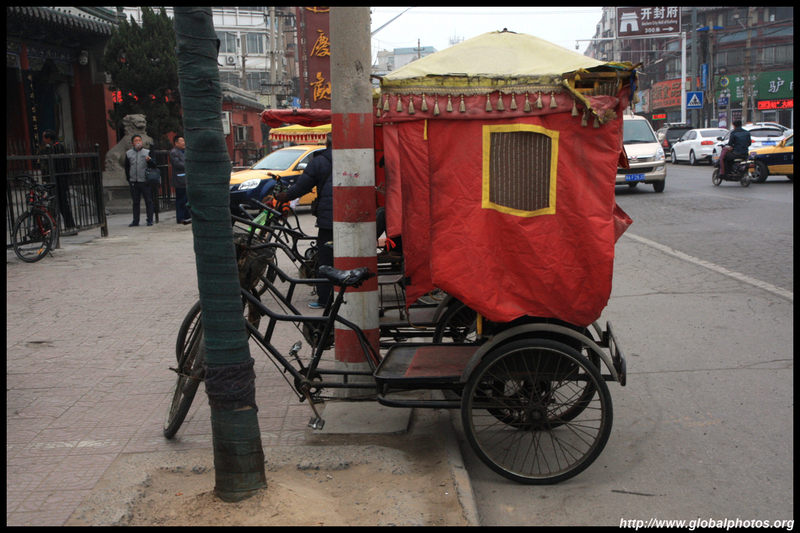 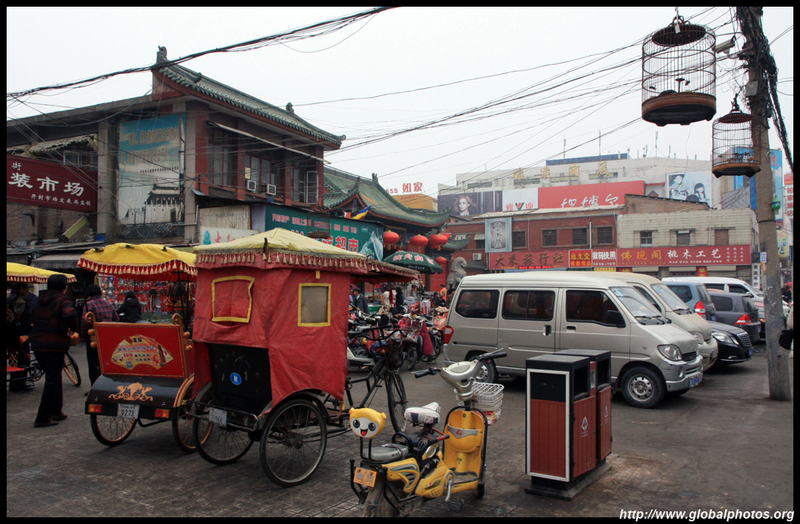 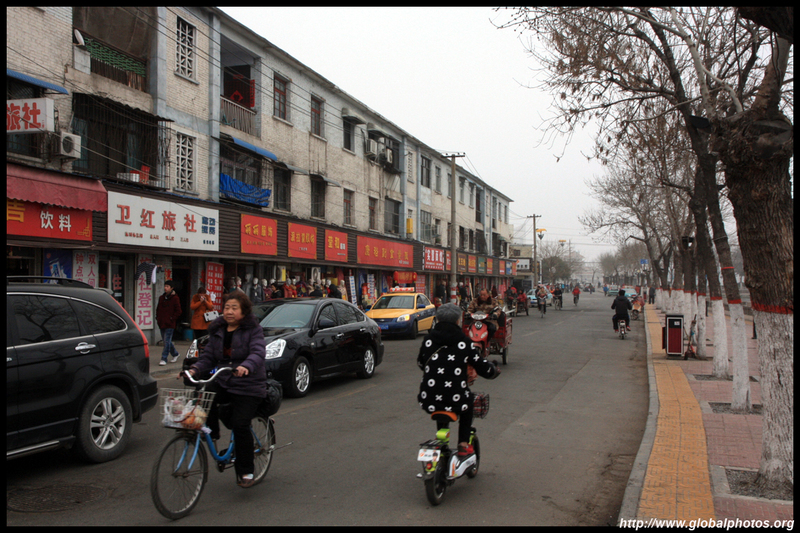 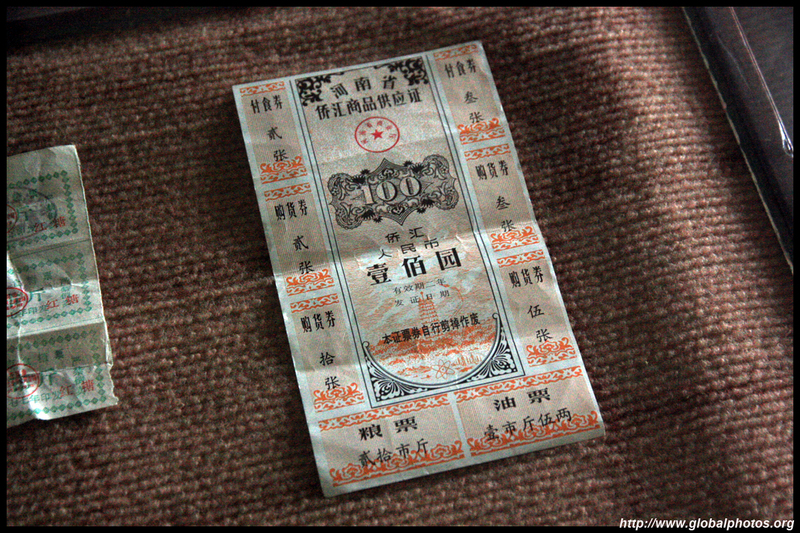 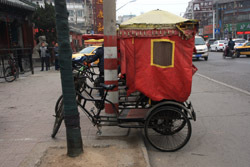 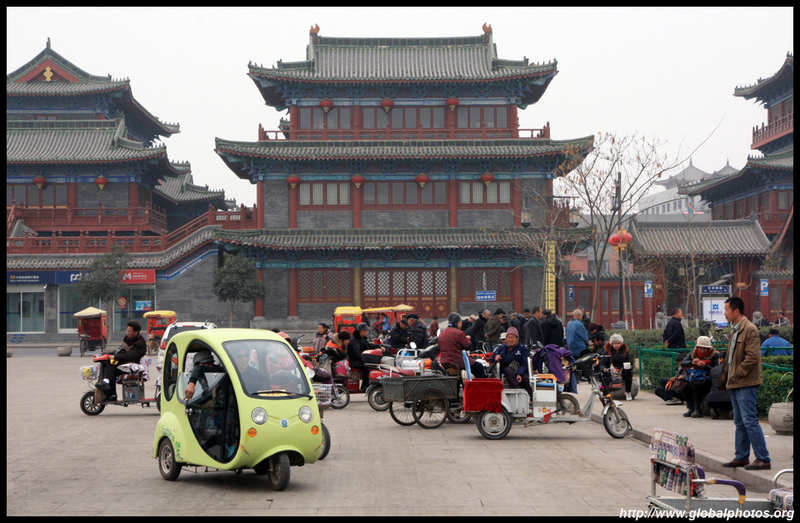 From here, taxi back to the high-speed train station for about 40 yuan. 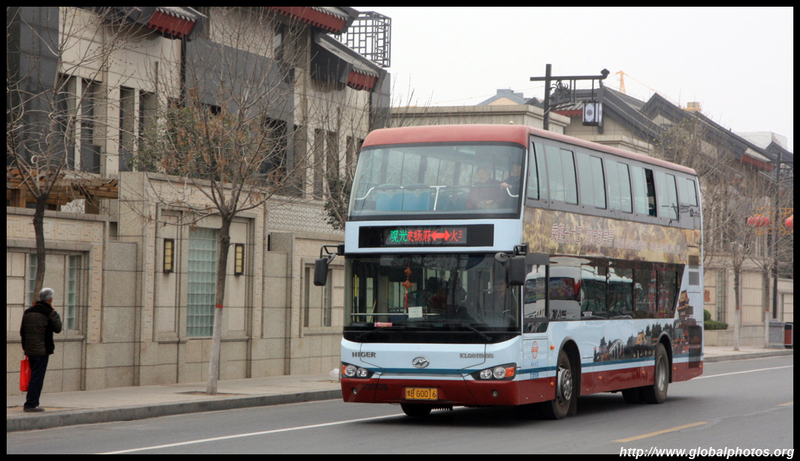 It is a long ride across town, and you will likely need to hop on and off and negotiate with a few drivers. 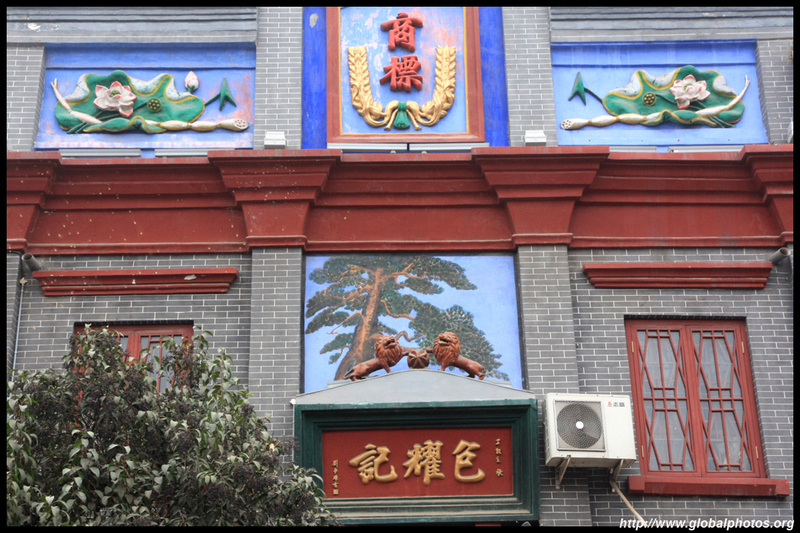 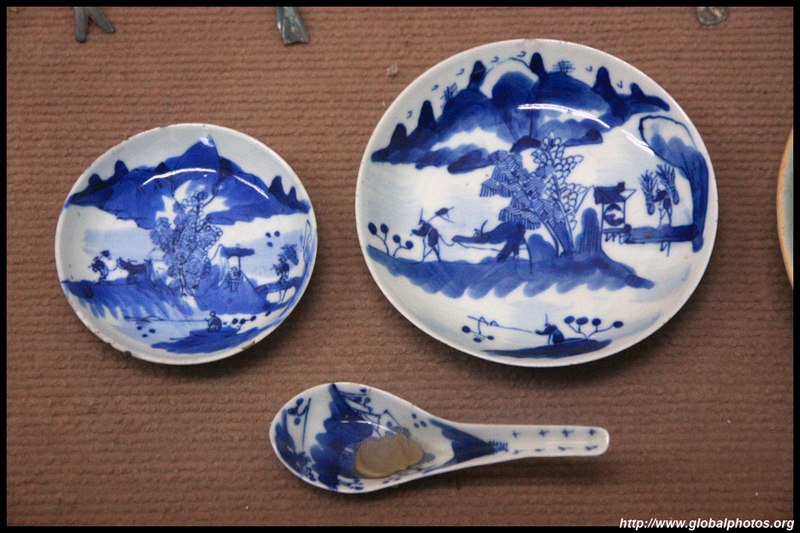 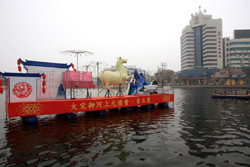 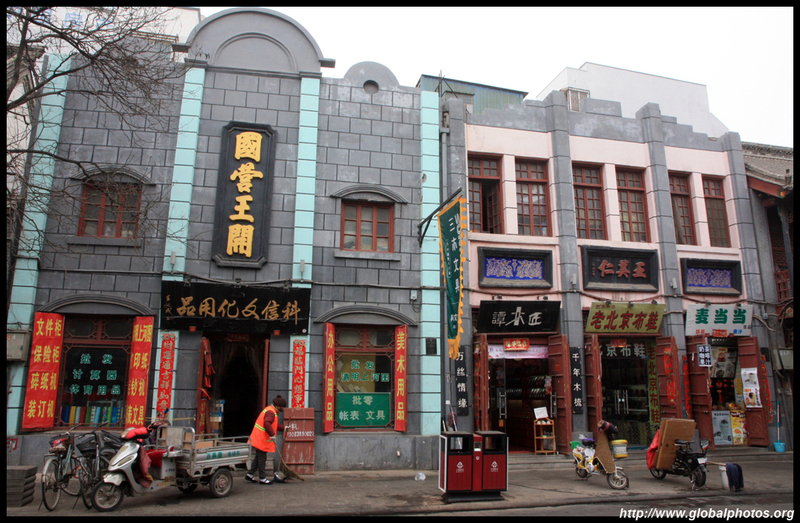 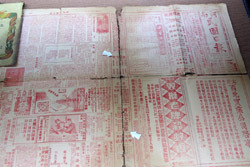 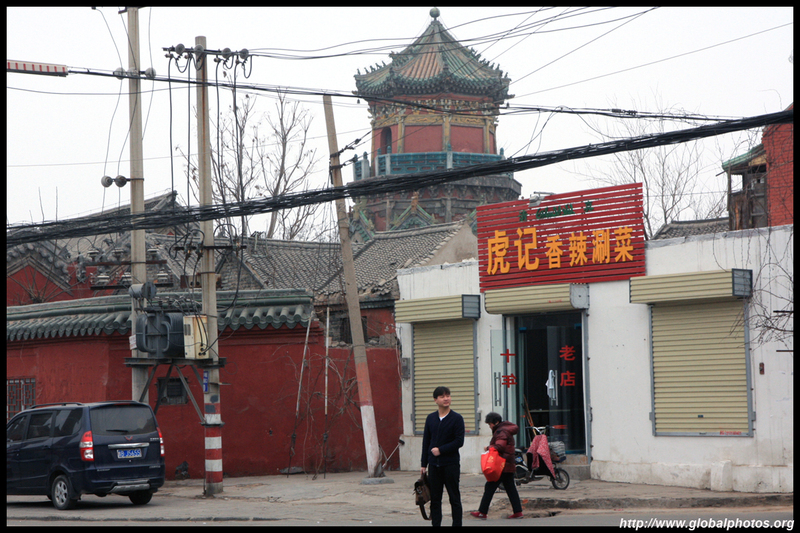 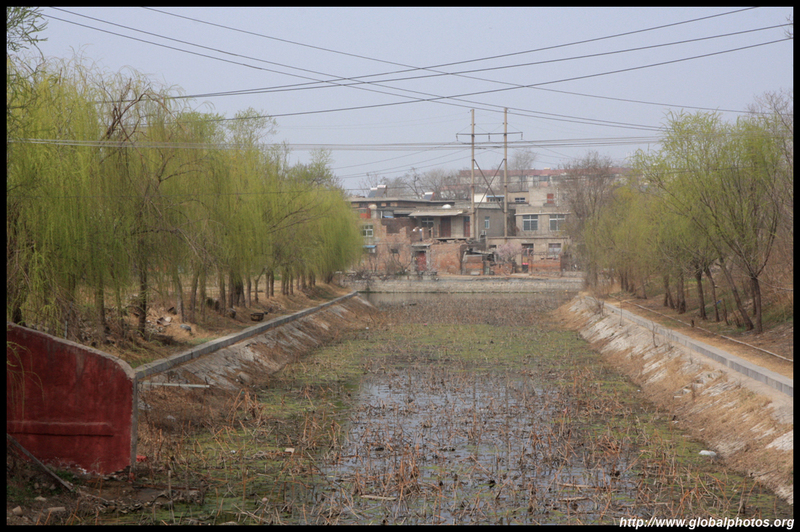 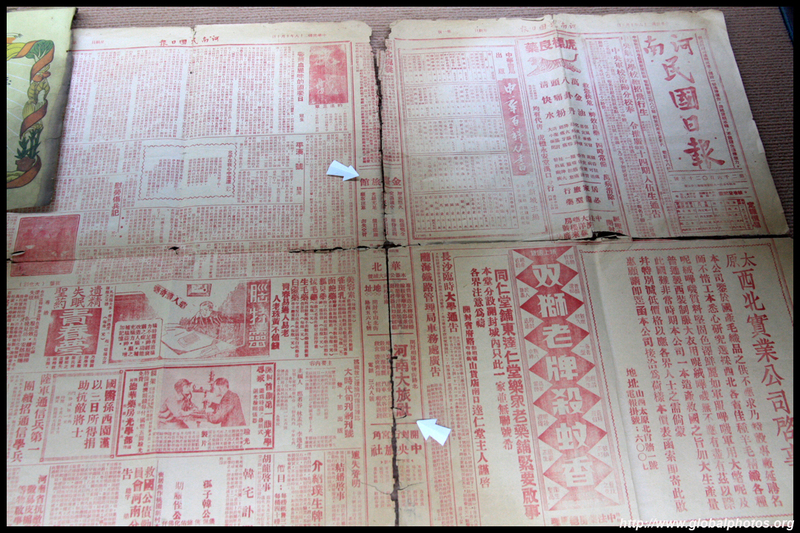 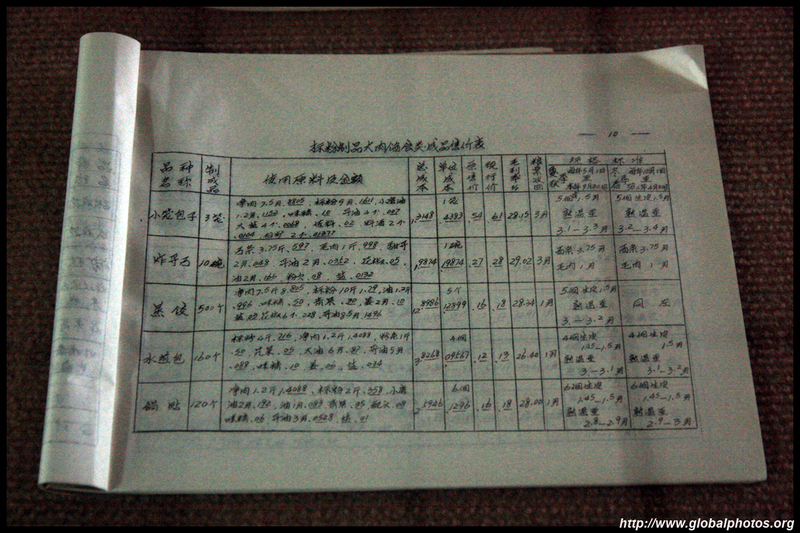 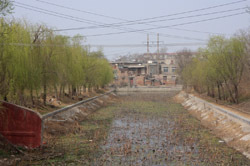 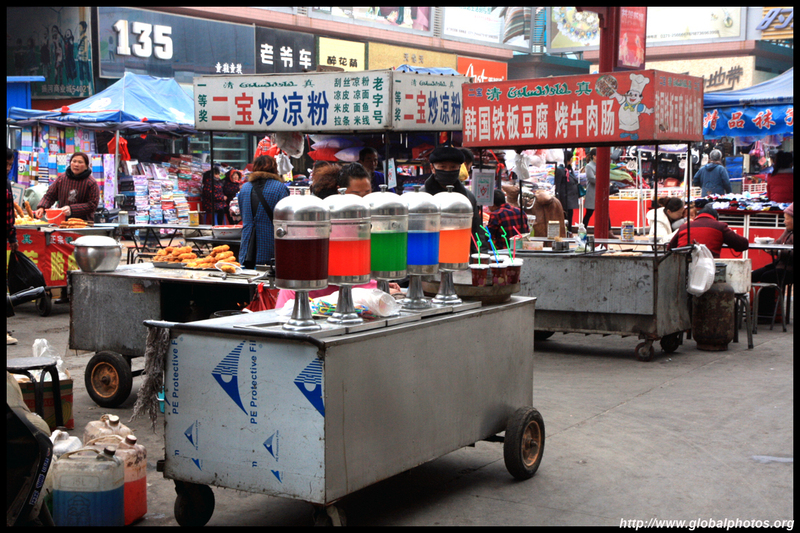 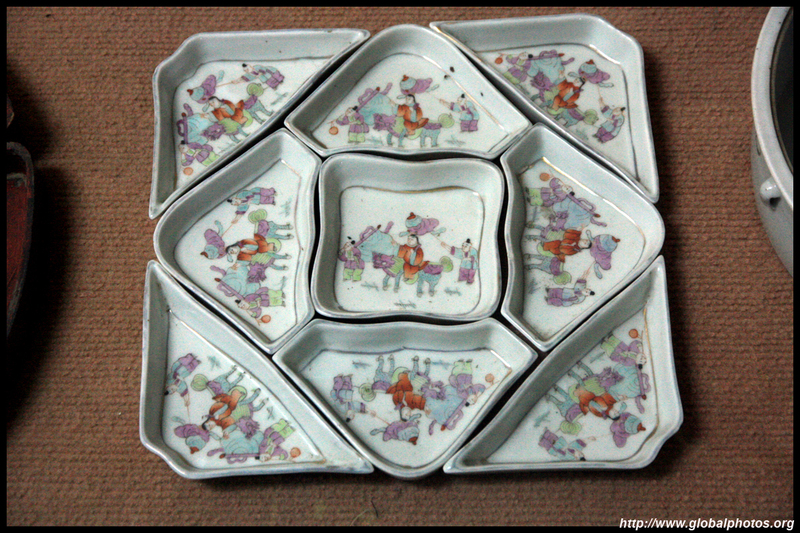 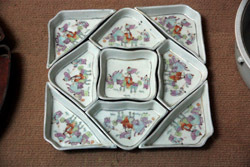 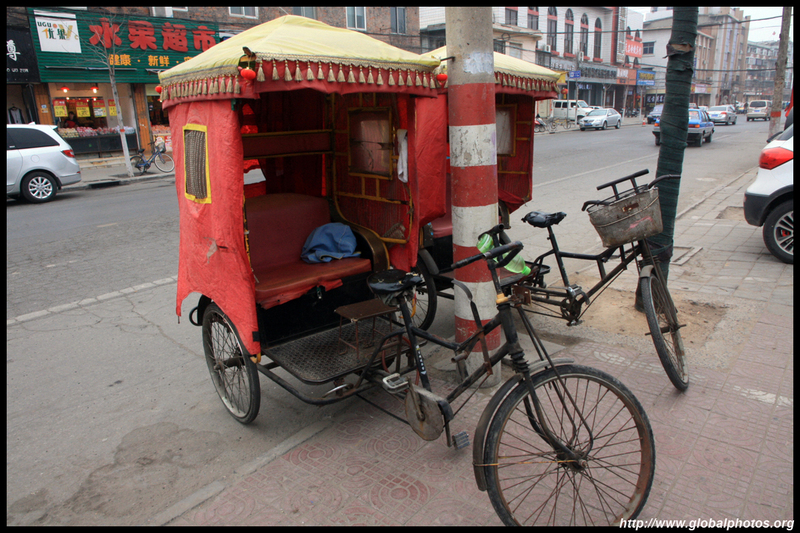 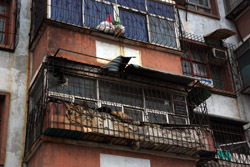 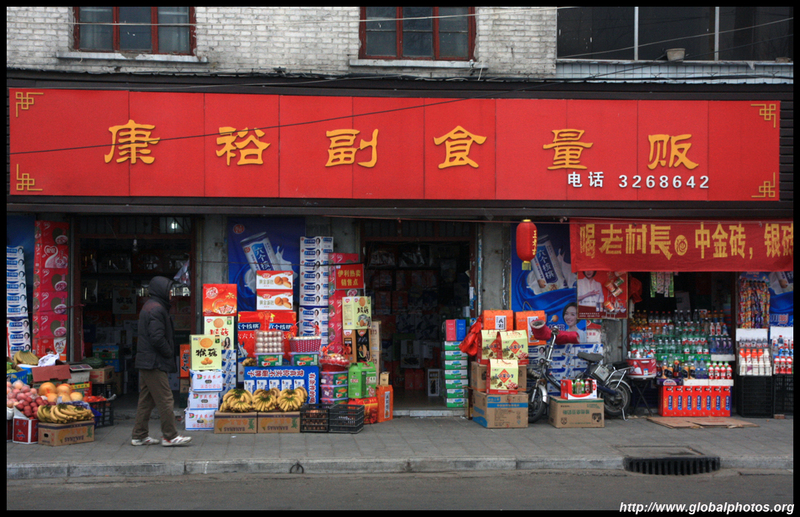 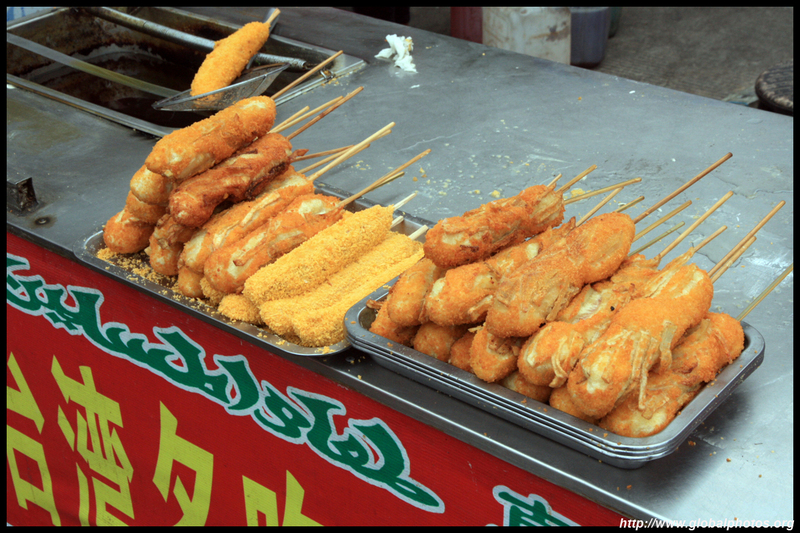 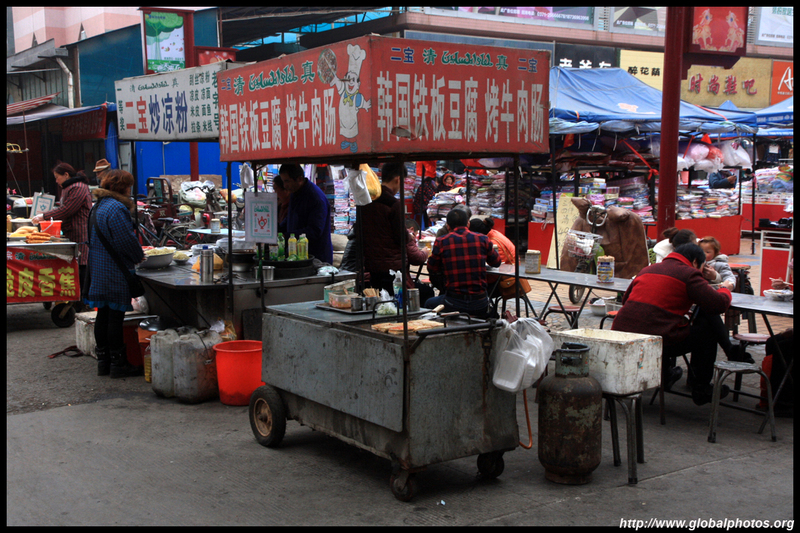 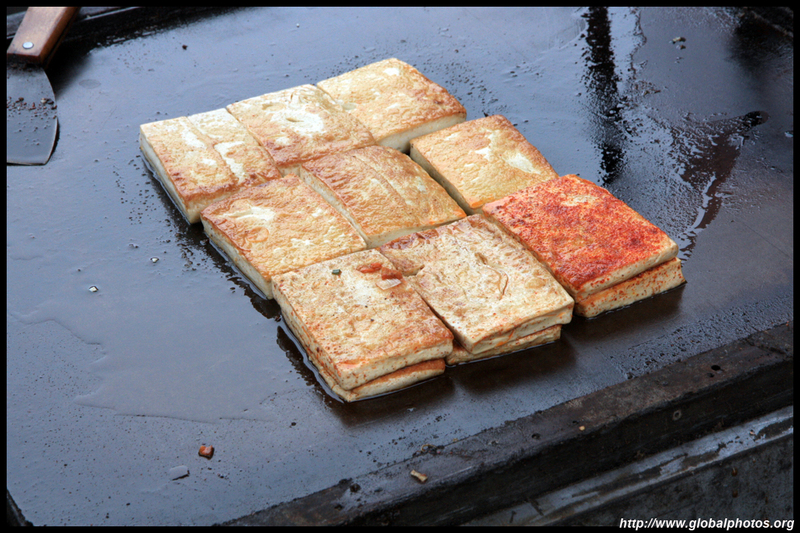 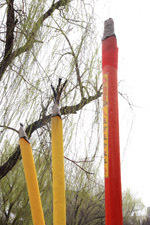 I actually wasn't impressed with what Kaifeng had to offer. 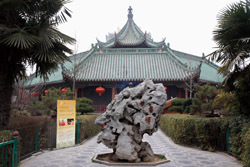 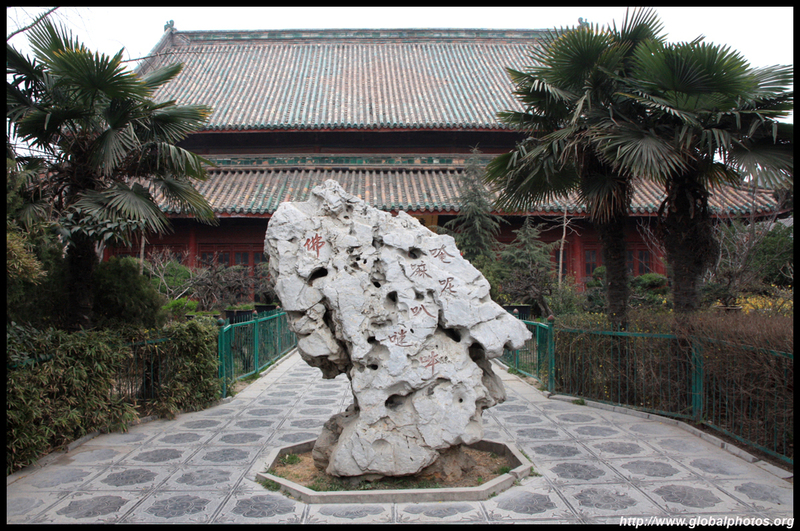 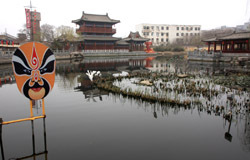 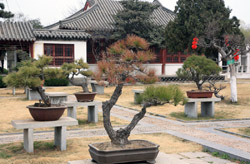 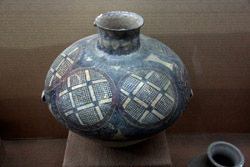 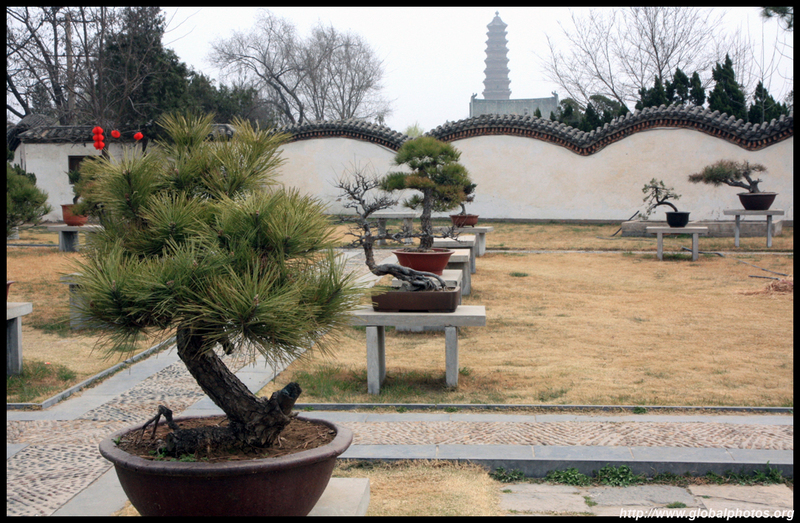 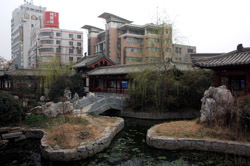 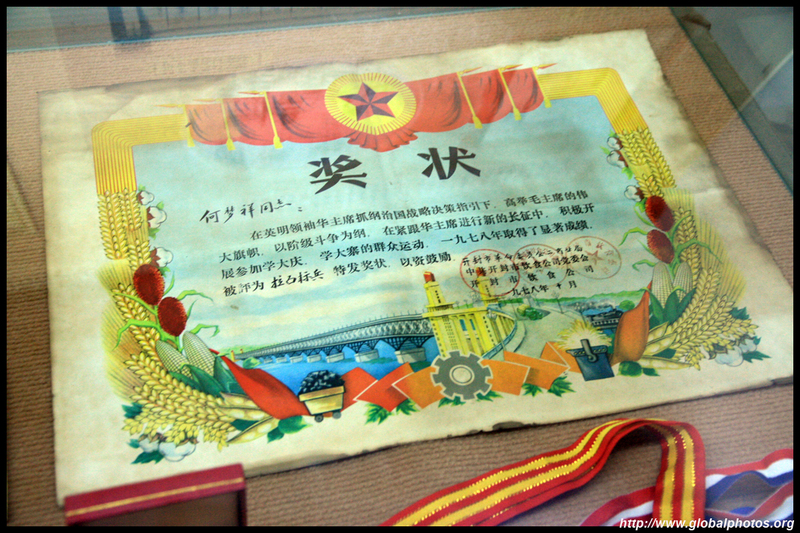 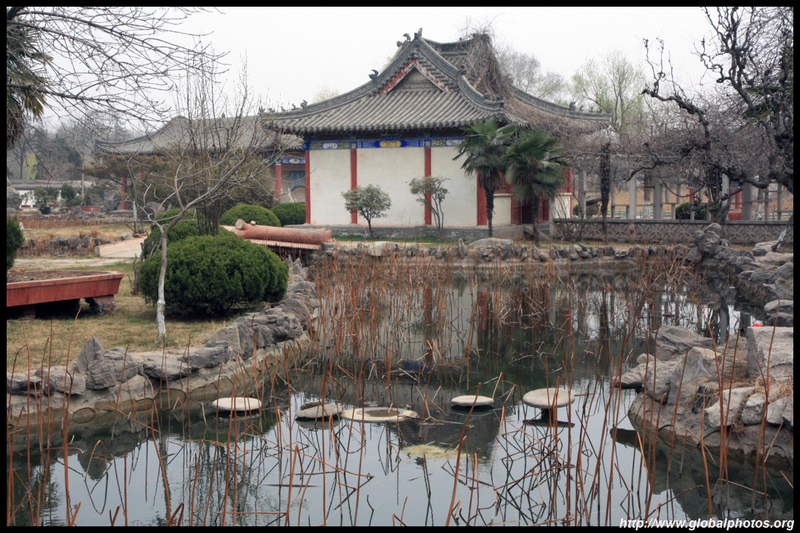 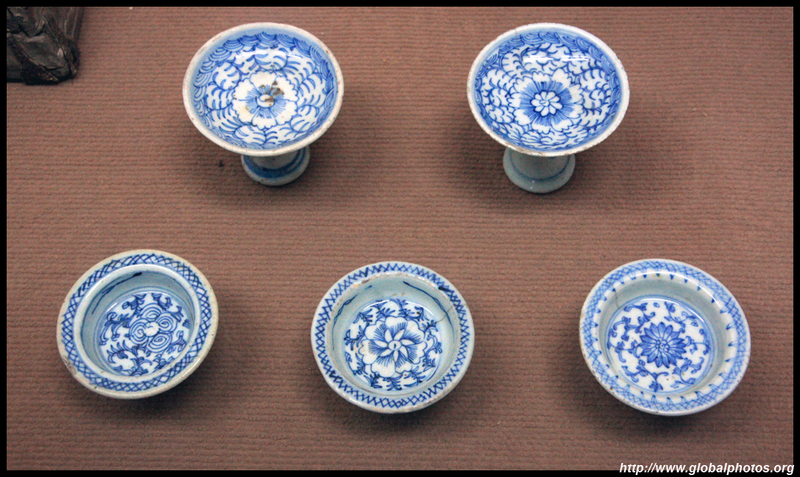 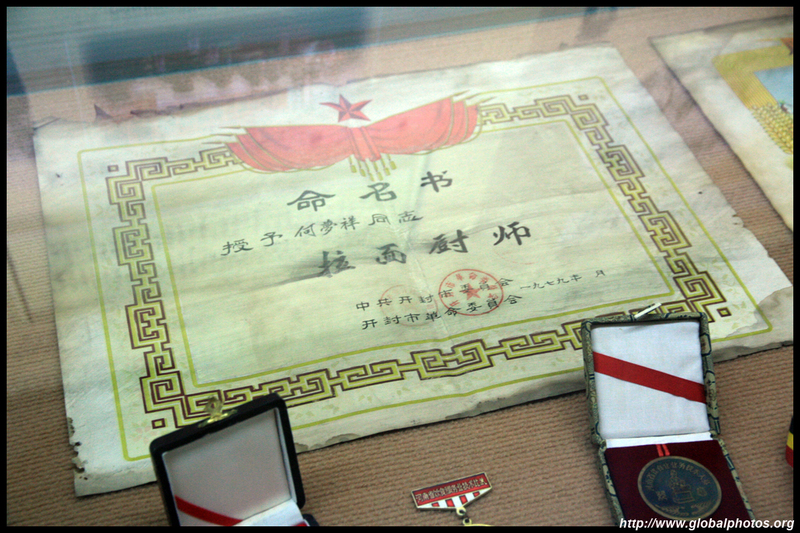 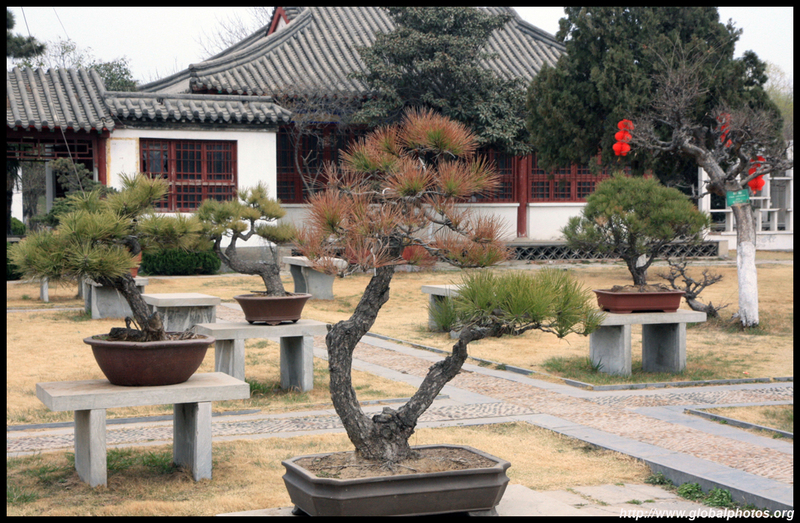 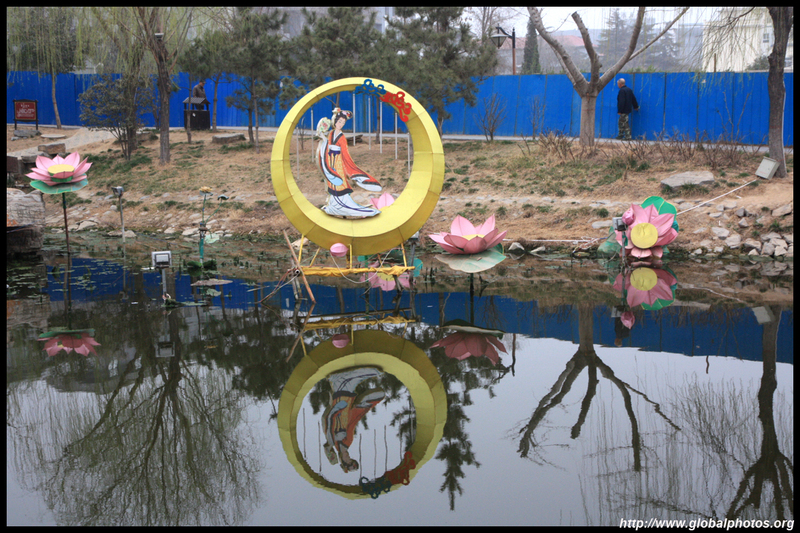 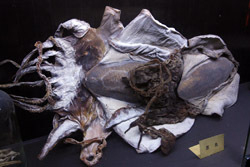 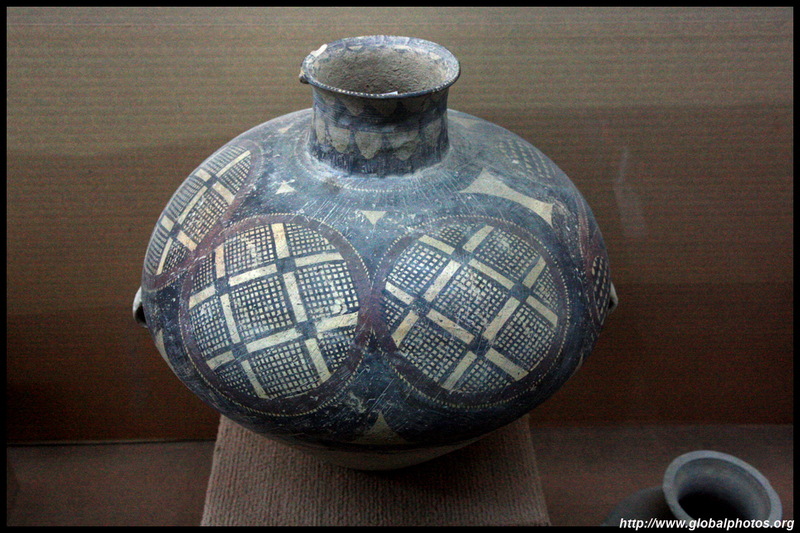 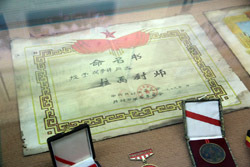 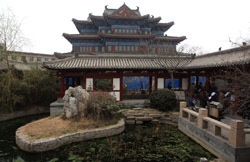 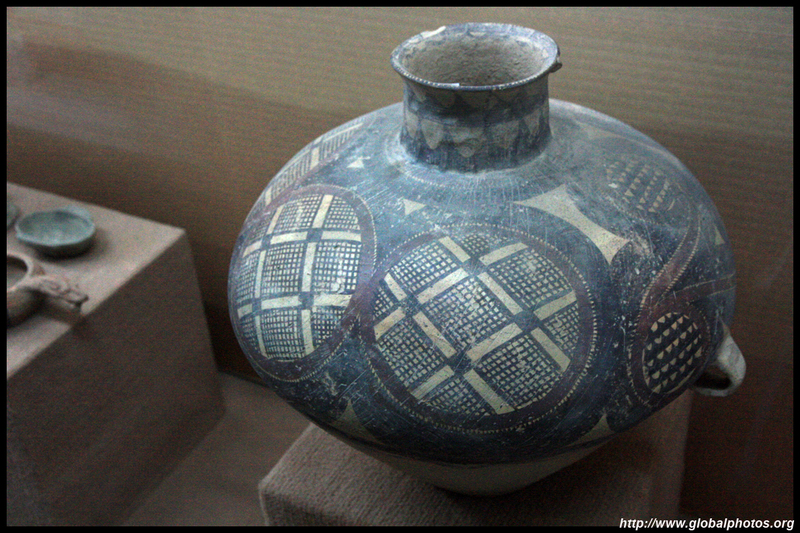 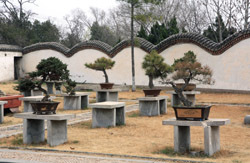 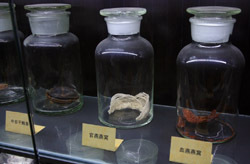 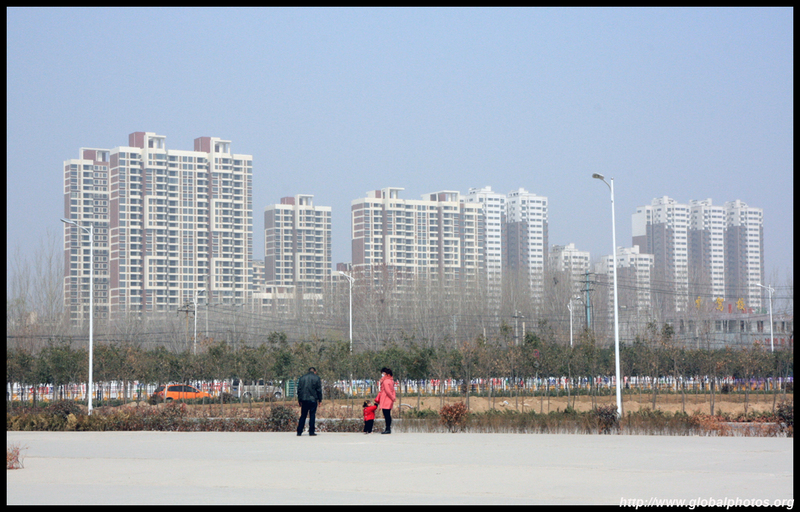 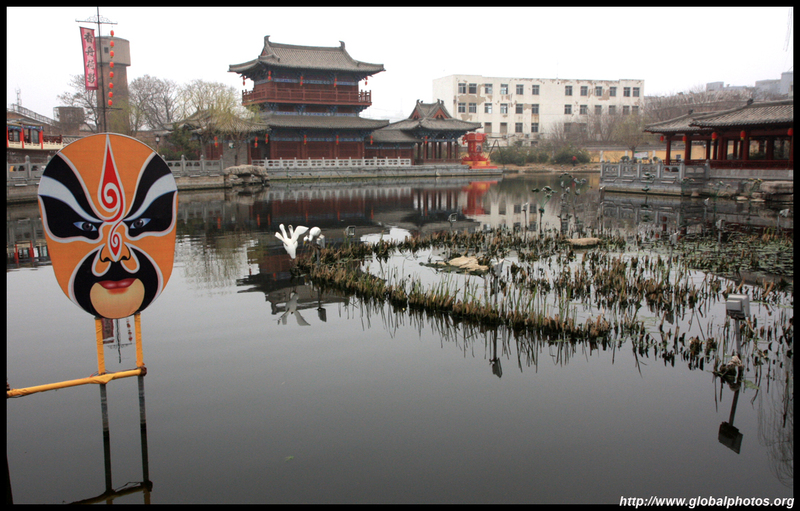 If you only have a few valuable days in the area, put Luoyang and Zhengzhou's Henan Museum on top of your list first.